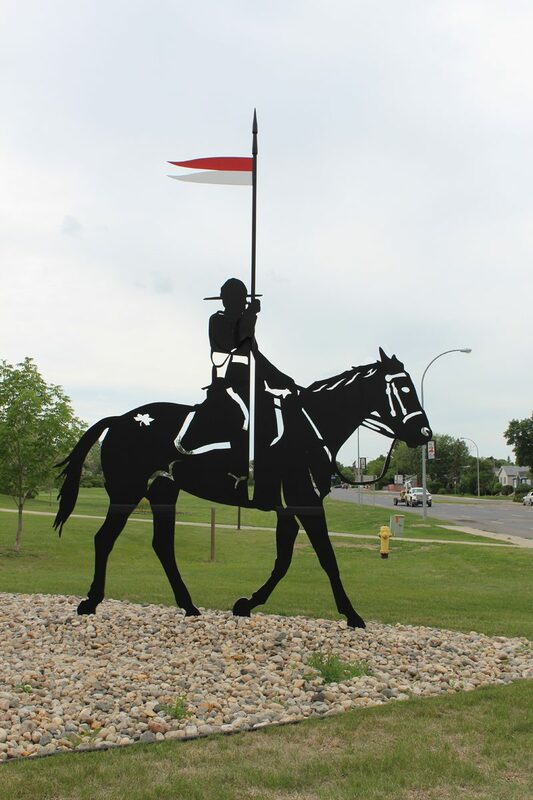 Besides being the capital of the province of Saskatchewan, Regina is also the home of the Royal Canadian Mounted Police Academy, also known as Depot Division. 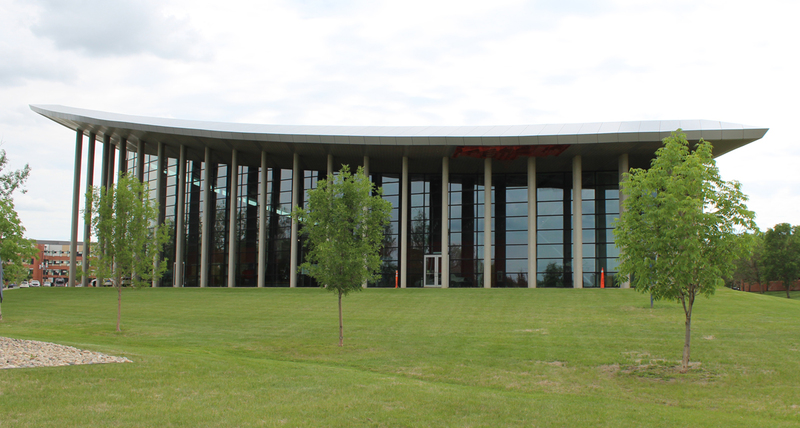 Every Mountie in Canada is trained at this facility which covers several acres. 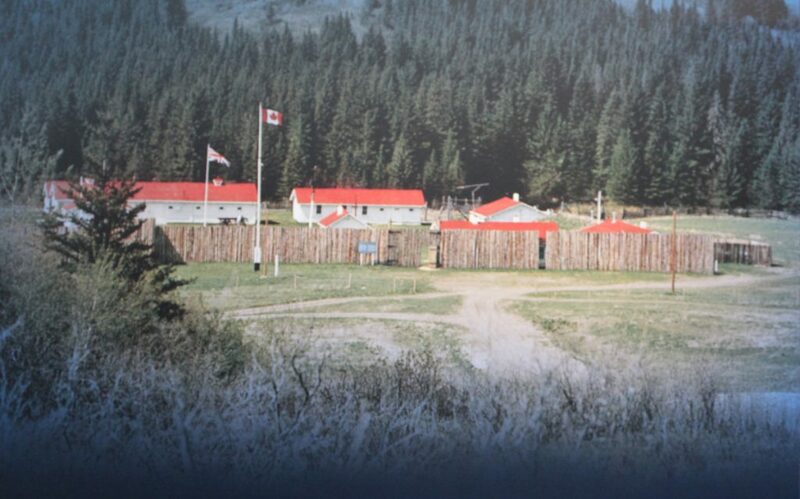 Mounties have been trained there since 1885 and the place is steeped in history. 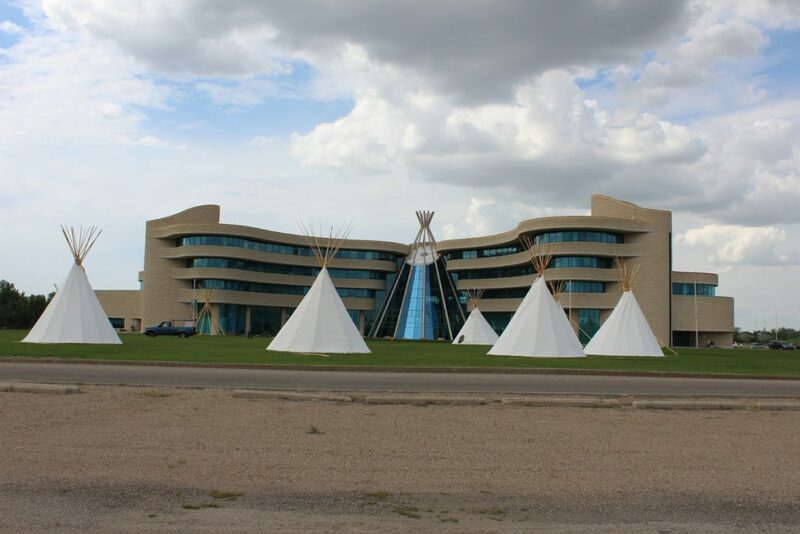 In 2007, the RCMP Heritage Centre was opened (shown at top). This 70,000 square foot building which sits on the front lawn of Depot Division was designed by noted architect Arthur Erickson. 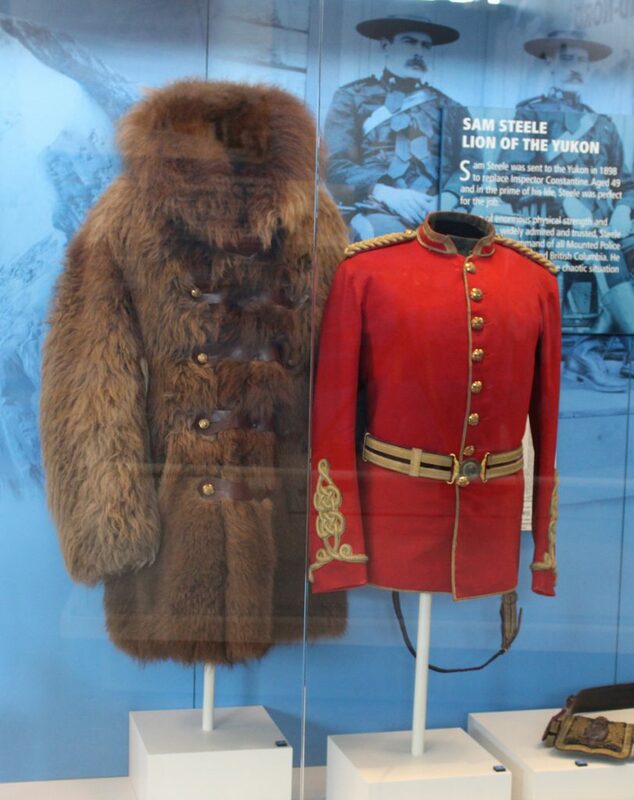 It is a museum featuring many artifacts relating to the history of the RCMP and the Canadian West. 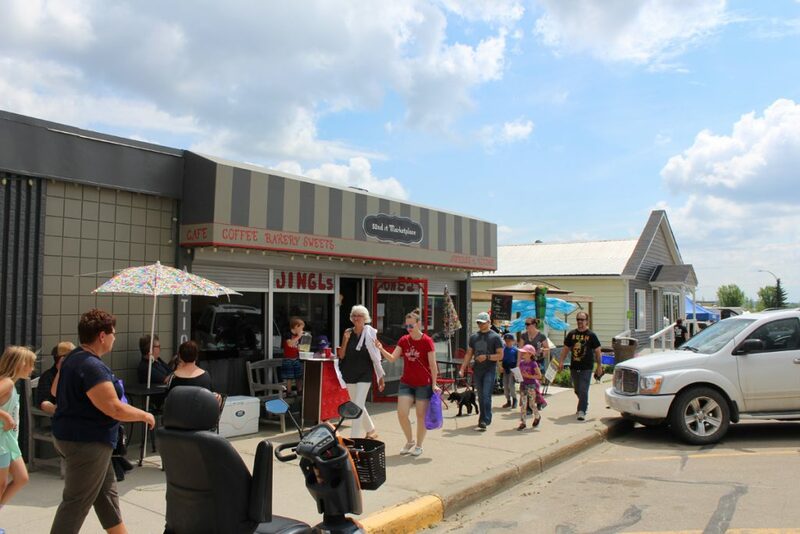 We visited the Centre, located on Dewdney Avenue on Regina’s west side, in June 2018. We were in town to visit our son who had just moved there. The three of us arrived around 11:30 AM and discovered we were in time to take in the Sergeant-Major’s Parade. The tram left at 12:15 so we registered and spent a half hour checking out the museum before departure. 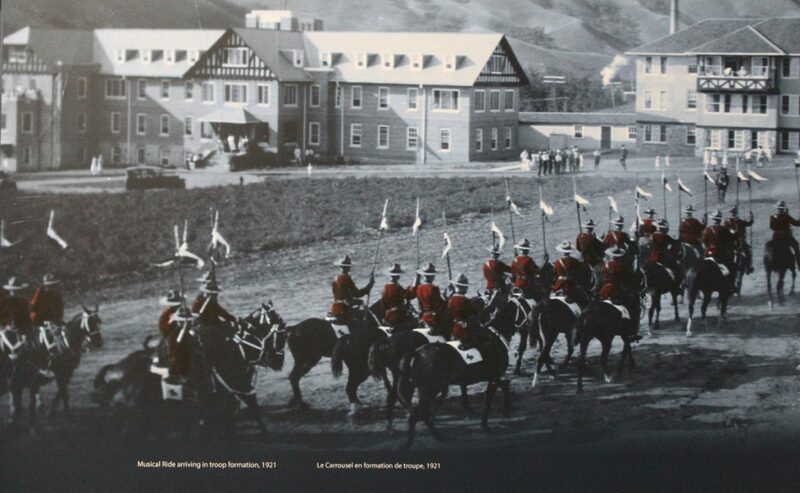 The Dufferin Building, home to RCMP recruits in training. The tram does a complete circuit of the training facility, giving you good idea of the size and scope of the place. We first passed the Dufferin Building where new Mountie recruits live during their six months sojourn at the academy. Later in the museum, we would see a mock-up of some of the barracks to see how these new recruits lived. 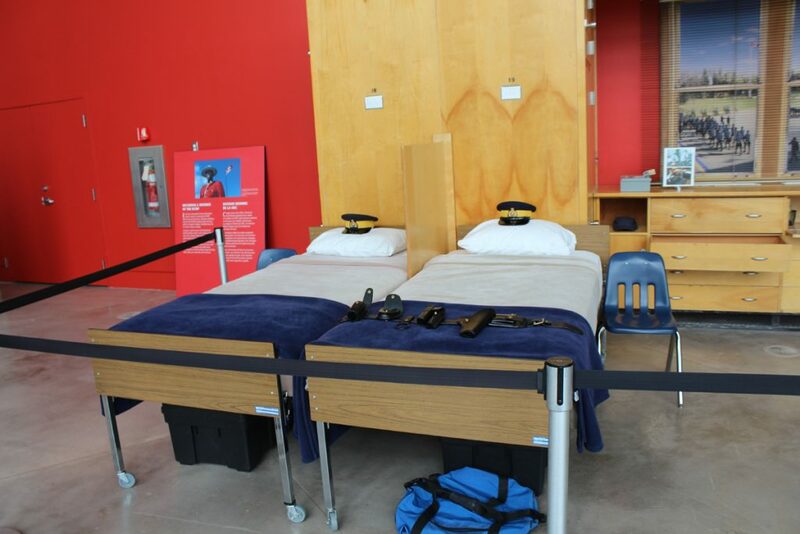 RCMP trainees live in barracks style dormitories. After a short while, the tram pulled up beside a very large drill ground. We all clambered out to wait for the Sergeant-Major’s Parade. This takes place five days a week from Monday through Friday at 12:30 PM. While waiting we checked out a Beechcraft dating from 1946 on display. The RCMP has used aircraft since 1937 as its mandate includes patrolling some of the more remote areas of Canada. This Beechcraft D18S Twin Beech saw service with the RCMP from 1946 to 1970. Then from our left, the parade started. This drill has the troops marching onto the parade ground and lining up for roll call and inspection. New recruits have to earn the right to wear the uniform and this right is granted in stages as they progress through training. New recruits, for example, wear running shoes instead of the dress black shoes of the uniform and they have to run rather than walk while on parade. Even the stripes on the Mounties pants have to be earned. The parade is led by a marching band made up of volunteers. The newer recruits bring up the rear. The video below shows the troops marching off the field after inspection. After the parade we checked out the chapel nearby. This is the oldest remaining building in Regina, built as a mess hall in 1883. It was converted into a canteen and reading room in 1889. 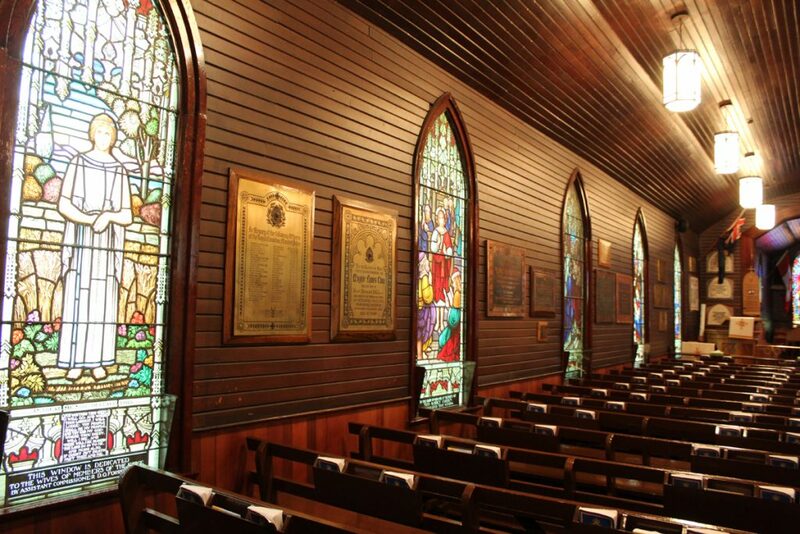 It was partially damaged by fire in March 1895 and reopened as a chapel in December that year. It was extended and had a steeple added in 1939. 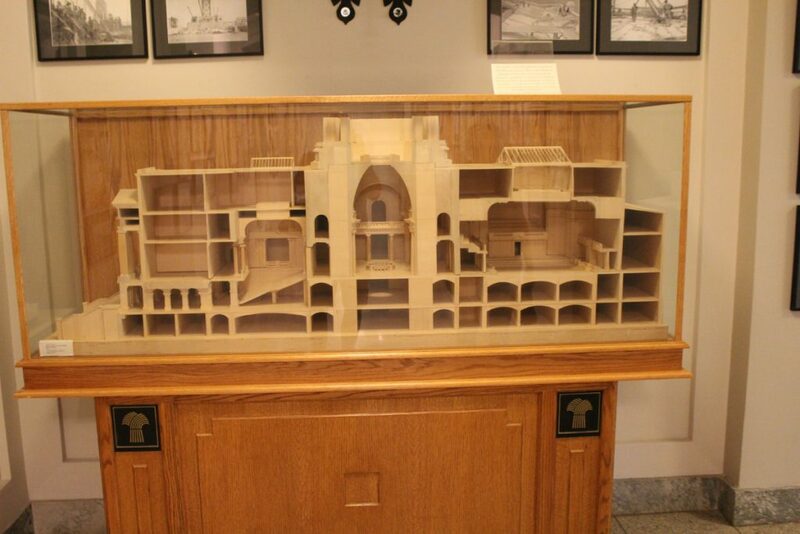 The interior is amazing – lush woodwork all around with stained glass windows along the sides and in the back. The windows in the back show two Mounties, one with head bowed mourning a fallen comrade, and the other playing reveille on a bugle. 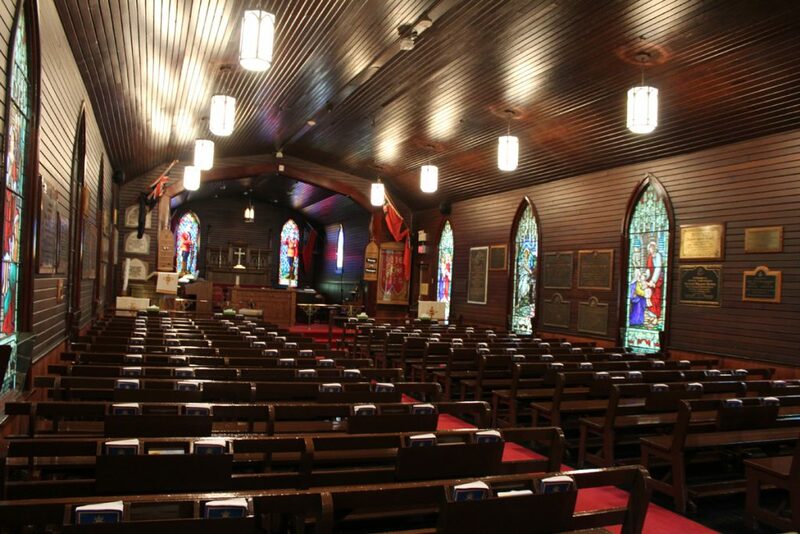 The interior of the chapel. 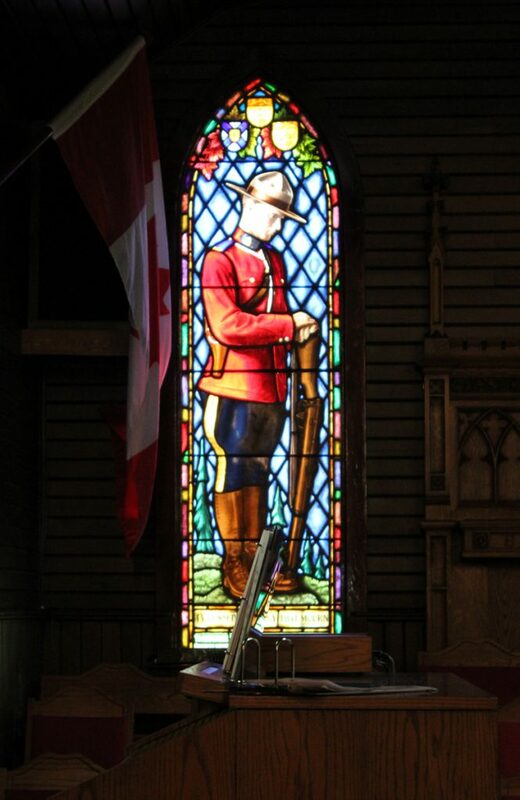 Stained glass window of a Mountie mourning a fallen fellow officer. Our guide told us that much of the work on extending the chapel was financed by a $30 million bequest from a wealthy British woman. 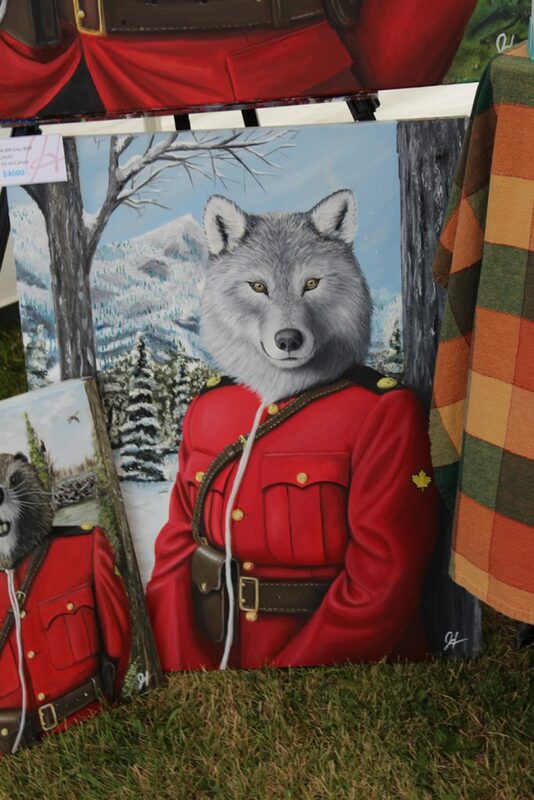 She had never been to Canada and never actually met a Mountie. 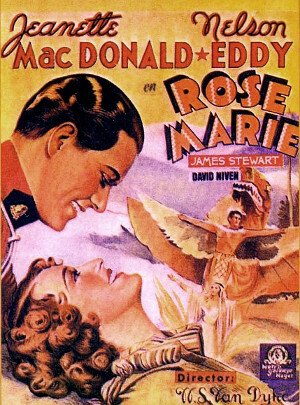 But she became enamored of the Mounties after seeing a Hollywood movie about them. We got back in the tram which toured us around the facility. We were asked not to take pictures of Mounties actually training. We did see one group practicing a take-down. 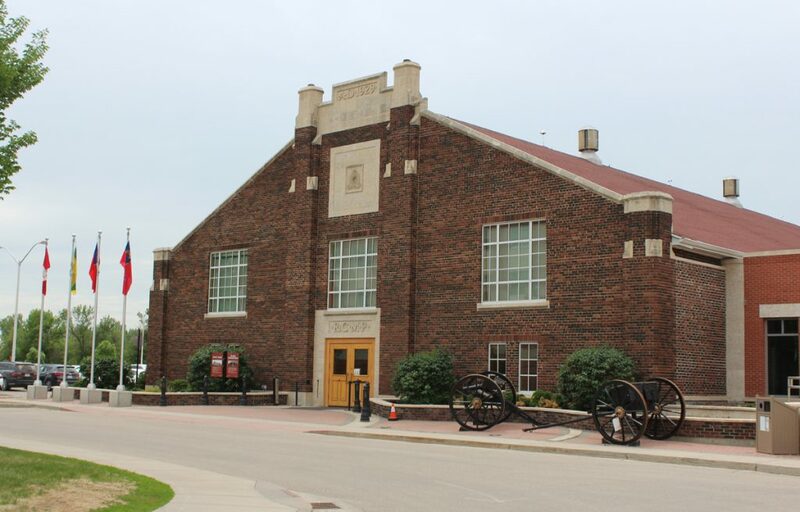 One of the classic old buildings is the Drill Hall. Built in 1929, it first served as a riding school. But horses were replaced by cars eventually and today the hall is used for foot drill and crowd control training. 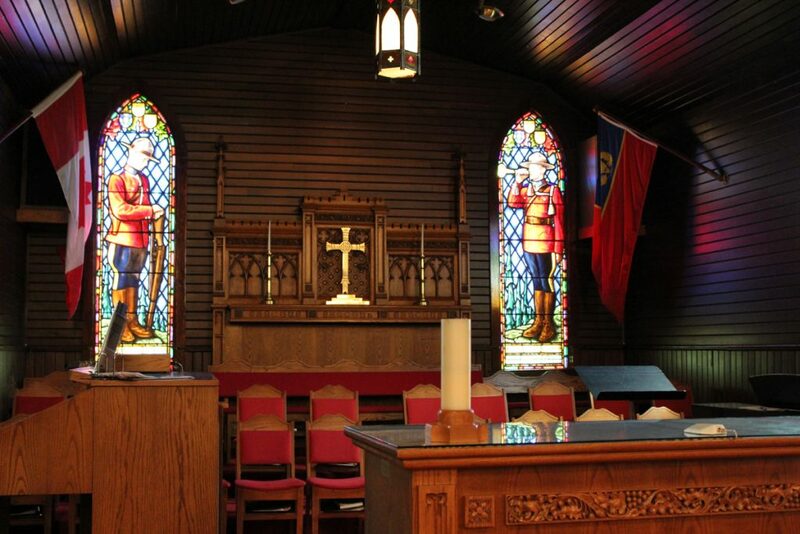 It also hosts the Mountie Graduation ceremonies and the occasional Regimental Ball. We passed a shooting range and a driver training track as well. 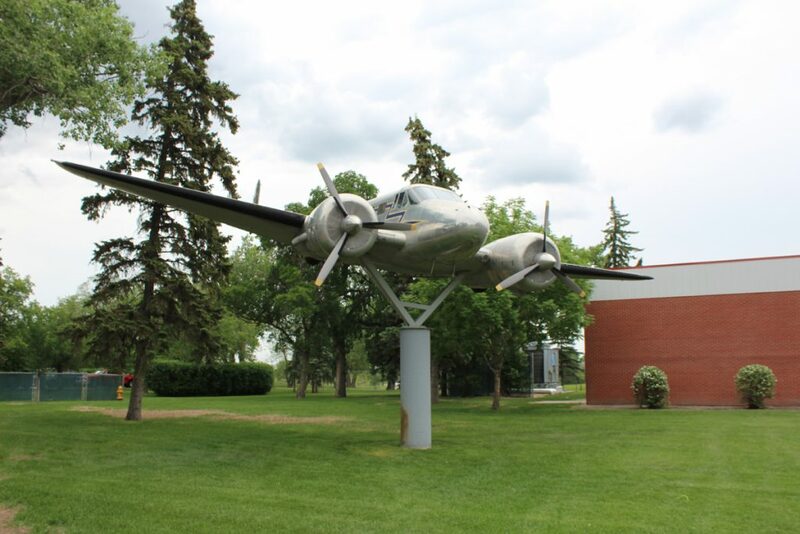 Our trip brought us back to the Heritage Centre where we continued our tour. Saskatchewan became a province in 1905. Before that it was part of the Northwest Territories. 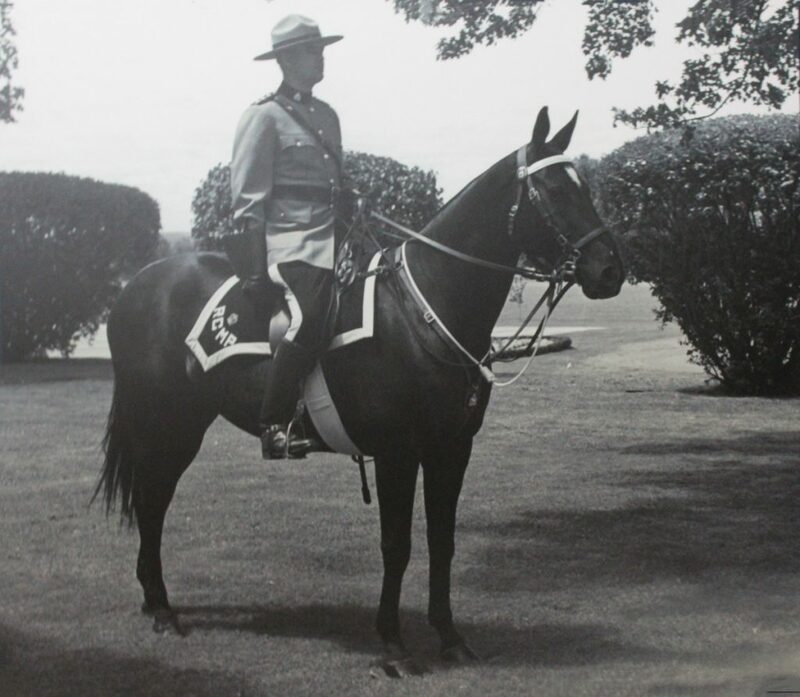 The Mounties originated as the Royal Northwest Mounted Police. Recently the rather left-wing mayor of Victoria, British Columbia decided to remove a statue of Canada’s first Prime Minister, Sir John A. Macdonald, from in front of city hall. She argued that Macdonald was the architect of Canada’s residential school system for indigenous children, a system that continued until 1996. The residential schools have been widely condemned for separating native children from their parents and for abuses. 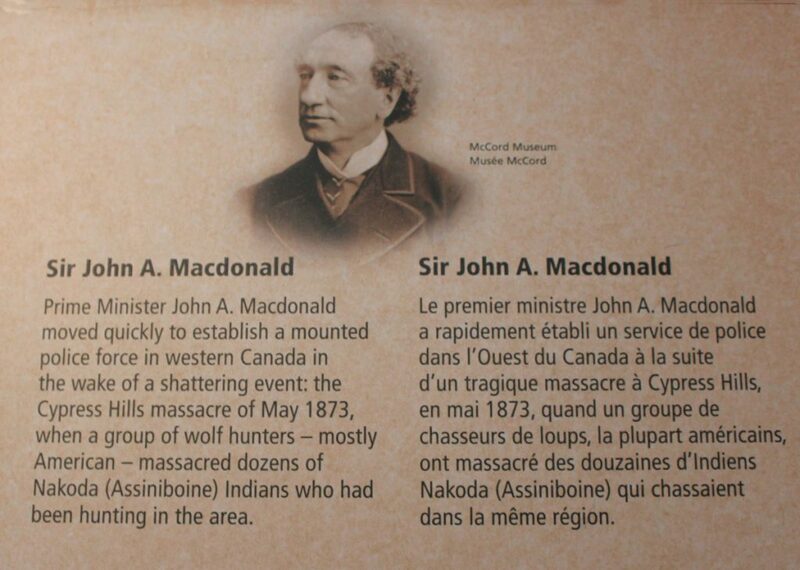 There are, however, two sides to Macdonald. 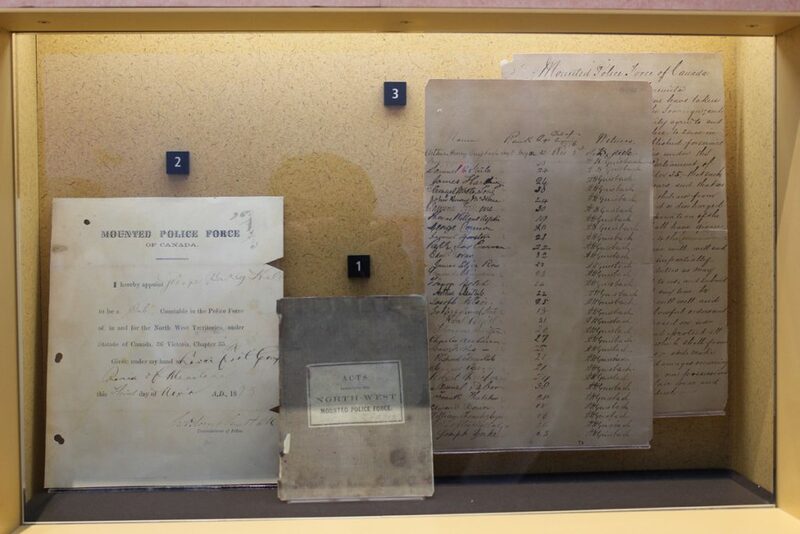 The museum notes that the Royal Northwest Mounted Police was established by Macdonald as a response to a massacre of native Indians by white hunters. 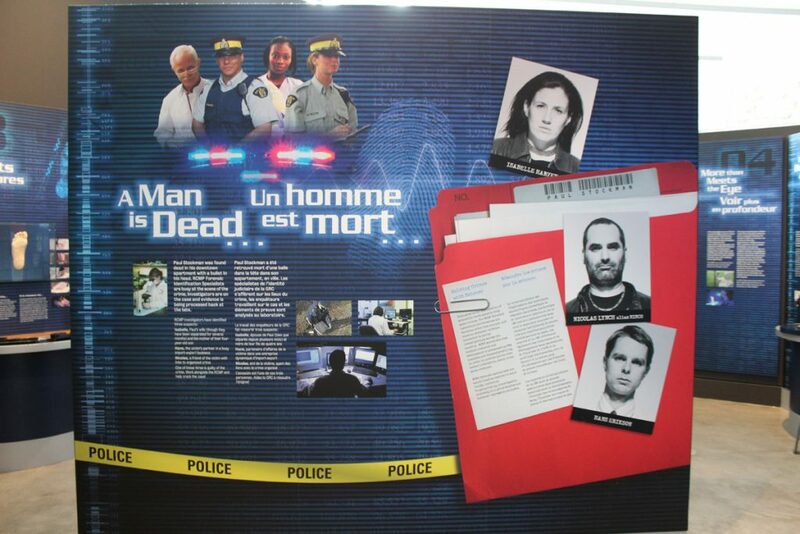 An information poster tells how and why the Mounties were created. The Mounties were patterned after the Royal Irish Constabulary and one of its mandates was to foster friendly relations with indigenous peoples. 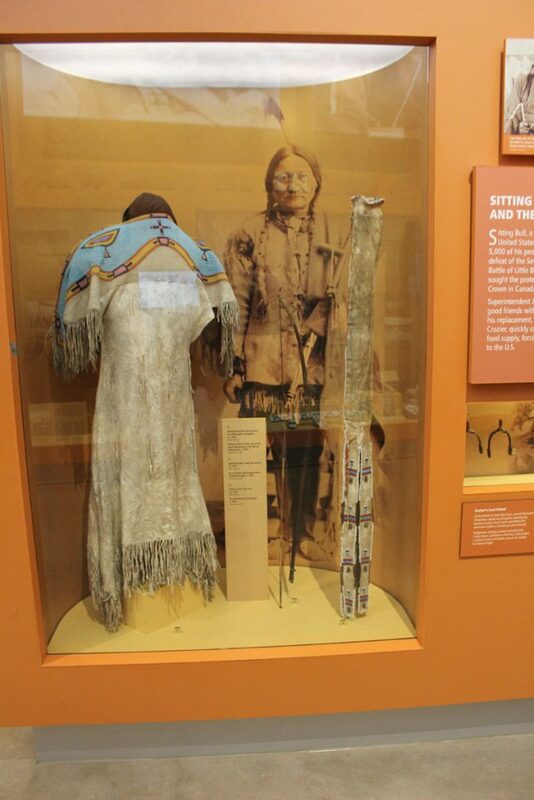 After the Battle of the Little Bighorn in 1876, Chief Sitting Bull and 5000 of his Lakota tribesmen fled to Canada seeking the protection of the British crown. 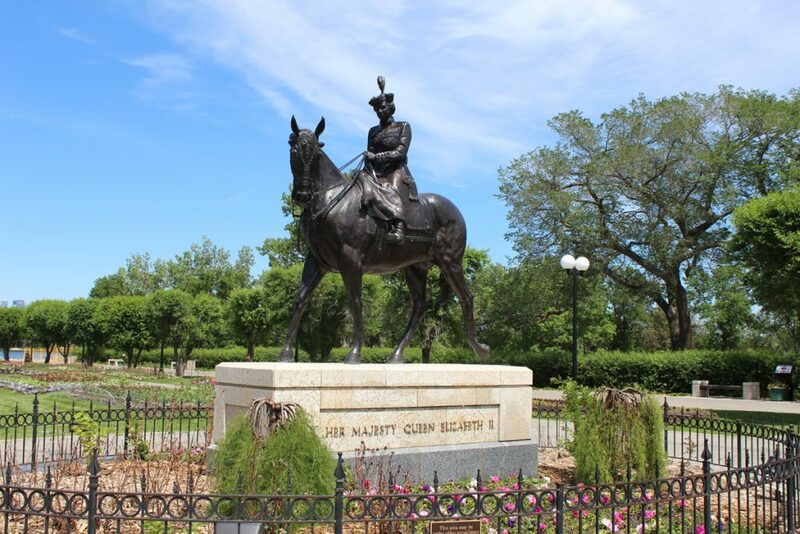 Sitting Bull became good friends with NWMP Superintendent James Walsh. Walsh established a fort at Cypress Hills and was instrumental in developing some of the first treaties with native peoples. 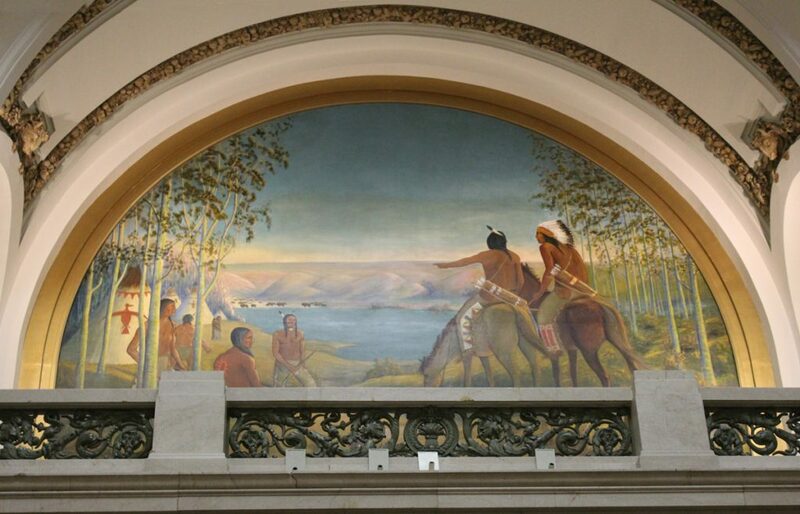 However, Walsh’s replacement Lief Crozier was not as friendly, cutting off the Lakota’s food supply and forcing them to return to the United States. Taming the wild frontier included keeping peace and order as the Canadian Pacific Railway was built and ensuring order in the gold rush days in Dawson City. One of the legendary Mounties of the day was Sam Steele who oversaw law and order among the 4000 workers on the railway and kept peace in Dawson. Sam Steele’s Buffalo Coat and Red Serge jacket. 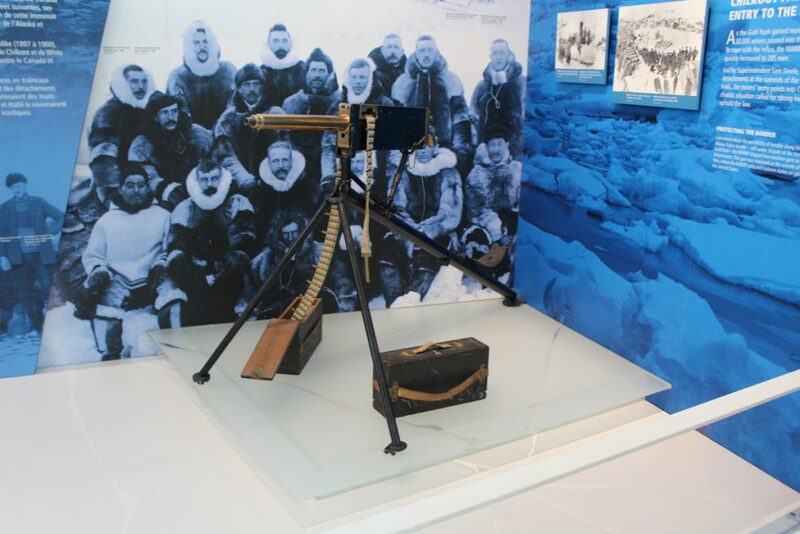 Other displays include a machine gun brought in to help control the border between the Yukon and Alaska. 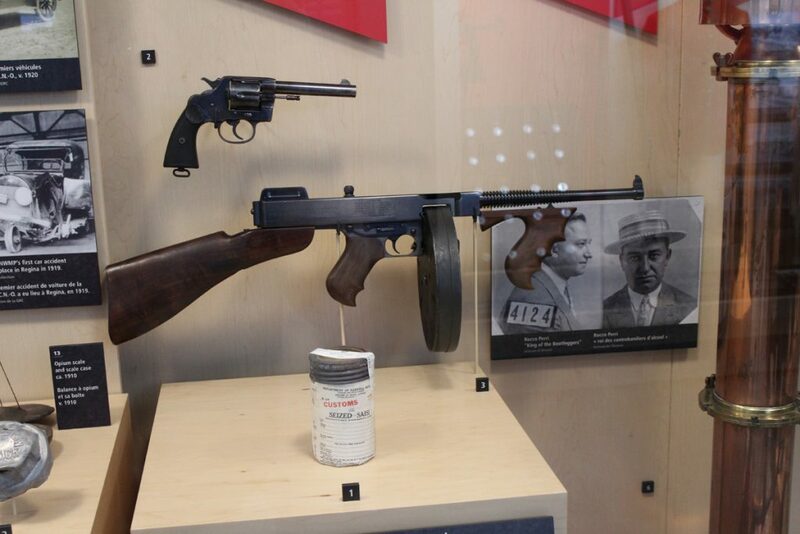 One of two machine guns used to defend the border at the Chilkoot Pass between the Yukon and Alaska. 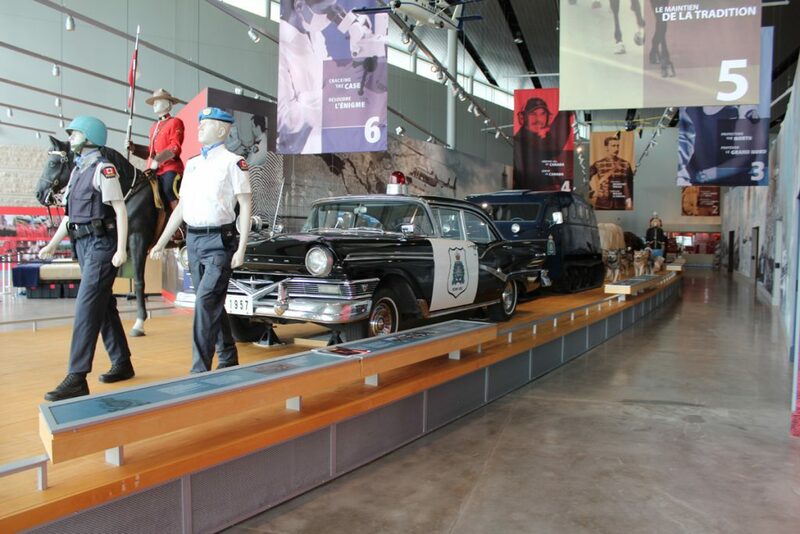 And there is a display of vehicles used over the history of the Mounties. These range from dogsled to snowmobile to the automobile. One classic car, a 1957 Meteor Rideau 500 is among the displayed vehicles. 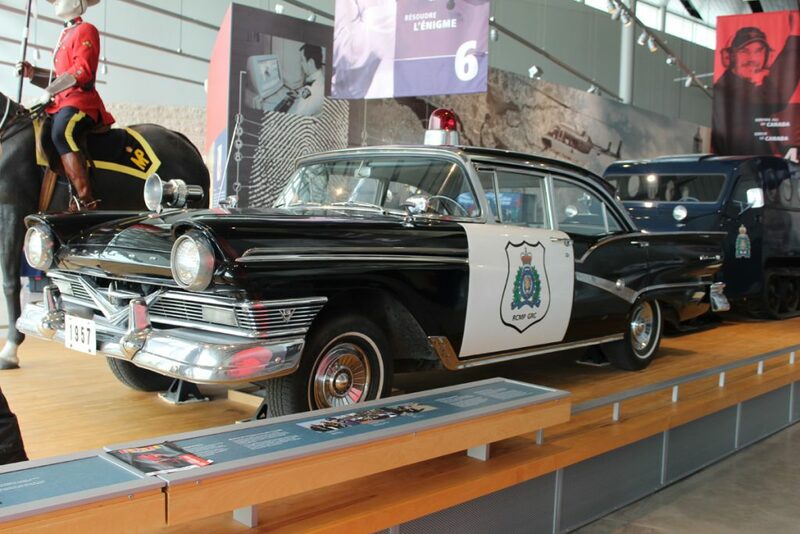 Classic RCMP vehicle, the 1957 Meteor Rideau 500. And, of course, there is a section on the famous RCMP Musical Ride. I was surprised to learn how old the ride is. One display notes that the ride was a staple of agricultural fairs across the prairies by 1904. Discontinued during WWI, it was re-established after the war. Below is a picture of the ride in 1921. One of the side displays is a virtual Musical Ride. You mount a saddle wearing a pair of virtual reality goggles and you find yourself jogging along with Mounties ahead of you and behind you. Lots of fun! 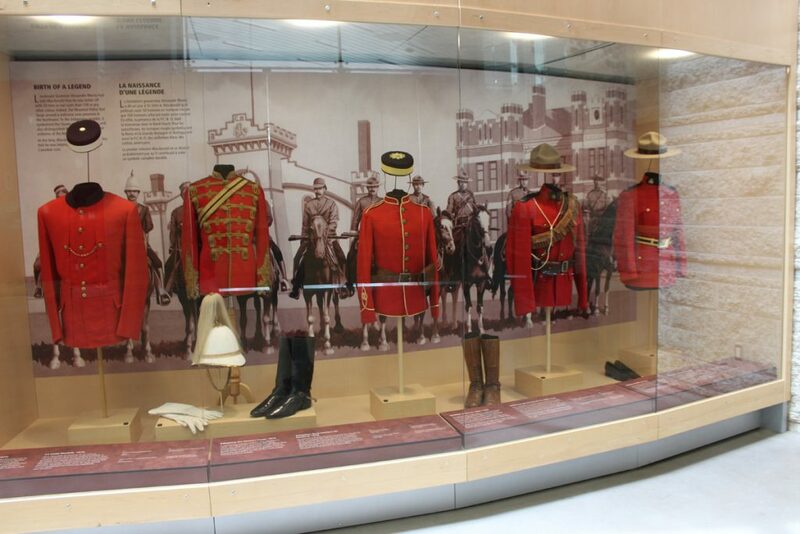 The Mounties are a storied part of Canadian history, a history that is well-told in this museum. 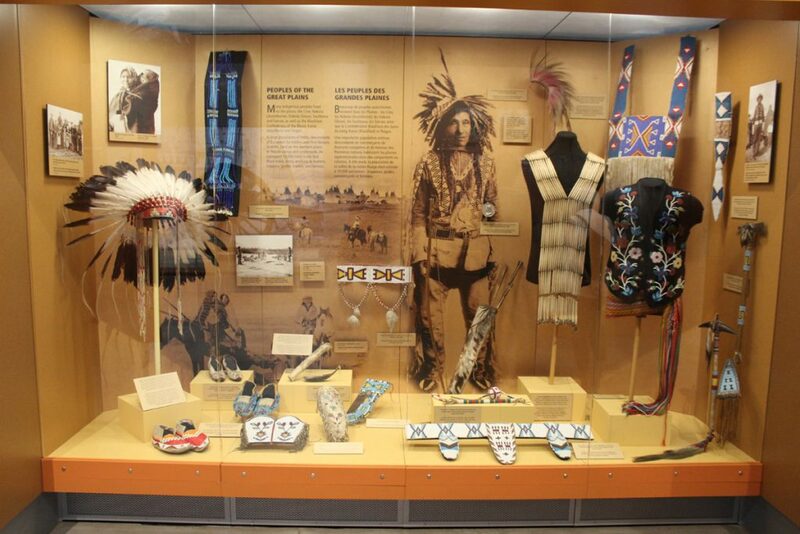 There are historical artifacts galore accompanied by information boards. 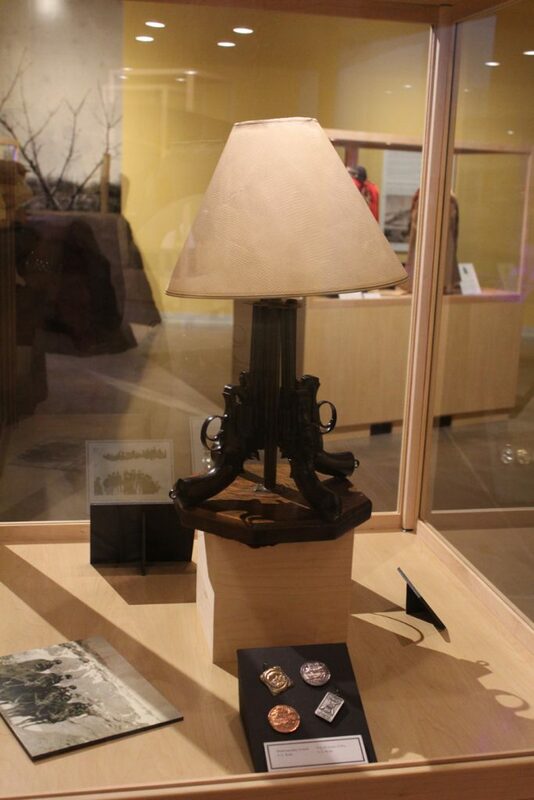 For gun buffs, you’ll find lots of antique weapons and what every gun enthusiast will love, a handgun lamp given to a Mountie who was a WWI veteran as a wedding gift! The handgun table lamp. Wouldn’t you love to get one of these as a wedding present? You’ll find a display detailing the solving of a murder from beginning to end. There’s information on the St. Roch, the RCMP vessel that was the first ship to circumnavigate North America. 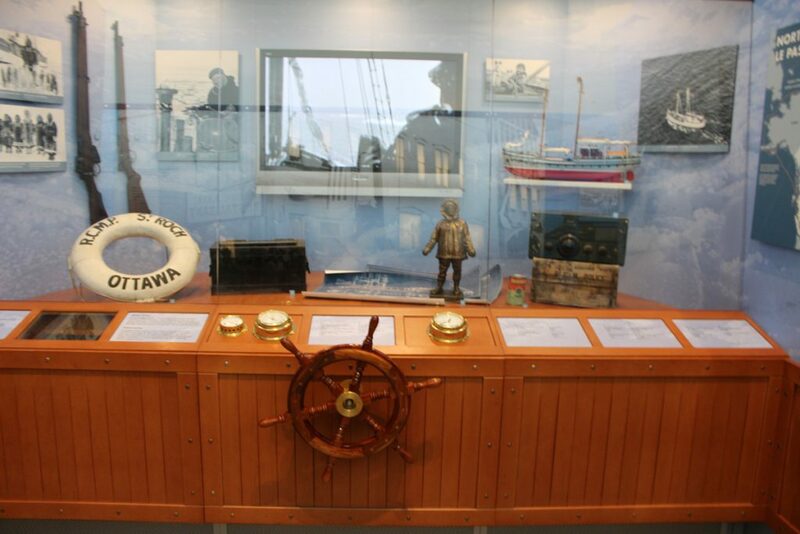 The actual St. Roch is on permanent display at Vancouver’s Maritime Museum. We spent several hours on our visit and enjoyed every minute of it. Below are some additional links including a Photo Gallery with additional pictures. Here are some additional photos of our visit. 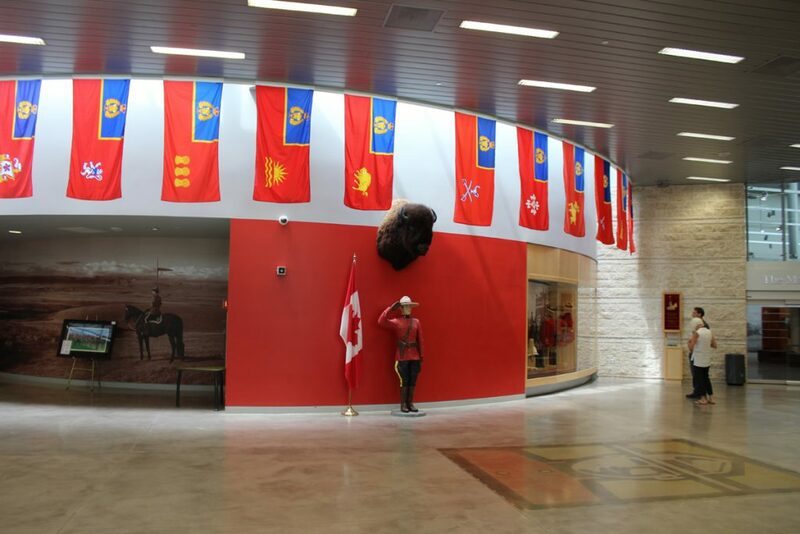 Above is a stylized Mountie at the entrance drive to the centre. How to solve a murder display. Different tableaux explain the investigative process and the reasoning that led to the capture and conviction of the killer. The St. Roch display. 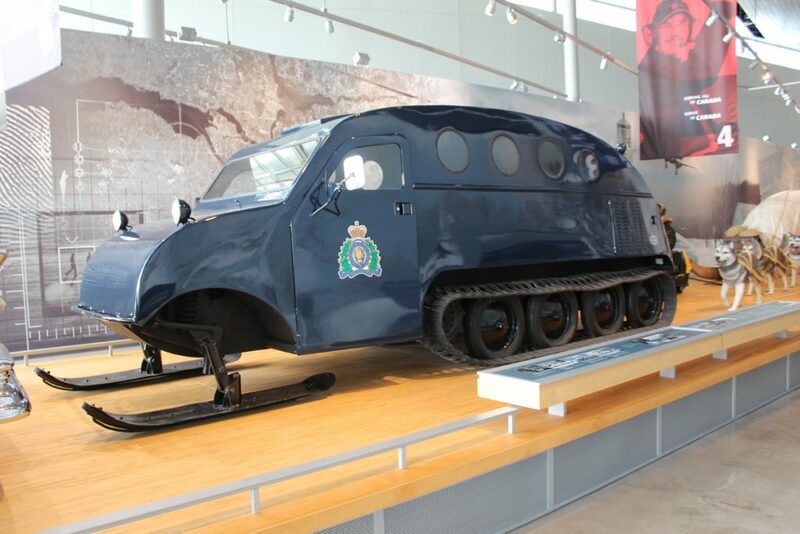 The St. Roch was an RCMP marine vessel that was the first to travel the Northwest Passage from West to East and the first to circumnavigate North America. 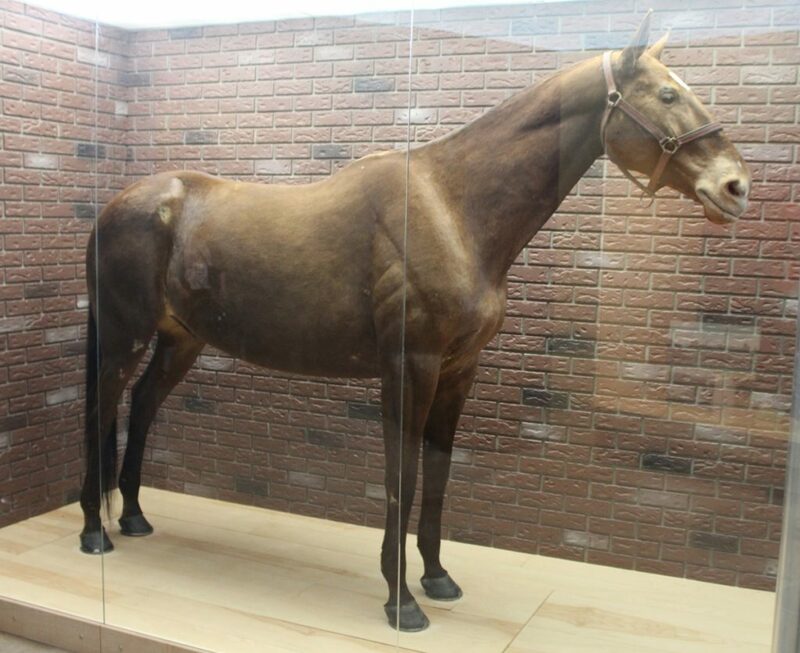 Fort Walsh – from 1943 to 1968 it served as a breeding and training facility for the horses used in the Musical Ride. 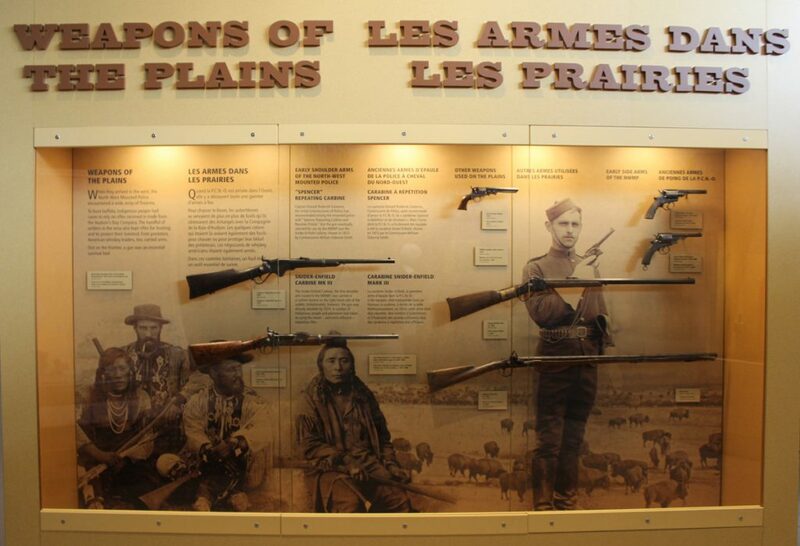 Now it is a National Historic Site. The actual Nero preserved by taxidermy. Unfortunately the colour of his fur has faded from black to reddish brown due to taxidermy chemicals and sunlight. 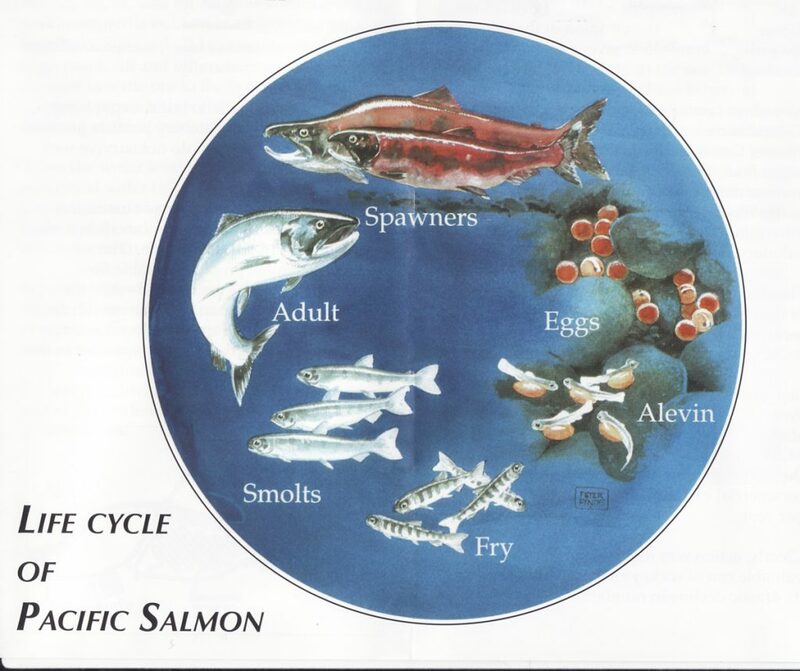 The life cycle of the Pacific sockeye salmon is a fascinating one. Although salmon are a salt water fish, they start life in fresh water. Every year in October thousands of salmon migrate back to the river of their origin to lay eggs. 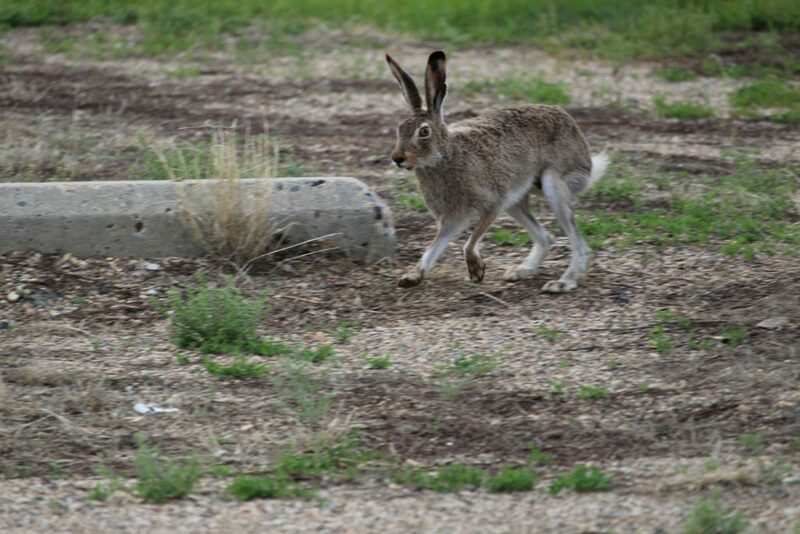 The eggs are fertilized by the males and stay buried in a gravel nest until they hatch in the spring. The eggs turn into alevin, a small fish with a yolk sac under its belly to provide nutrition. They remain buried in the gravel as they grow. When the yolk sac is used up, they emerge from the gravel as fry. Sockeye differ in their life cycle at this point as the fry swim to a fresh water lake where they stay for a year growing into smolts. These smolts then migrate back to the ocean where they mature into adults. Near the end of their four year cycle they instinctively return to the creek they were hatched as spawners. Both male and female fish return. The female digs a nest about twenty centimetres deep and lays her eggs. The male deposits his milt to fertilize the eggs. After both are spent, they die, the salmon life cycle complete. Other species of salmon follow a similar pattern but return to the sea as fry, not as smolts. Salmon fishing is a major industry in British Columbia and, not surprisingly, people have made efforts to conserve and enhance the salmon stock. Weaver Creek, about 45 minutes from Abbotsford and two hours from Vancouver was the site of the first efforts at salmon enhancement in 1885. 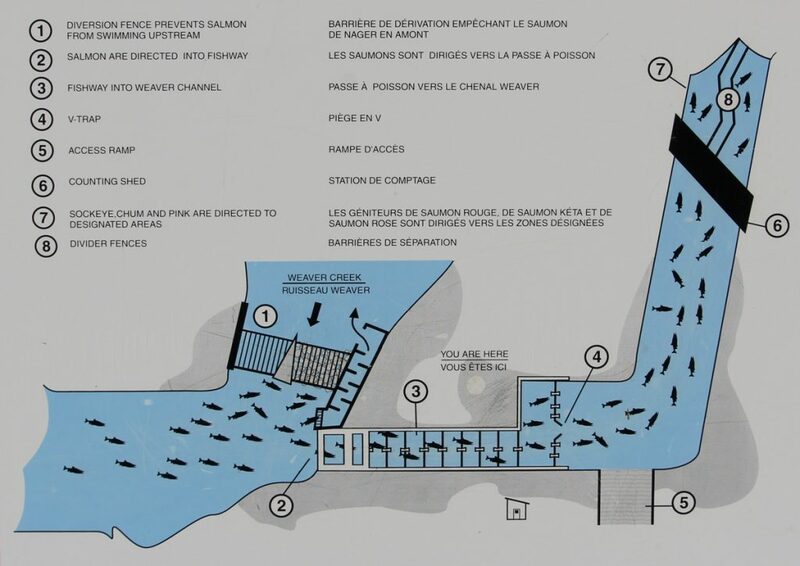 In 1965, after several years of a declining salmon run (from an average of 20,000 sockeye salmon to just 12,000), a spawning channel was built about thirteen kilometres from Harrison Mills. 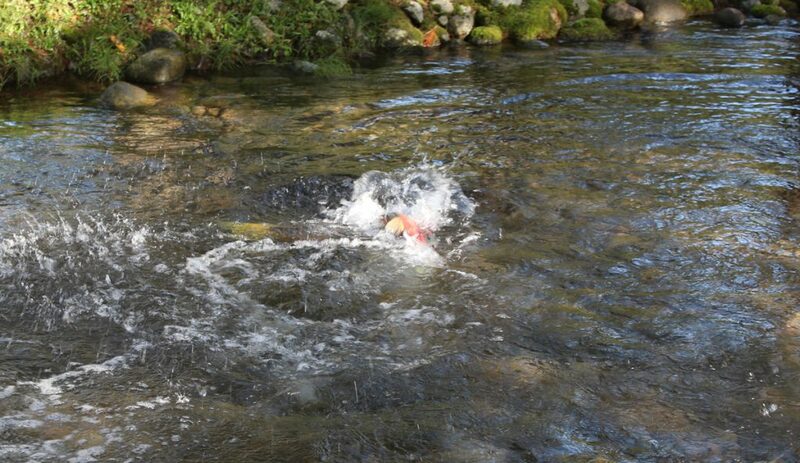 Every year from October 8th to November 1st, the sockeye return to Weaver Creek to spawn. The facility is open to the public daily from October 6th to November 5th from 8 AM to 4 PM. The spawning channel meanders in a a serpentine fashion and covers a distance of almost four kilometres. The tour is self-guided and works its way from the end of the channel to the beginning. There are many large signs along the way explaining the process. I am reversing the order here and starting at the beginning of the channel. 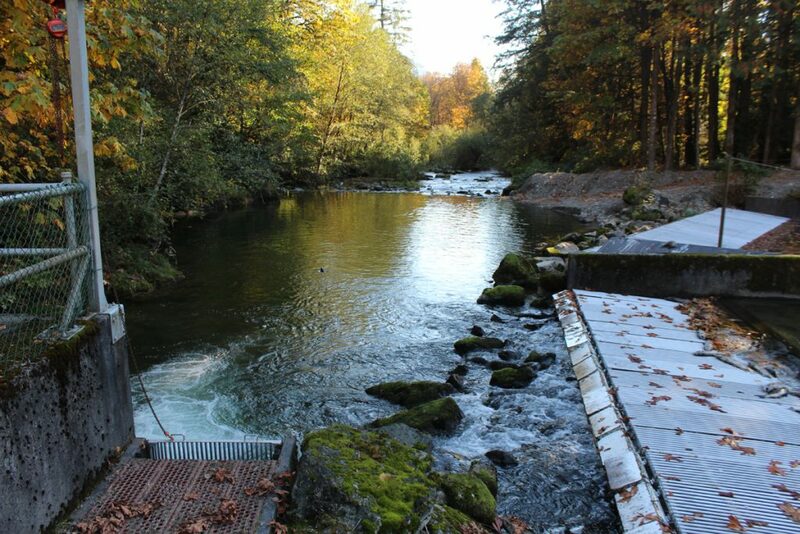 A weir blocks access to upstream Weaver Creek on the right and the salmon are directed into the spawning channel. At the head end is weir to keep the salmon from heading upstream and diverting them to the spawning channel (on the left in the picture above). 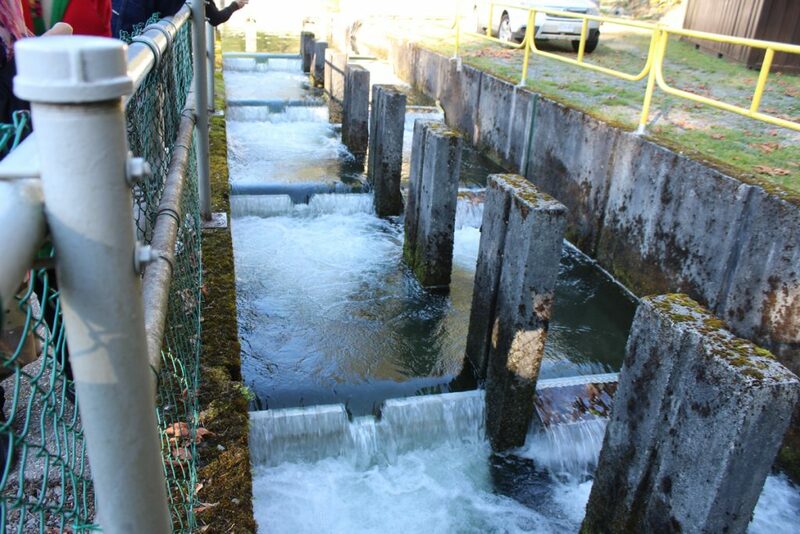 The first part of their journey is a fishway, a series of four cascades which the fish have to navigate to get to the spawning channel. Four cascades form the fishway. These are the highest jumps the salmon must breach to head upstream. From there the fish move into a holding area. 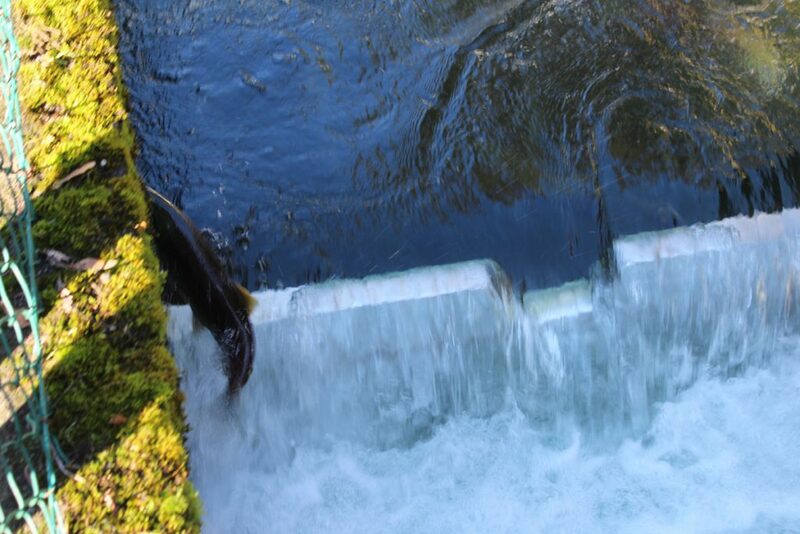 The picture at the beginning of this article shows a salmon leaping from the lower to the higher level of the holding pond. Before they can get into the spawning channel itself, they are sorted and counted. Fisheries staff allow 30,000 sockeye, 2000 pink and 2000 chum salmon to enter the channel at a ratio of three females to every two males each fall. Surplus fish are directed back to Weaver Creek to spawn naturally. Once past the gateway, the salmon enter the spawning channel itself, a winding stream almost four kilometres long. The channel is specially designed with a gravel bed where spawning occurs. The female fish digs tail down into the gravel create a hole about twenty centimetres deep. She lays her eggs and a male comes along and sprays his milt over the eggs. Then they are covered up and the fish continue along the channel. Some activity in the water, possibly a female digging a nest. A female salmon may build several nests before her supply of eggs are used up. 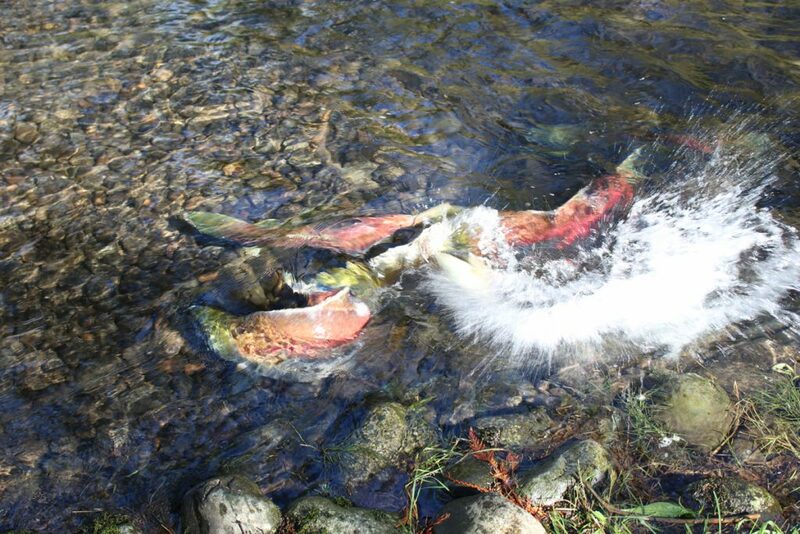 Shortly after the salmon, both male and female, are spent, they die. In the wild, the carcasses wash downstream but in the channel, they are collected daily and buried elsewhere on site. The fish go through a sort of dance or ritual in this whole process. You will see them milling about, sometimes one female chasing another away from a chosen nesting place. A male and female will pair up as a female will not deposit her eggs unless a male is nearby. The male are the larger of the salmon though they look quite similar. Several salmon in the stream. You can see the salmon up close here as the stream is relatively shallow and the fish come quite close to shore. The most fun to watch, of course, is salmon leaping over the waterfalls along the way. The earlier cascades in the stream are higher and take more effort to navigate. The ones in the actual channel are aluminum and are designed to aerate and oxygenate the water. 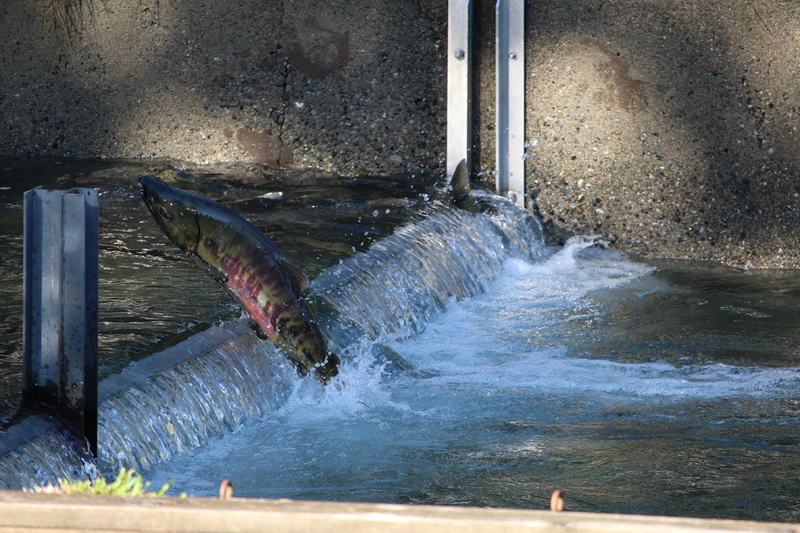 Oxygen-enriched water helps the salmon. 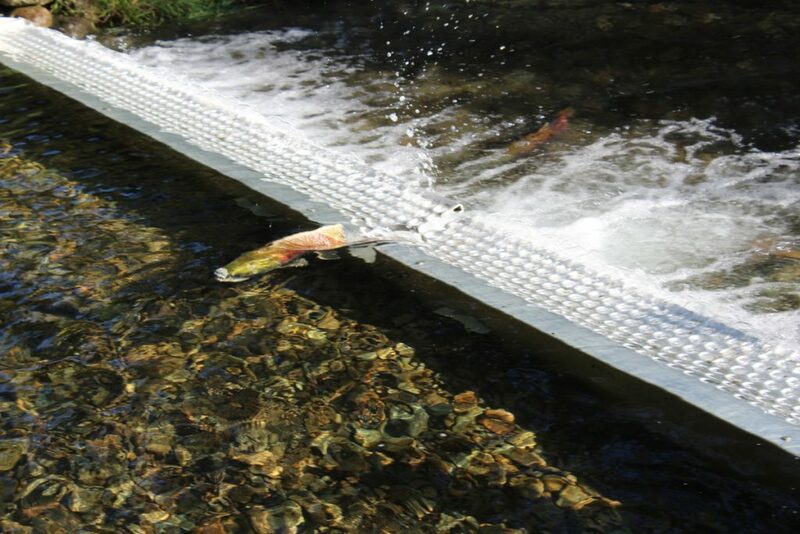 These aluminum barriers have a notch or hole in the middle and the salmon swim up through these notches though occasionally one will just jump over the barrier. This salmon has just swum through the notch in the aluminum barrier. 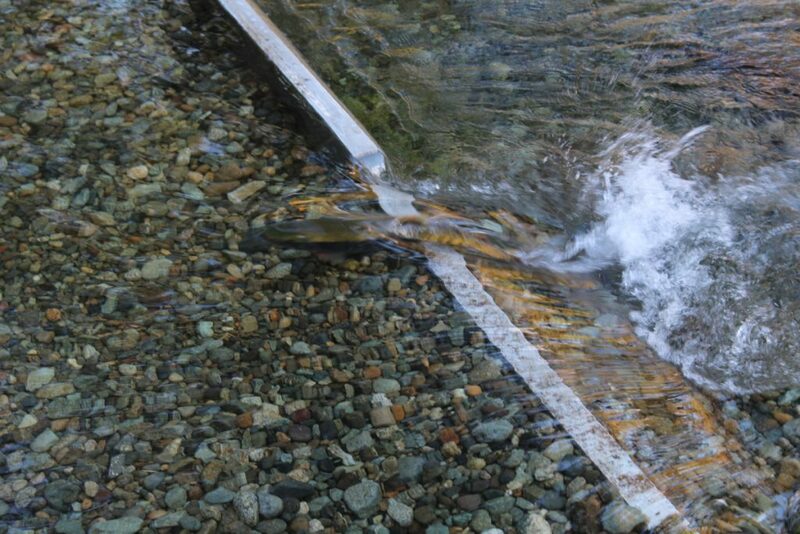 Below is a video I shot that shows first the fishway, second the holding area before the counting station, third fish milling about the stream, and lastly, fish swimming through the notch in an aluminum barrier. 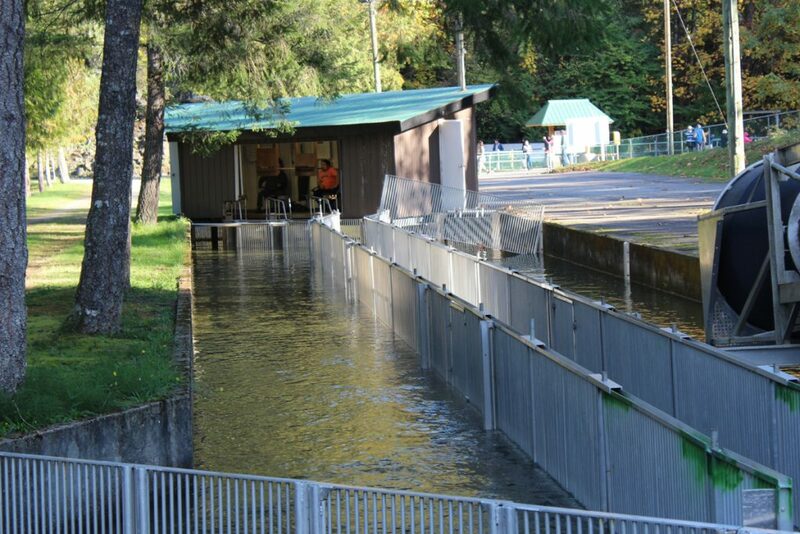 The Weaver Creek Spawning Channel is open daily from 8 AM to 4 PM until November 5th. 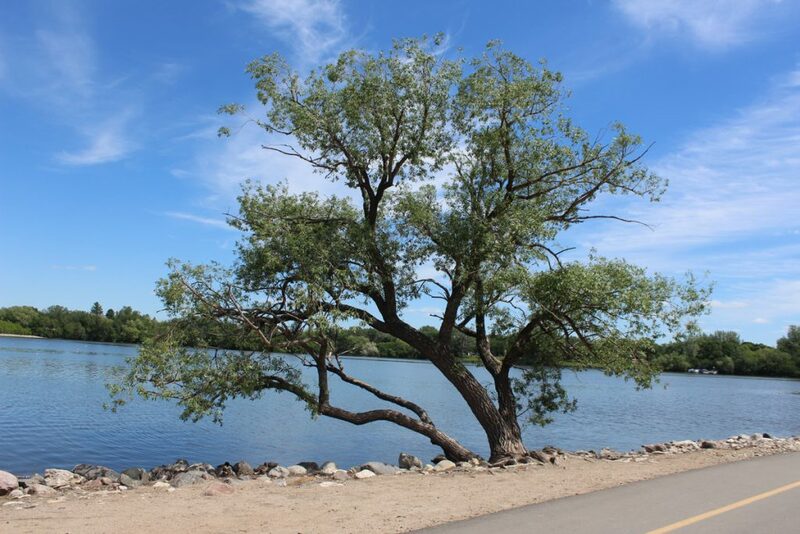 It is an almost park-like setting with walking paths and trees lining the banks. There is ample parking across the street from the hatchery. My wife and I enjoyed our visit a lot and highly recommend it. There were two busloads of Asian tourists visiting while we were there, as well as couples with kids in tow. This is an excellent educational experience for school age children. 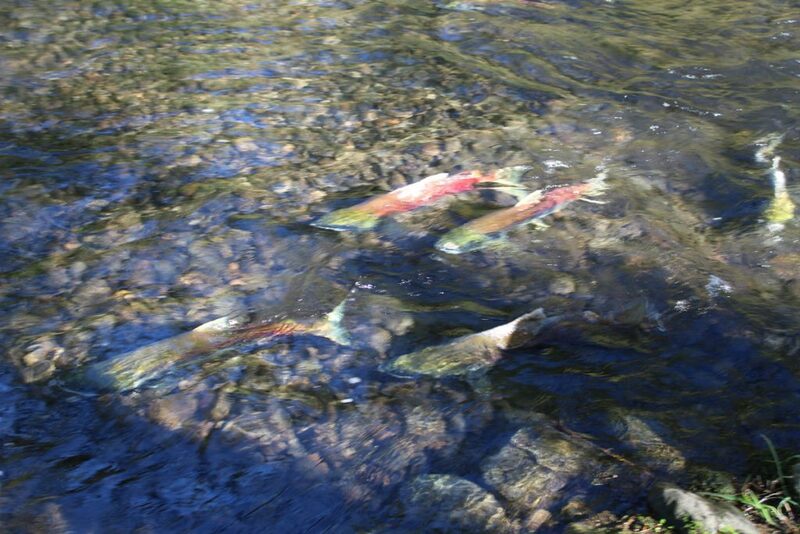 The peak of the salmon run is from October 15 to 25 so now is an opportune time to visit. I should note that downstream is the Sandpiper Golf Course which has an excellent restaurant called the Clubhouse. We dropped by for dinner after our visit to Weaver Creek. 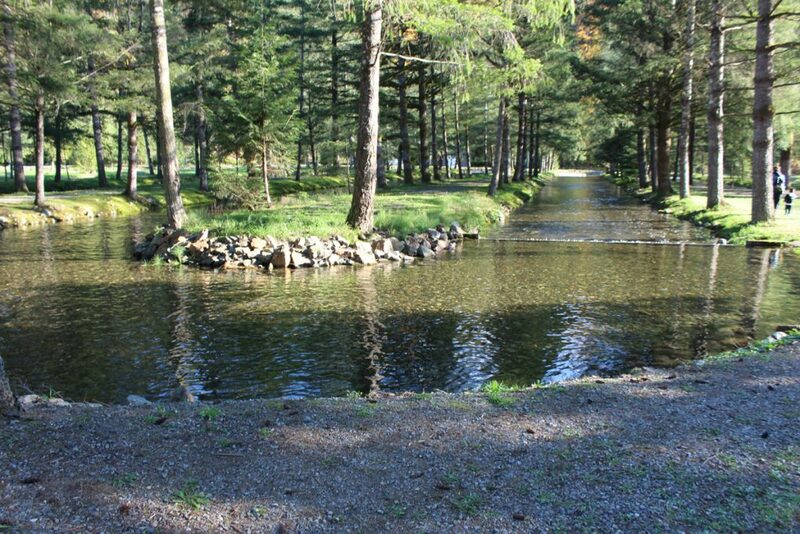 If you’re a golfer you could make a day of it, doing some golfing a well as visiting the fishery. And Harrison Hot Springs is not far away as well. And I should also note that, while the Weaver Creek spawners are collected and buried after they die, the many other salmon traveling up other creeks and rivers float back down the river naturally after they pass away. These fish are a favorite food source for bald eagles and the Sandpiper Golf Course is also the site of the annual Bald Eagle Festival. There you’ll see the “world’s largest concentrated gathering of bald eagles” in November. I’m told November 5th is the best date for eagle watching. 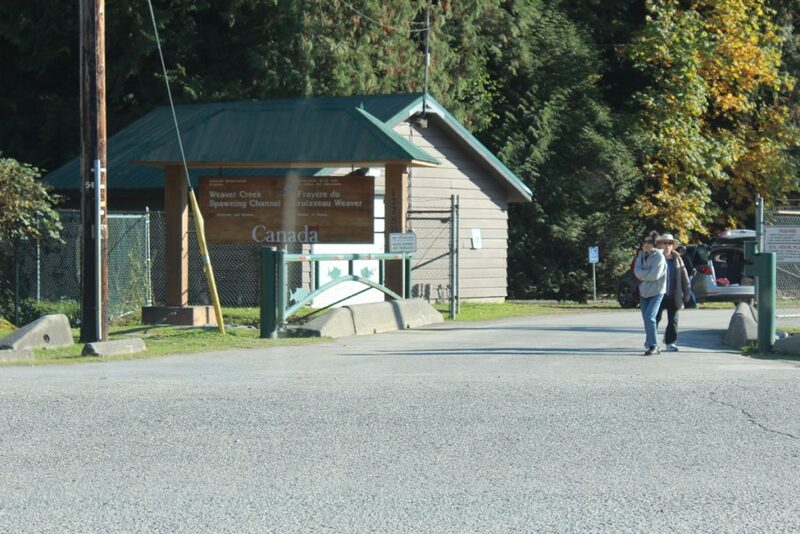 Since the salmon enhancement centre is open until November 5th, you might want to combine both if you visit in early November. There were no eagles to be seen when we went on Oct. 10th – too early in the season. And there may be fewer fish still making the run by November, so it’s a trade-off. We will be going back for the eagle festival. Below are some links of interest followed by some more photos. 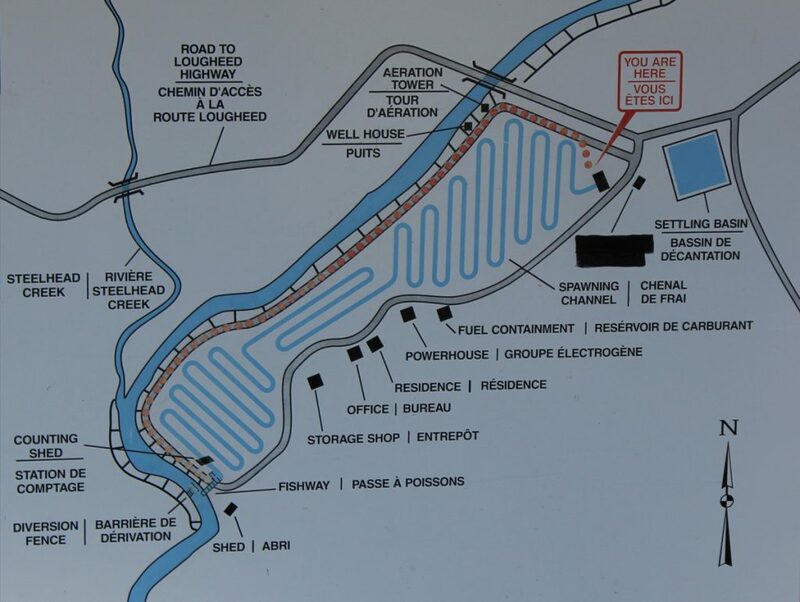 Map showing the creek system and the spawning channel. Water flow is maintained at a constant level in the channel to combat either flooding or drought as the case may be. 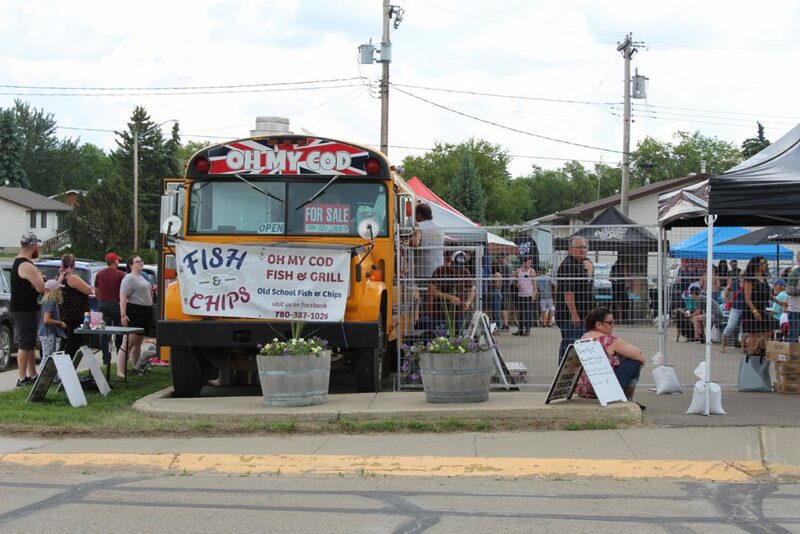 There is a certain charm about small towns and small town festivals. If they are an agricultural community, the celebration will often center on the predominant crop. Pitt Meadows, British Columbia, where I used to live, has its annual Blueberry Festival. 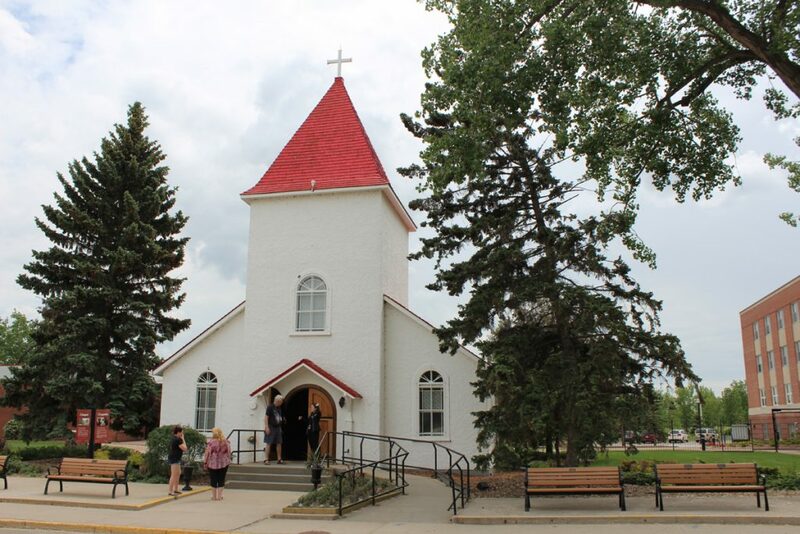 Others may celebrate their heritage with Pioneer Days. 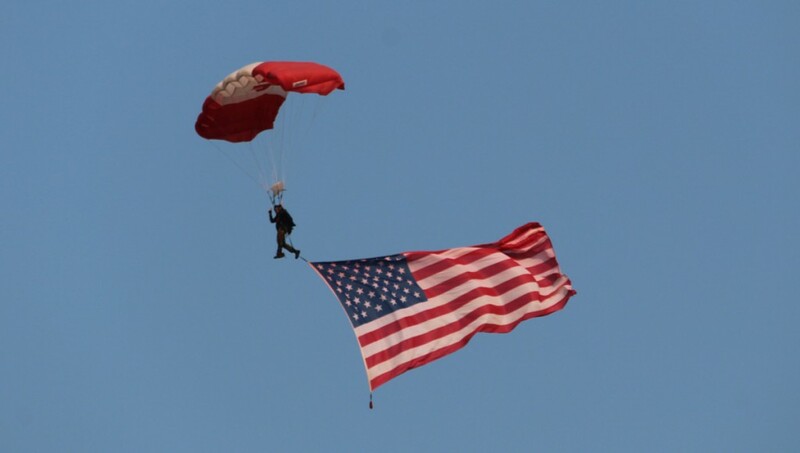 Many tie their festivities in with the national holiday – Canada Day or the Fourth of July in the United States. A parade is almost always part of these events. 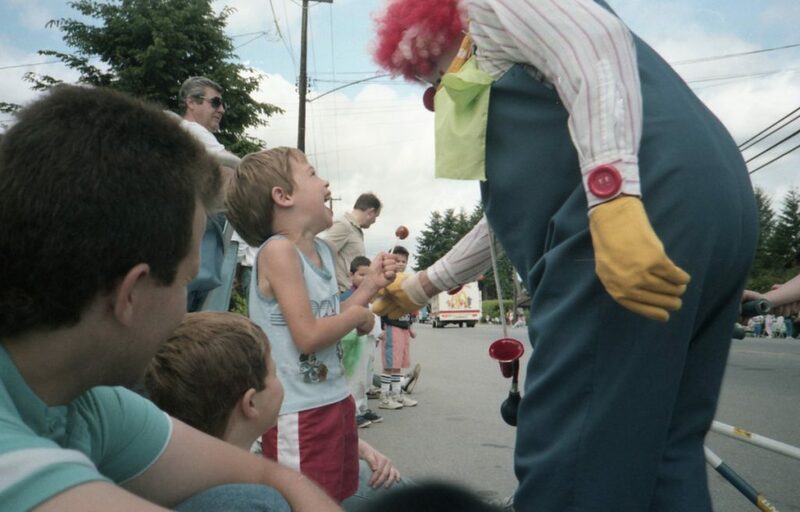 My son meets Dilly the Clown at the annual Pitt Meadows Day Parade in 1990. 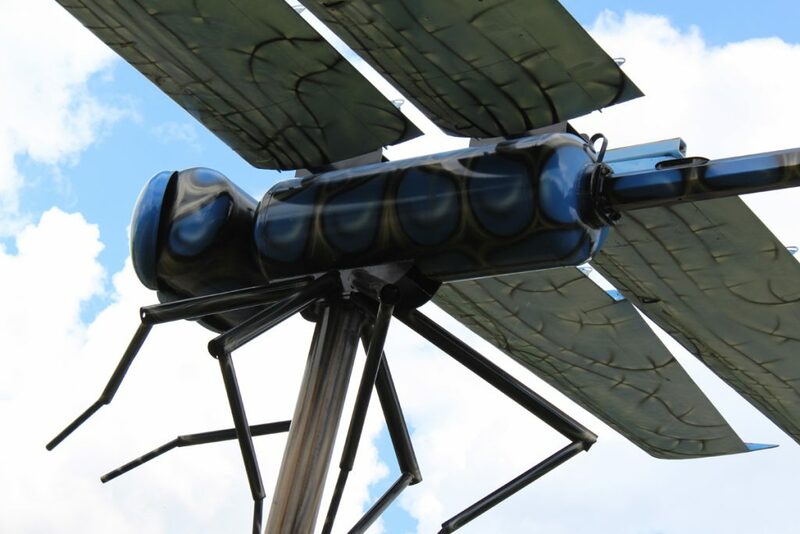 As you drive in to the small village of Wabamun, Alberta (population 682) you encounter a giant dragonfly – a ten metre long sculpture atop a six metre pole. 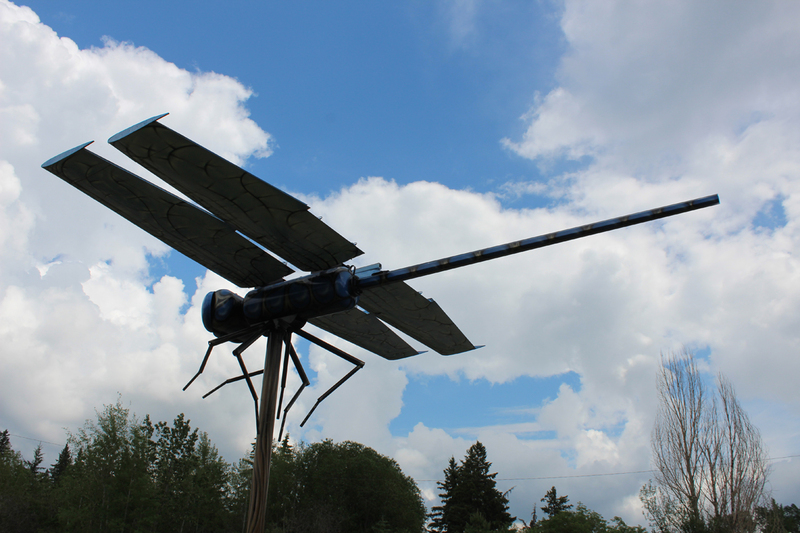 Made of scraps, including parts of an old airplane, it is the largest dragonfly in Canada. 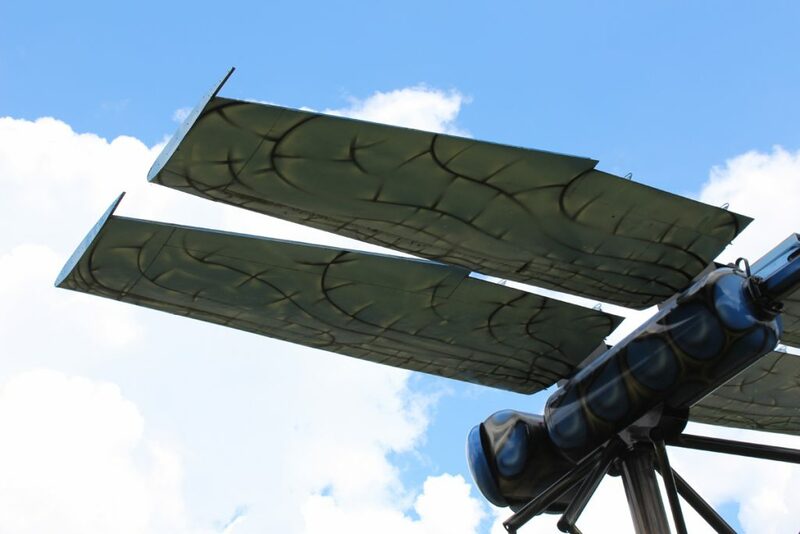 Old airplane wings now serve as dragonfly wings. 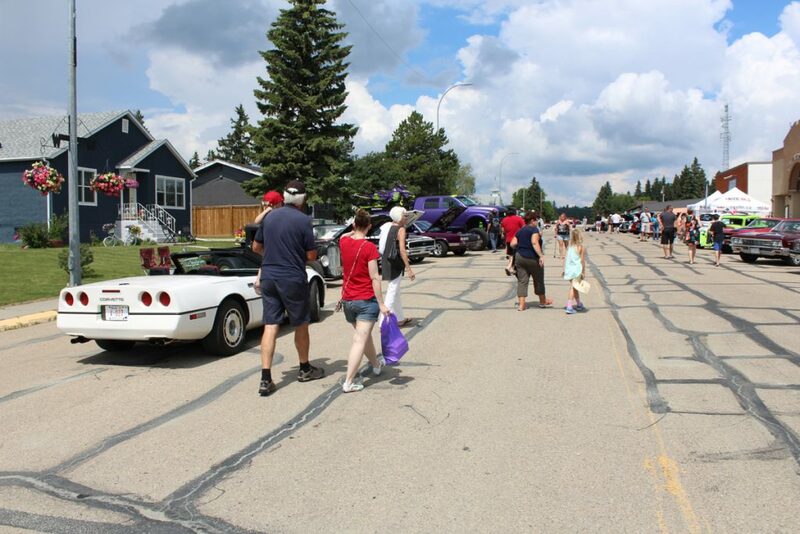 The town sits on the edge of Wabamun Lake, a popular destination for Edmontonians and others in the summer. 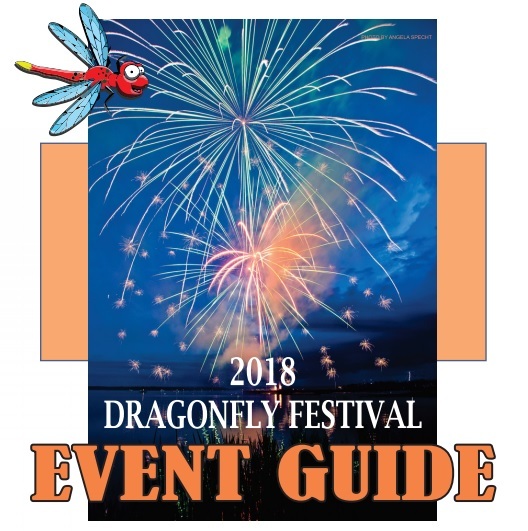 Every year towards the end of June the town celebrates the Dragonfly Festival. This three day event brings in as many as 10,000 visitors. This year it ran from June 23-25. Janis and I were visiting her brother and family in Drayton Valley for a couple of days and we drove out to take in the second day’s events. We arrived about forty-five minutes before the start of the parade and so we took in a bit of the Art Walk before and after. 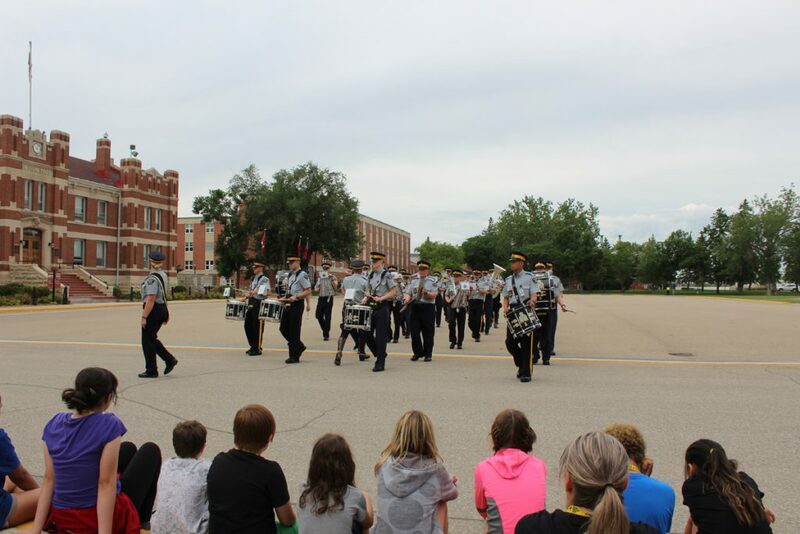 Like many small-town parades, this one started off with a marching band, a group of Air Cadets. 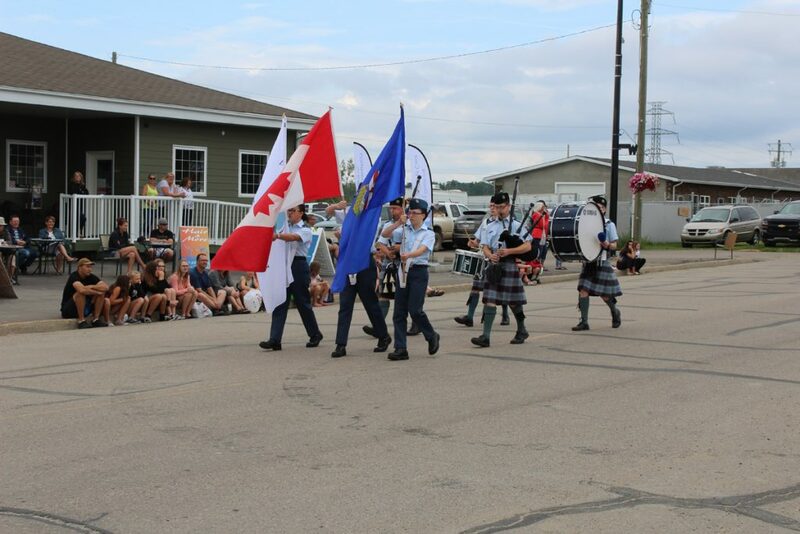 Cadets lead off Wabamun’s Dragonfly Festival Parade. This was followed by politicians in cars waving at the crowd and tossing candy to the children. Getting the kiddies ready for when they’re grown up and start clamoring in earnest for free goodies. There weren’t just politicians. One was a wannabe – a candidate for the nomination to represent the Conservative Party in the next election. 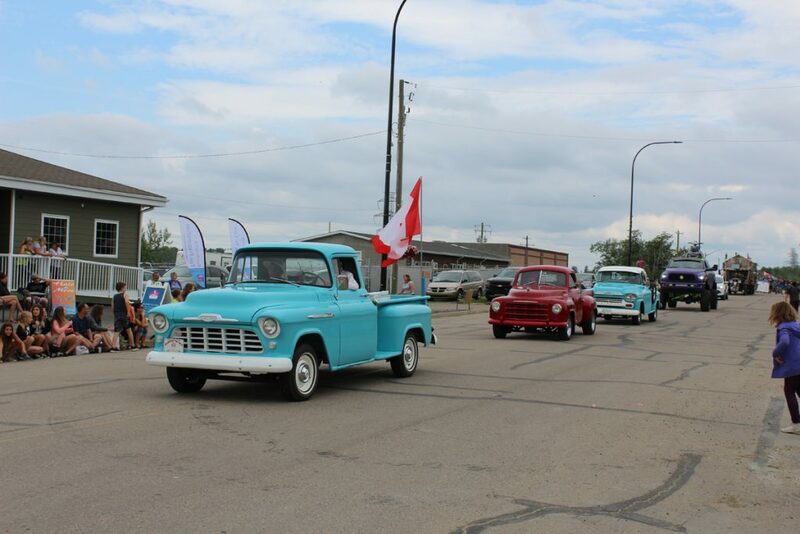 This was followed by another staple of parades everywhere – vintage cars! There were quite a few of them and there were even more on display after the parade. 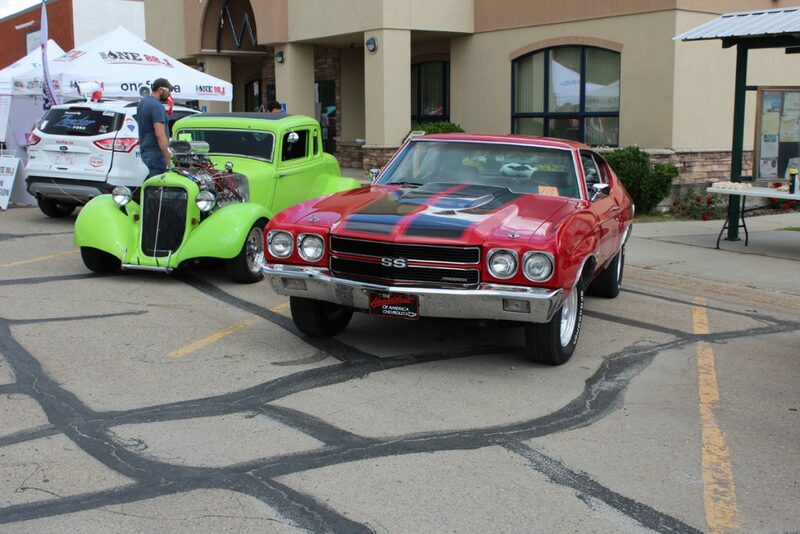 There were some modern cars as well – souped up truck and some expensive roadsters, including a green Lamborghini. Local businesses were there, some with simple makeshift floats. I rather liked Home Hardware’s giant hammer. 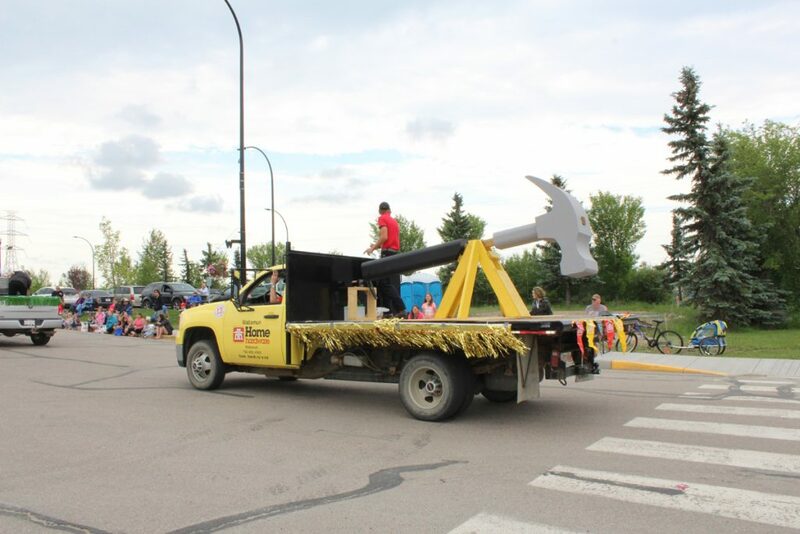 Home Hardware had a giant hammer on the back of a pick-up. But floats were few and far between. 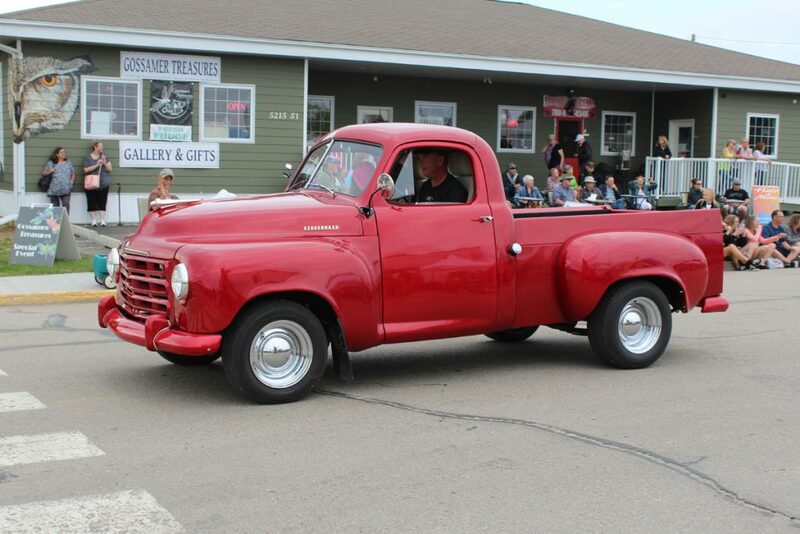 The best effort was Al’s Affordabago – a converted 1934 Chevy Truck. Your rustic camper on wheels. It was also towing a small trailer. 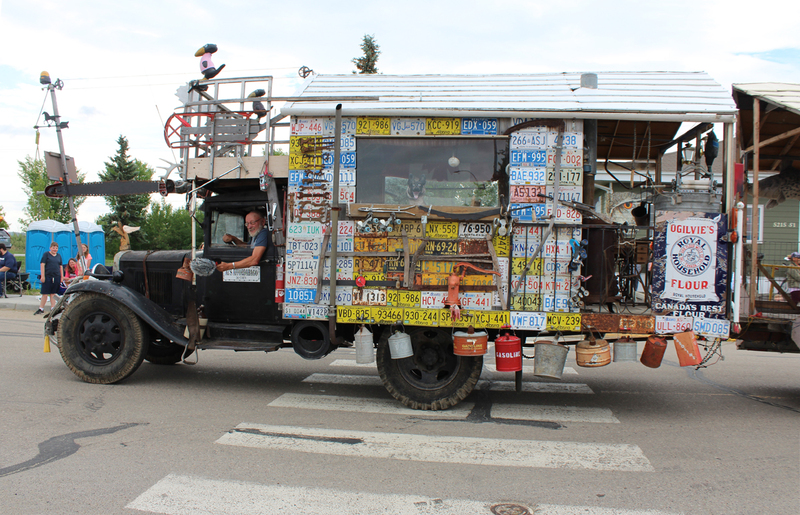 Al’s Affordabago – a converted 1934 Chevy truck. The truck was festooned with bric-a-brac including a number of antlers, the skull of a steer, a beer keg, an old water pump and a slew of old license plates. I wonder if Al actually goes camping in that contraption! As parades go, it wasn’t the greatest, but everyone loved it. And almost everyone was tossing out treats for the kids. 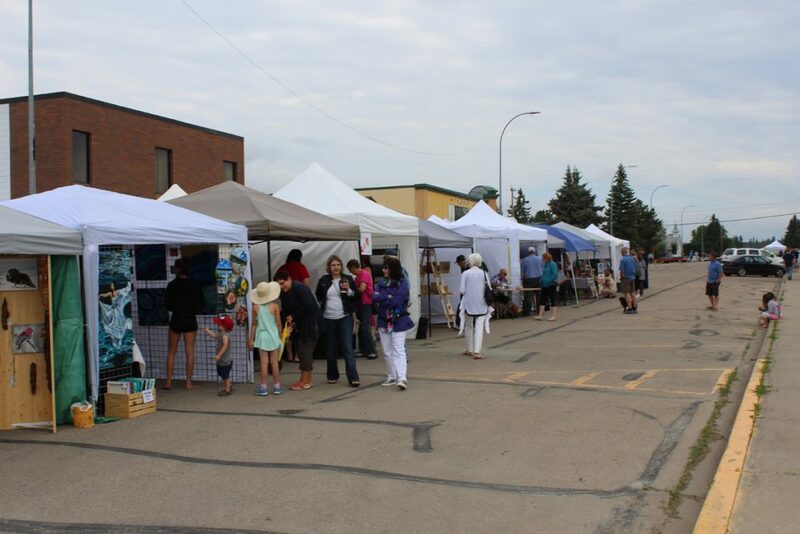 The Art Walk featured various Albertan artists, each with their own little tent. The Art Walk and Vendor’s Market were quite well done. 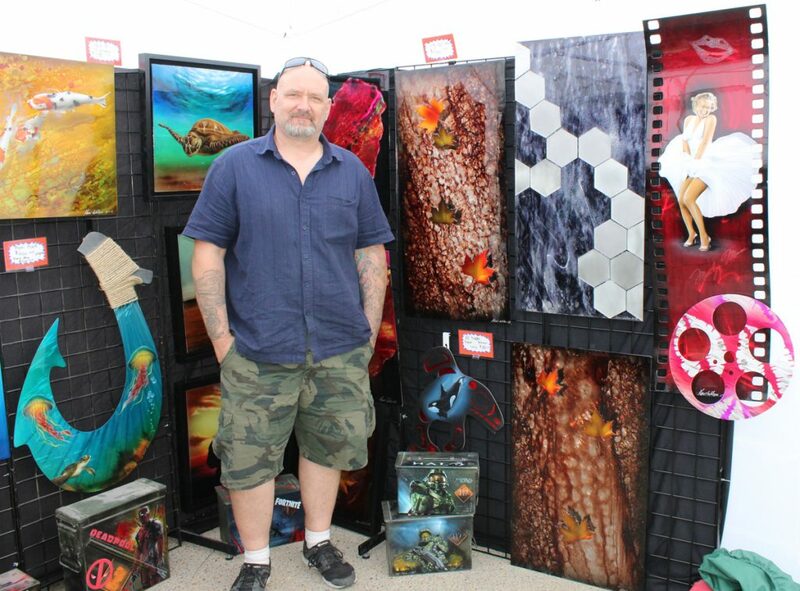 Many Albertan artists had booths displaying their art – mostly paintings but also sculpture. 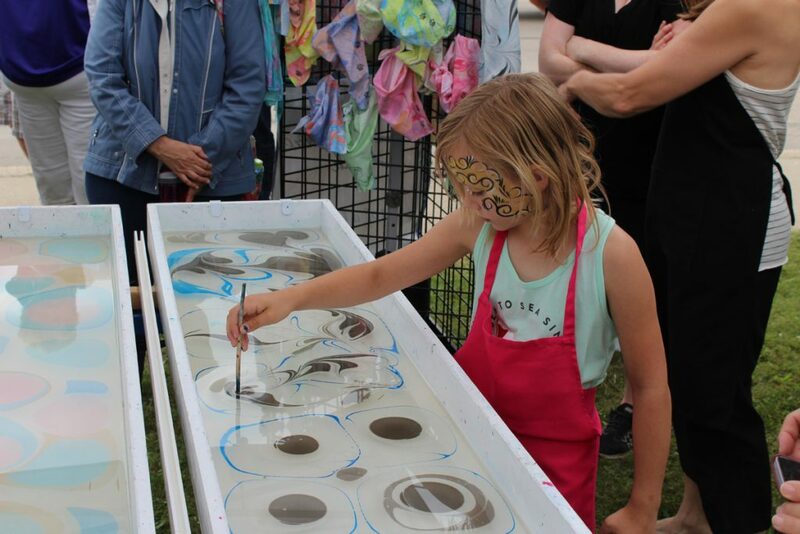 There were 38 artists on display this year, the fourth Dragonfly Festival to feature the walk. I was quite enchanted by the work of Josh Harnack who painted people with animal heads. Mounties were a favorite subject. 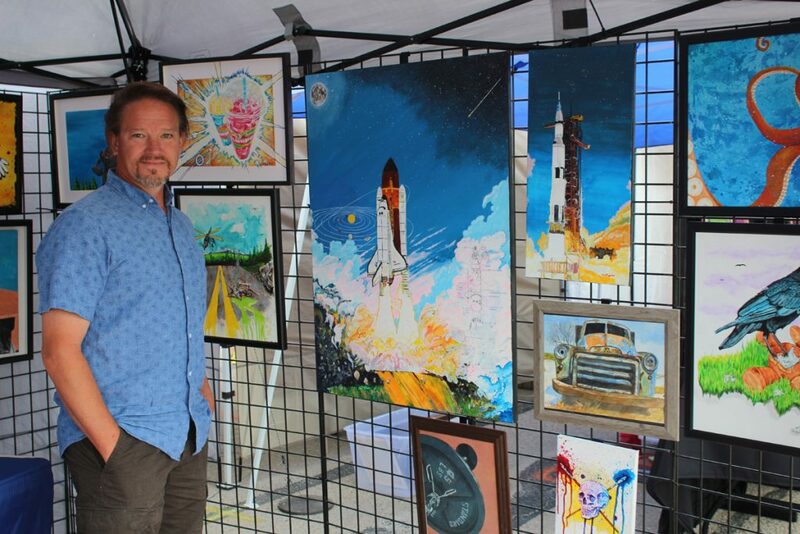 Josh Harnack and his art. 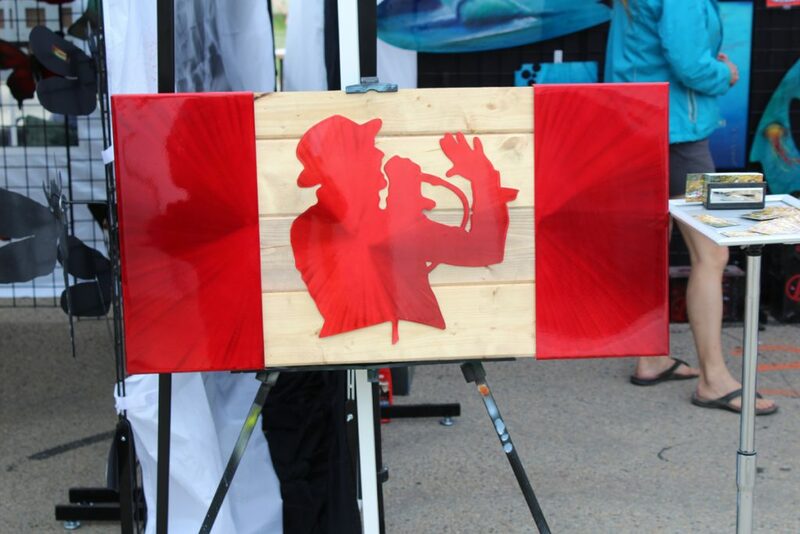 Another artist, Kevin Wilson, does air-brushed art over metal and featured a Canadian flag with late Tragically Hip singer Gord Downie in place of the maple leaf. Gord Downie – a true symbol of Canada. The art is by Kevin Wilson. Not surprisingly, since this is Alberta, Wilson also had colorful ammunition boxes on display. Kevin Wilson’s ammunition boxes feature scenes from classic movies like Deadpool and Guardians of the Galaxy as well as scenes from games like Fallout. 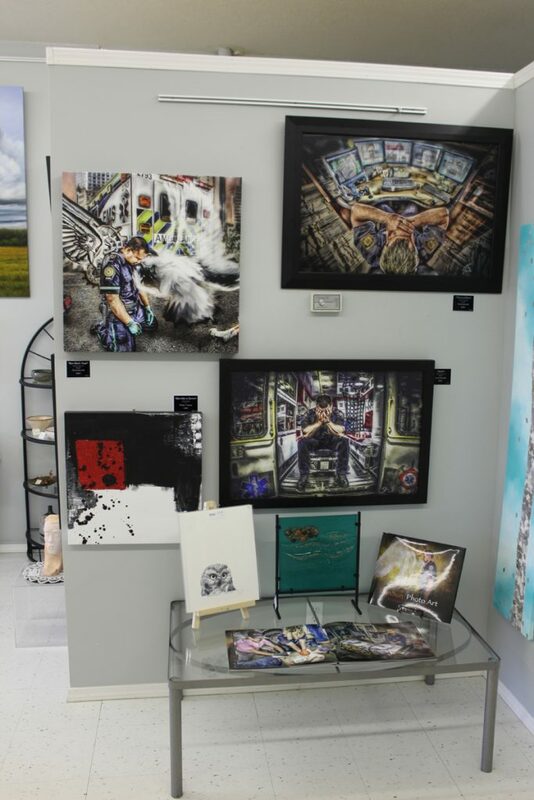 The local interest in art stems from the sponsorship of a local art gallery, the Gossamer Treasures Gallery. We went in and it featured a couple of Alberta artists work for the festival. The theme was indigenous people and artists Reg Faulkner and Henri de Groot both capture native culture well. The Gossamer Treasures Gallery just before the parade started. But I was particularly taken by a book and art work on the lives of emergency first responders by artist Daniel Sundahl who signs his work as DanSun. 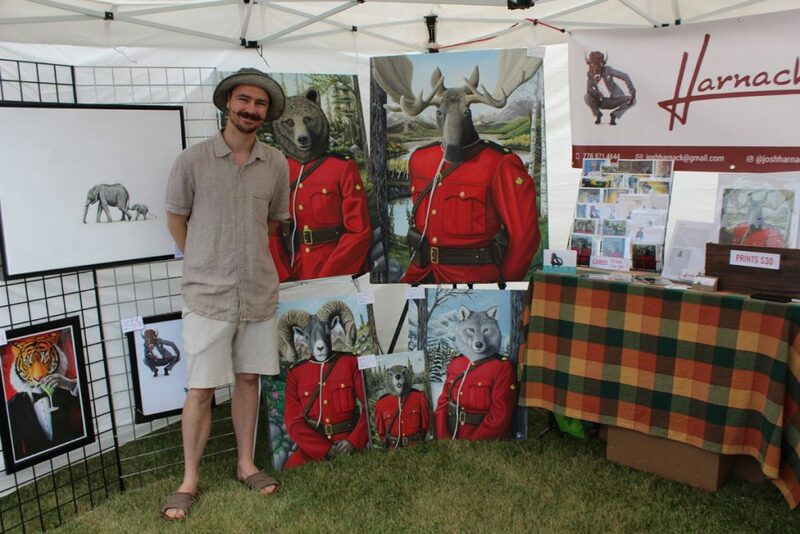 The artist is himself a paramedic and firefighter in the City of Leduc, Alberta. These were very evocative and emotional works capturing both the dedication and the agony of doing such work. Portraits of an Emergency by DanSun. 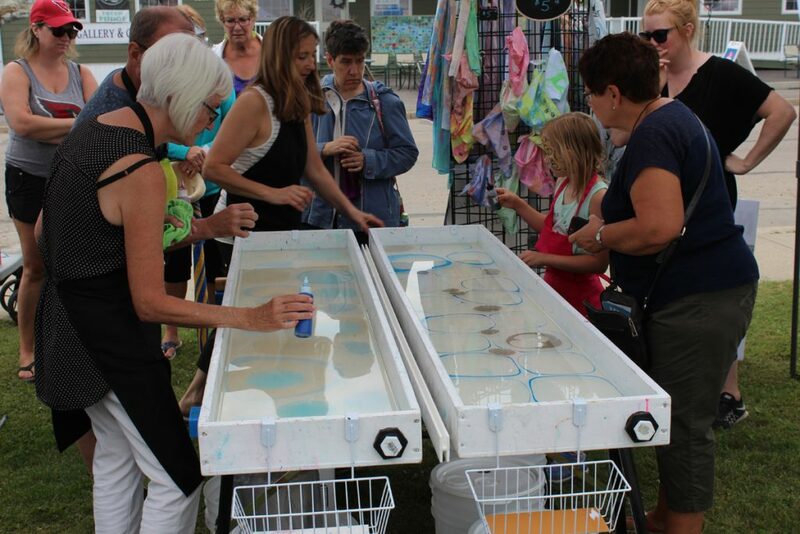 Wandering around the Vendors Market, we came across Signature Silk where you could silk-screen your own silk scarf. My wife decided to have a go and her sister-in-law sponsored her granddaughter’s effort. My wife and my grand niece try their hand at silk-screening a scarf. Colours are added to a bath of special solution. The colours can then be swirled with a rod to create patterns. More drops of colour can be added. When the artiste is satisfied, the silk is dropped over the solution where the colours then adhere. It is removed and voila – a silkscreened scarf. After that we went to check out the vintage car display when it started to rain. We escaped under the tent of The Green Lambo Guy who is actually a professional motivator and personal life coach. His Lambo is a symbol of what a determined person can achieve. After the rain let up we called it a day. My wife and I were on the road again the next day, but the closing day of the festival featured an all day (3:00 PM to 9:00 PM) event called Up!Fest at the waterfront park. This was largely a music festival featuring local artists and culminating with a show by iconic Canadian rock band Loverboy (The Kid is Hot Tonite, Working for the Weekend). Not bad for a small town of 682! Check out the Photo Gallery for more! 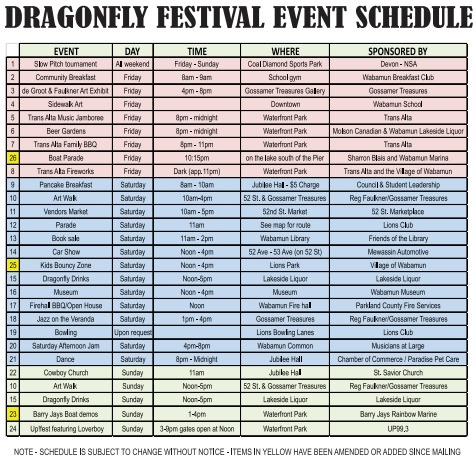 Here are some additional photos of the Dragonfly Festival. Since the Dragonfly Festival pics don’t show the lake, I’m starting with a photo from 2000 from a previous visit. 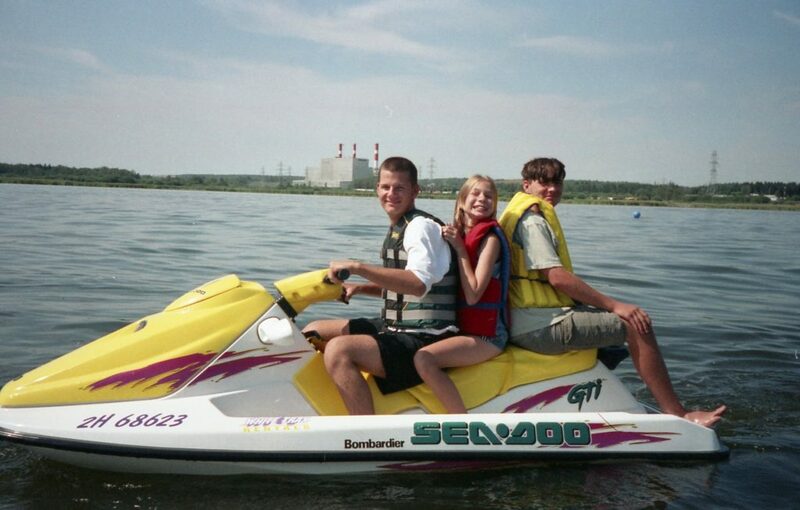 Daughter Sarah and her cousins Shaun and Eric on Wabamun Lake in the summer of 2000. The town’s dragonfly statue is made of scrap metal. 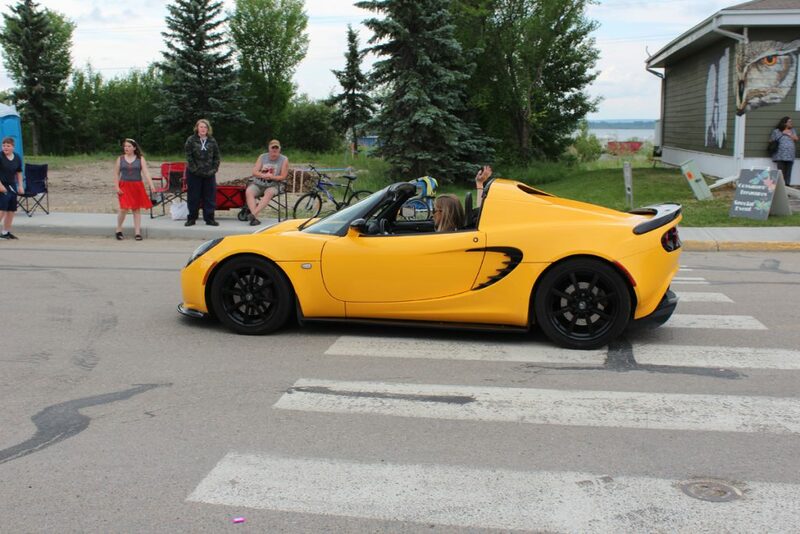 One of the high-powered roadsters in the parade. Another artist whose work I liked was Kevin Bigelow. He had a number of space related works though he had never been to Cape Canaveral. His website is Kevin Bigelow Art. 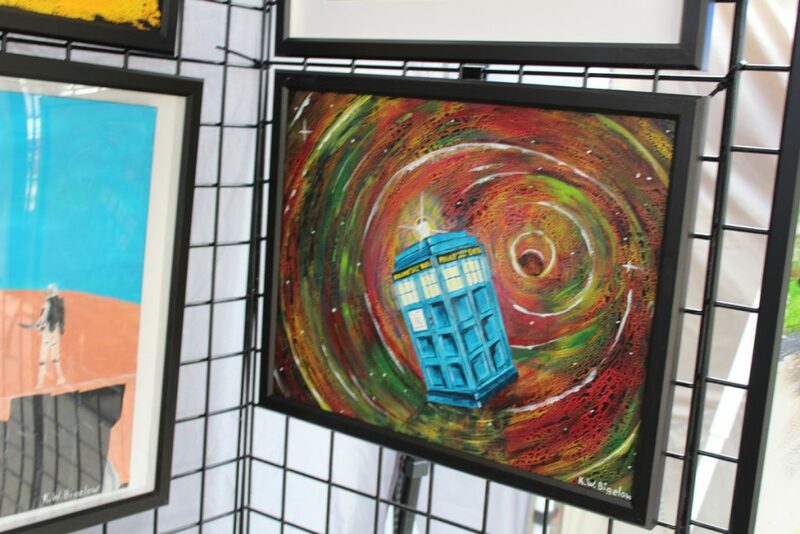 I particularly liked Kevin’s picture of the Tardis. 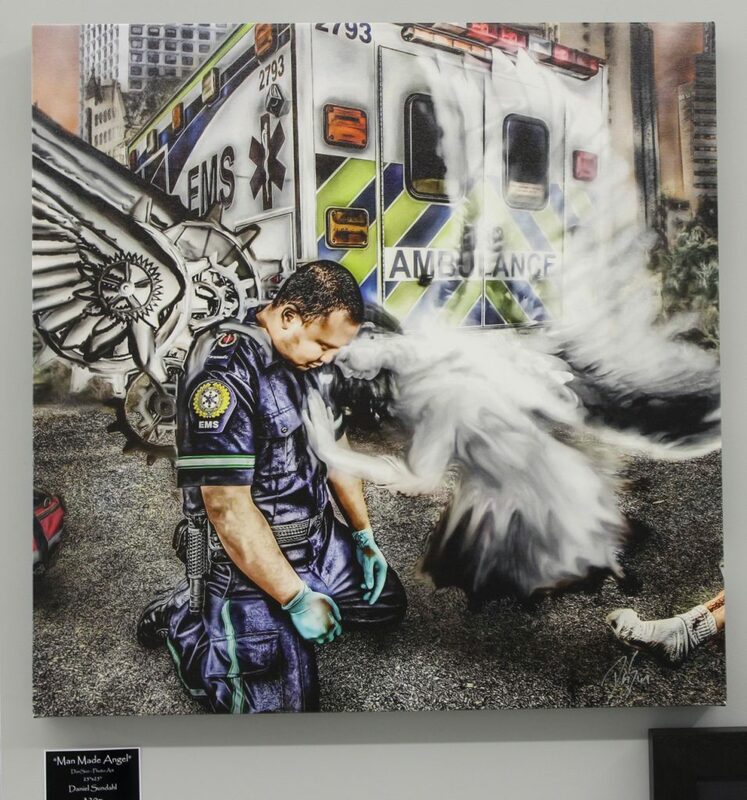 DanSun painting called Man Made Angel shows the anguish of a paramedic after he loses a patient. 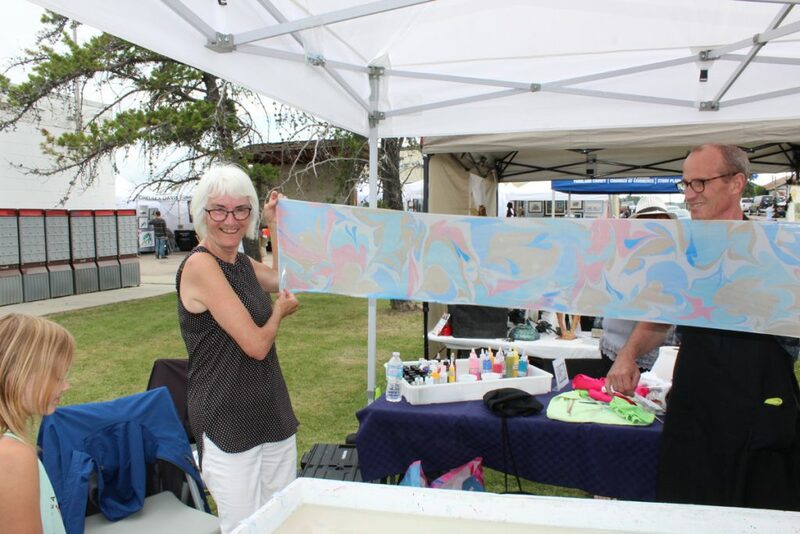 Janis showing her finished scarf – nice pastels! I just liked the name of this fish and chips stand in an old bus. Oh My Cod! When our son accepted a transfer to Regina to help open a new store we were flummoxed. 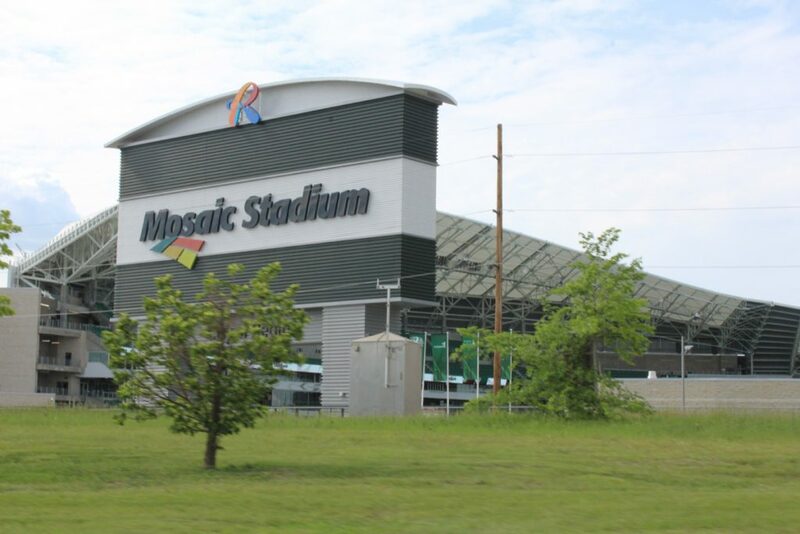 Sure it was a good career move, but why would anyone want to live in Regina? Nevertheless, I joined him to share the driving a few months ago as we embarked on the two day and a half journey from Vancouver. His company put him up in a hotel until he could find permanent digs. 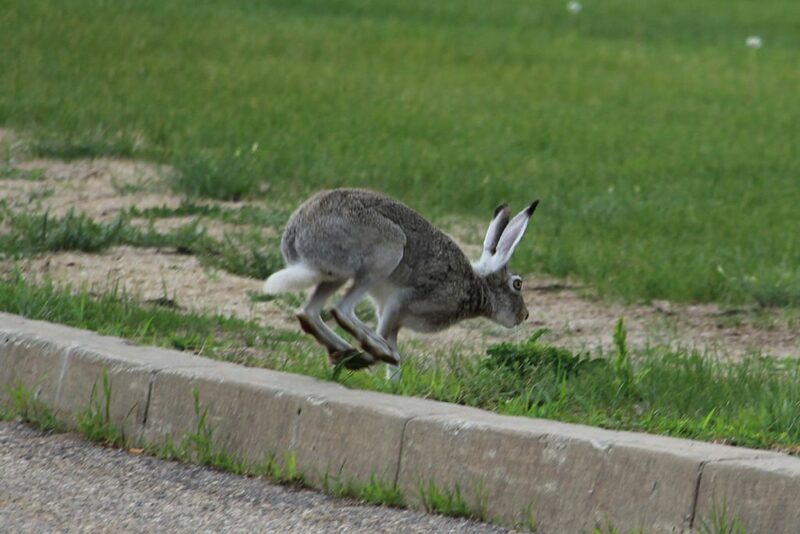 We quickly discovered one of the benefits of Regina. Within a week he had sold his one bedroom and den apartment in suburban Vancouver and bought a two bedroom townhouse with finished basement and detached garage in Regina. The price differential was enough for him to knock $15,000 off his mortgage, pay off his car, buy new furniture and still have money left over. 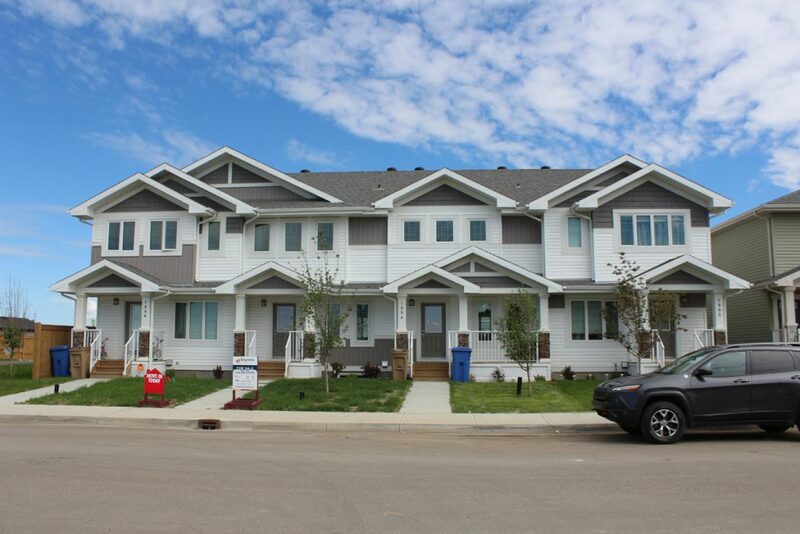 Housing is much cheaper in Regina than Vancouver, one of its advantages. My son bought this two bedroom townhouse (third unit from the left) for about 80% of what he got for his one bedroom and den apartment in suburban Vancouver. 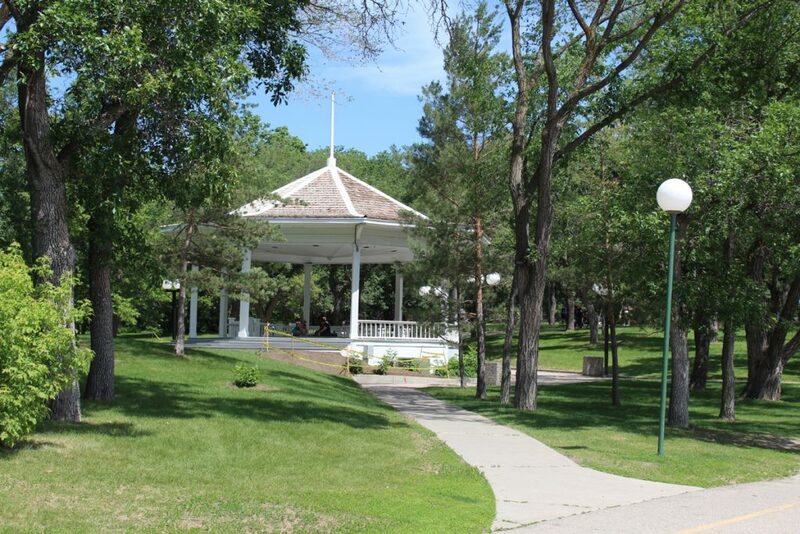 Regina is a small town compared to Greater Vancouver with a population of 236,481 for the metropolitan area. Our son’s house is in a development in the farthest western area of the city, just a 25 minute drive to his work in the farthest eastern part of the city. 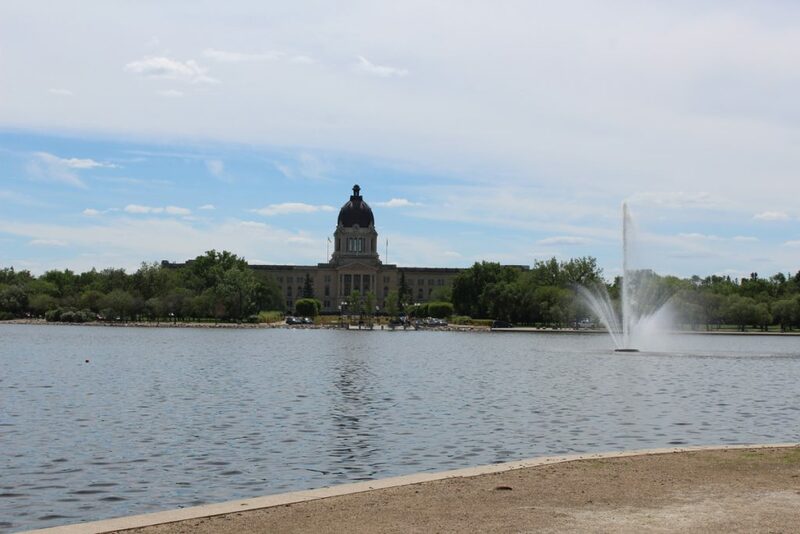 While the downtown is usually considered the heart of most cities, that is not the case in Regina. The city had already served as the capital of the Northwest Territories before Saskatchewan became a province in 1905. 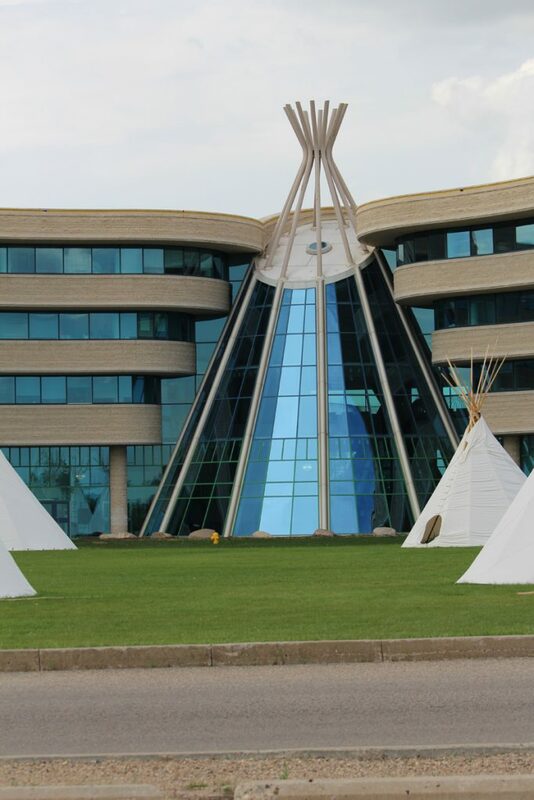 The lieutenant-governor of the territory rejected other more favorable locations for a piece of scrub land actually known as Pile-of-Bones (Wascana in Cree) “distinguished only by collections of bison bones near a small spring run-off creek”. The LG, a fellow named Dewdney, had bought property there adjacent to where the planned CP Railway line was to go. The obvious graft caused a scandal, but there was no legislature. Dewdney was a virtual dictator and could do what he liked. 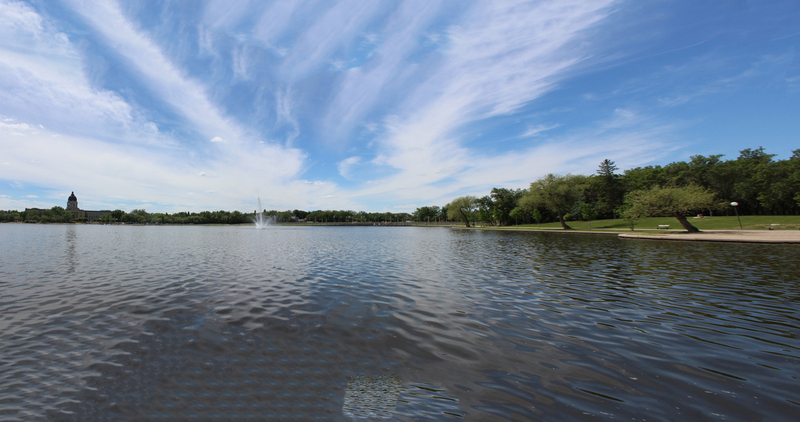 But despite its barrenness – nothing but flat prairie as far a the eye can see, visionary planners dammed Wascana Creek with a weir (it’s adjacent to the current Albert Street Bridge) resulting in the formation of Wascana Lake. 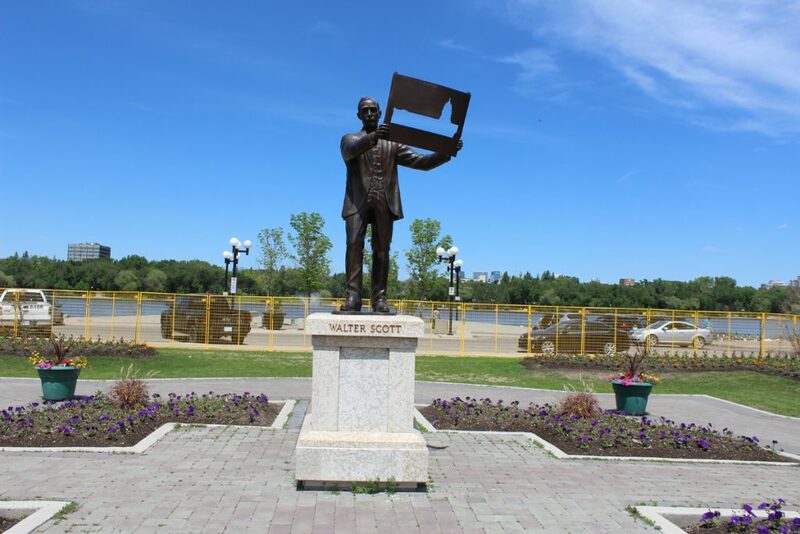 The first premier of the new province, Walter Scott, had a vision of a legislature building on the shore of Wascana Lake, then a wilderness a few kilometers from the downtown area. A design competition was launched and the winning design by Montreal architects, the Maxwell Brothers, was chosen. 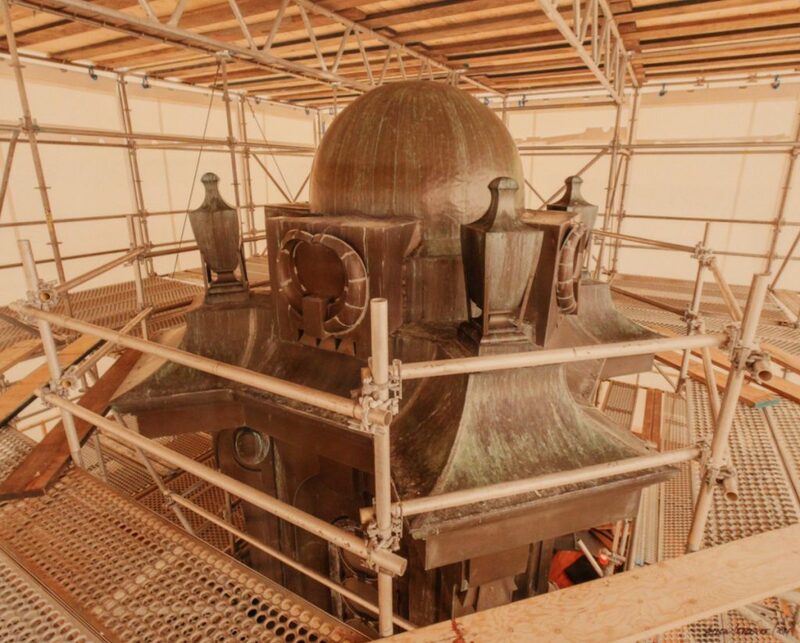 Construction began in 1908 and was completed in 1912 at a cost of $1.75 million. That’s about $800 million today. 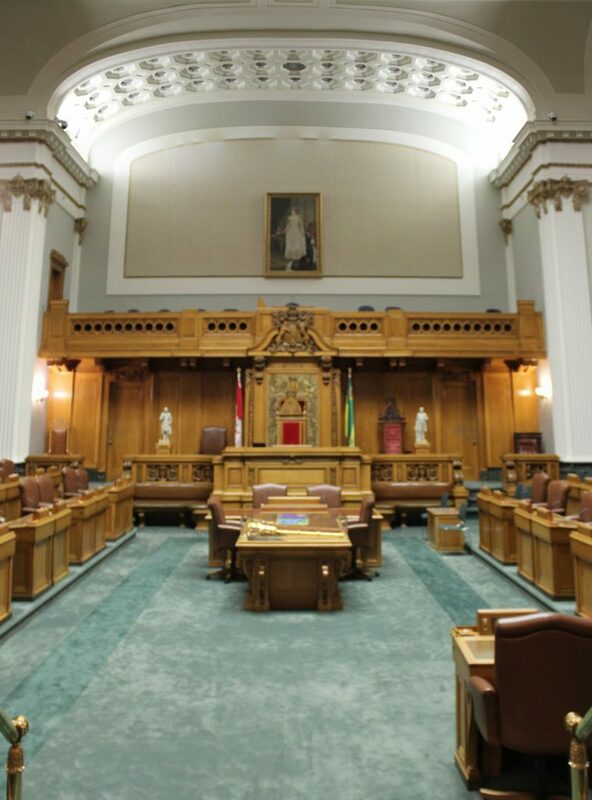 It remains the largest of the provincial legislatures in Canada. My wife and I took a walk around the shore of the lake across the bridge to the other side and back before touring the legislature itself. Tours are free. 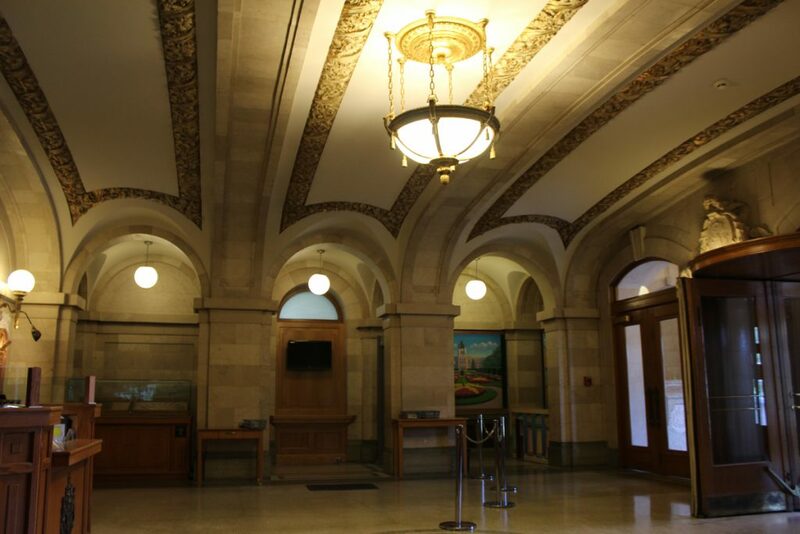 Immediately upon entering the building one is impressed by the richness of the entrance. Our guide took us up the steps to the rotunda which features marble from around the world. 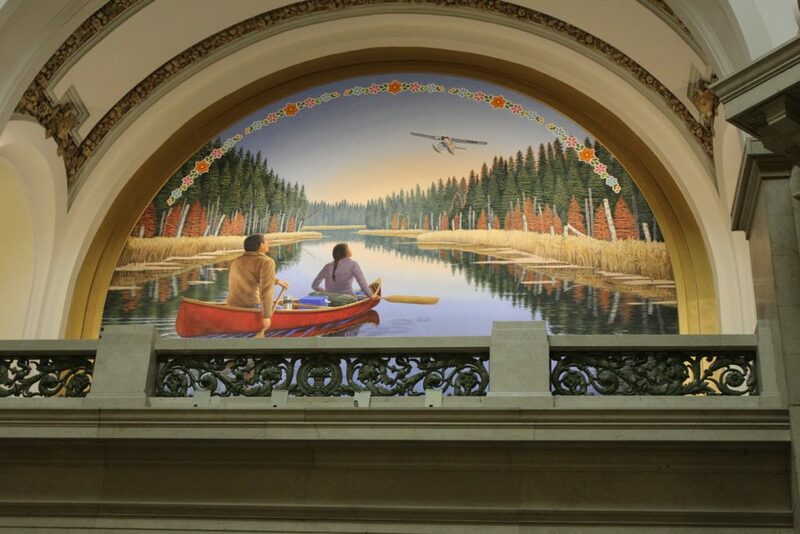 The rotunda also features two murals high above. 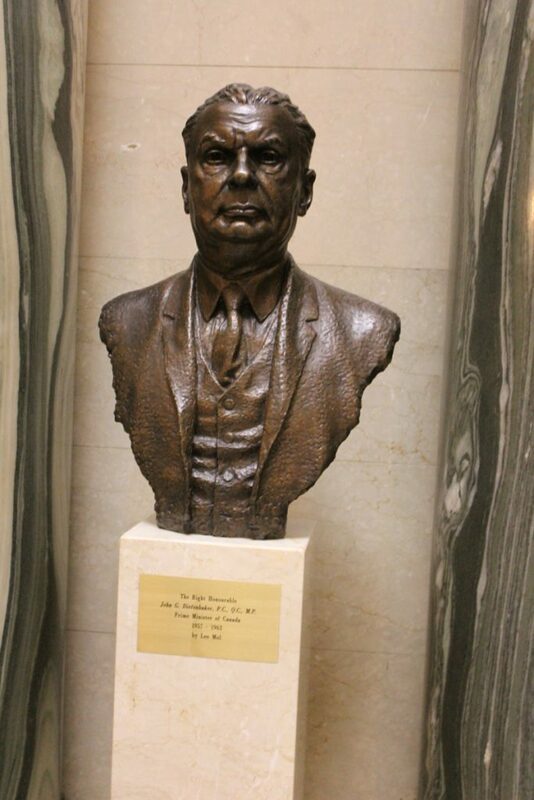 And it features the busts of three Saskatchewan political icons – each from a different political party. From there we were given a look into the legislative chamber. 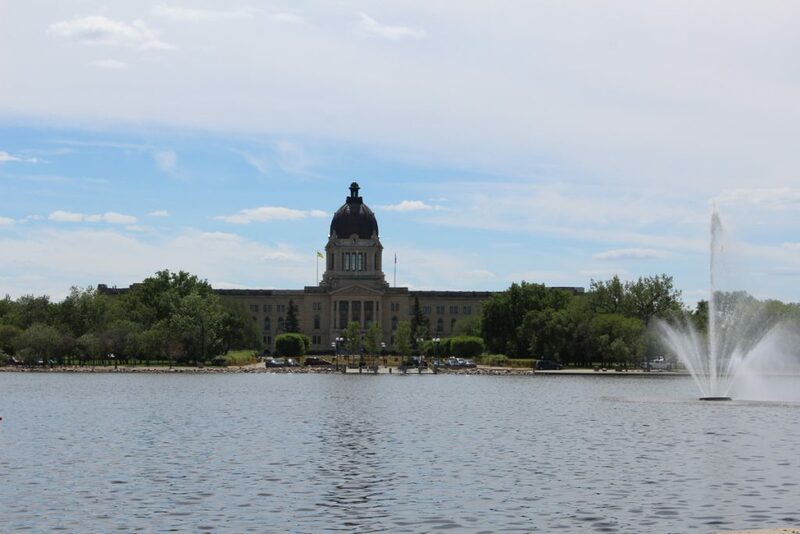 Scott and his fellow politicians had a much bolder vision for Saskatchewan than eventually transpired and the legislature was built to accommodate 125 members. In fact, the population has not grown as expected and the number of representatives currently stands at 58. From the floor of the legislature we went down a flight of stairs to the legislature’s library. 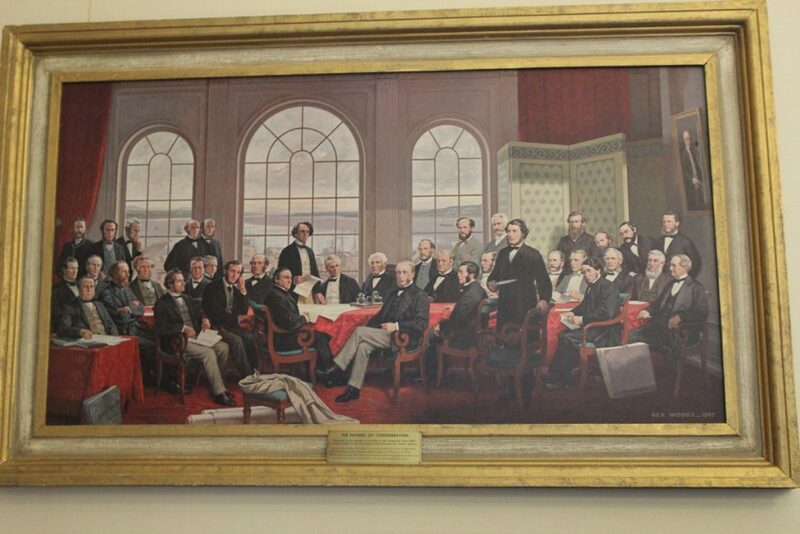 There was someone using it at the time so I couldn’t take a picture, but I did get a photo of an historic Canadian artifact housed there – the conference table used at the Quebec Conference in 1864 when the Fathers of Confederation were negotiating Canada’s independence. Whether this is the actual Confederation Table is speculative. What is known is that it was used by the Privy Council in Ottawa in 1865 after being moved with other furnishings from Quebec. And it was the right size to have been the original table. Lieutenant-Governor Dewdney brought the table to Regina sometime between 1883 and 1892. The sixteen foot table wouldn’t fit in the room assigned for it and six feet were lopped off in the middle. That part of the table was discarded. 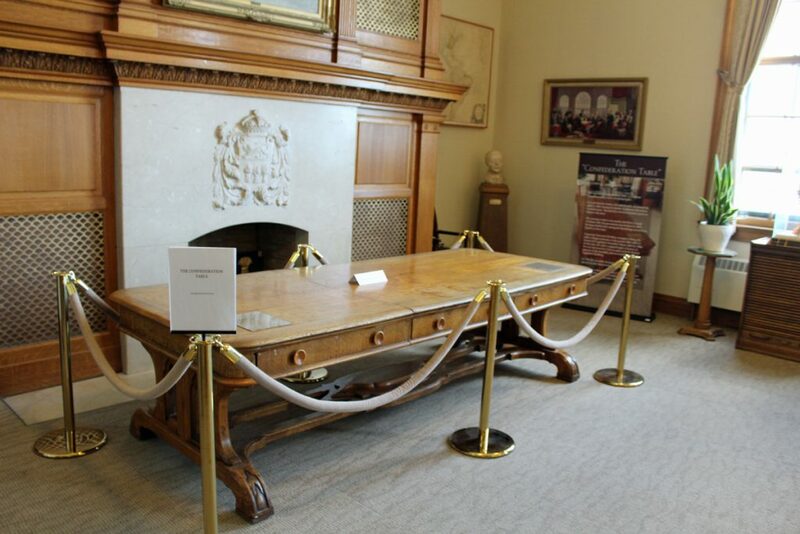 Eventually the shortened table was brought to the legislature library where it now resides. Continuing our tour we visited two galleries. 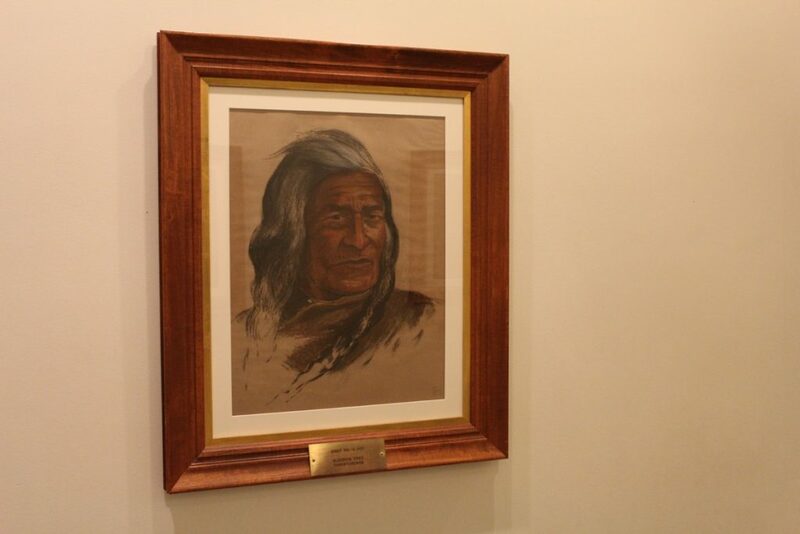 Saskatchewan has had a long history of cordial relations with indigenous peoples and in 1909, the government commissioned noted portrait painter Edmund Morris to do portraits of fifteen native chiefs. 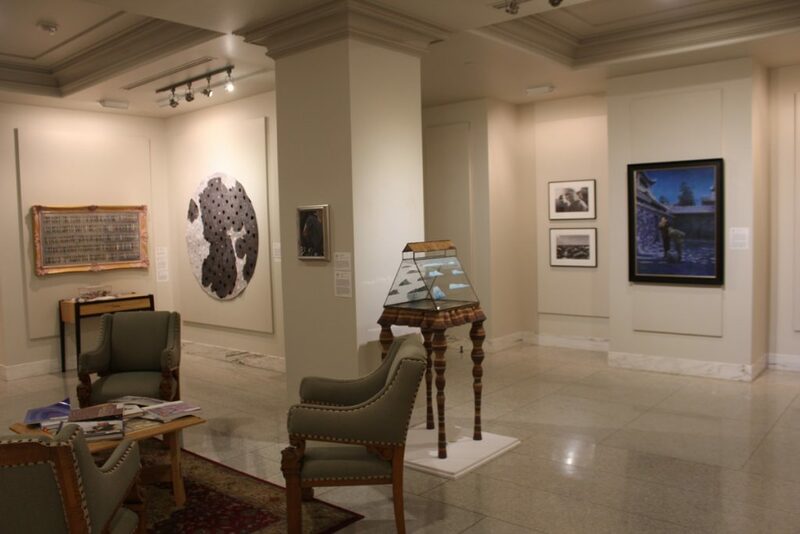 Those pictures hang in the Assiniboine Gallery. 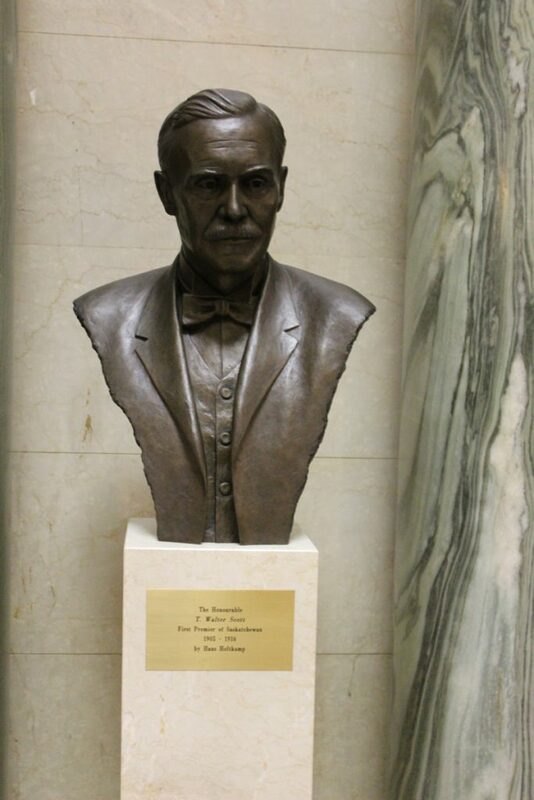 Morris was the son of Alexander Morris, the Lieutenant Governor of Manitoba who was responsible for negotiating many treaties with indigenous peoples. 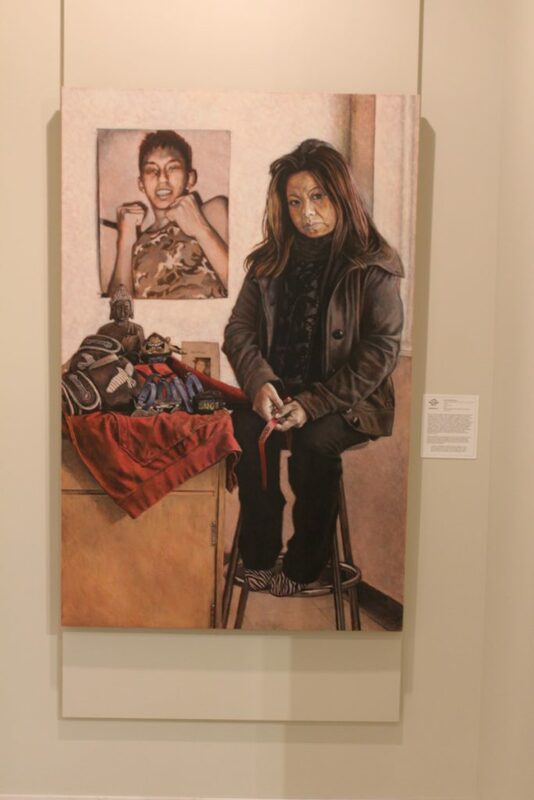 He had previously been commissioned by the Government of Ontario to do portraits of the Ojibway in the north of that province. 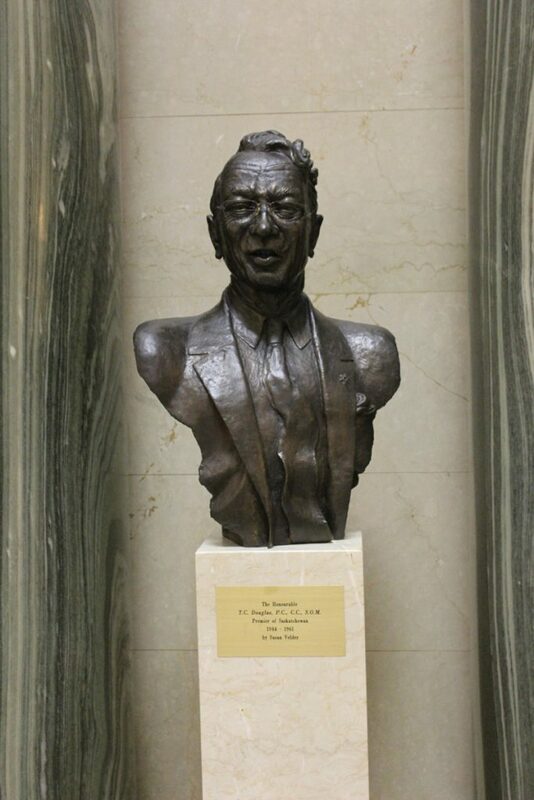 He also did similar work for the Government of Alberta. 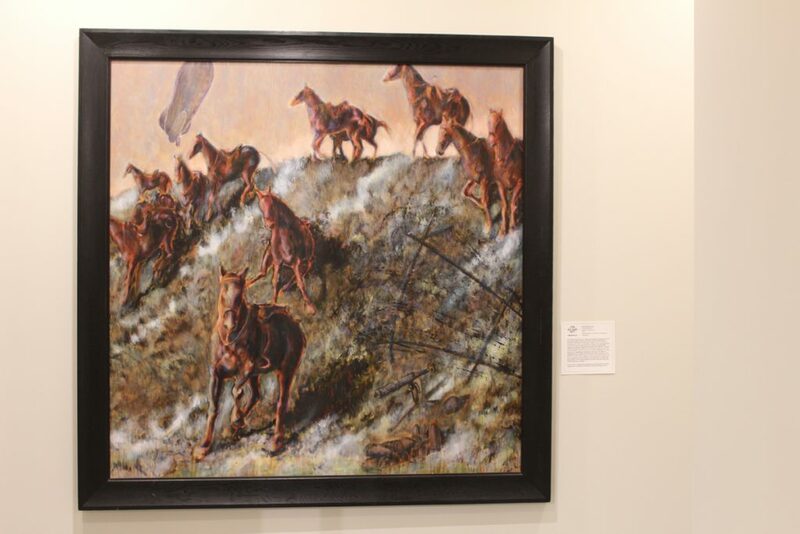 His paintings are considered historically significant records of native history in Canada. 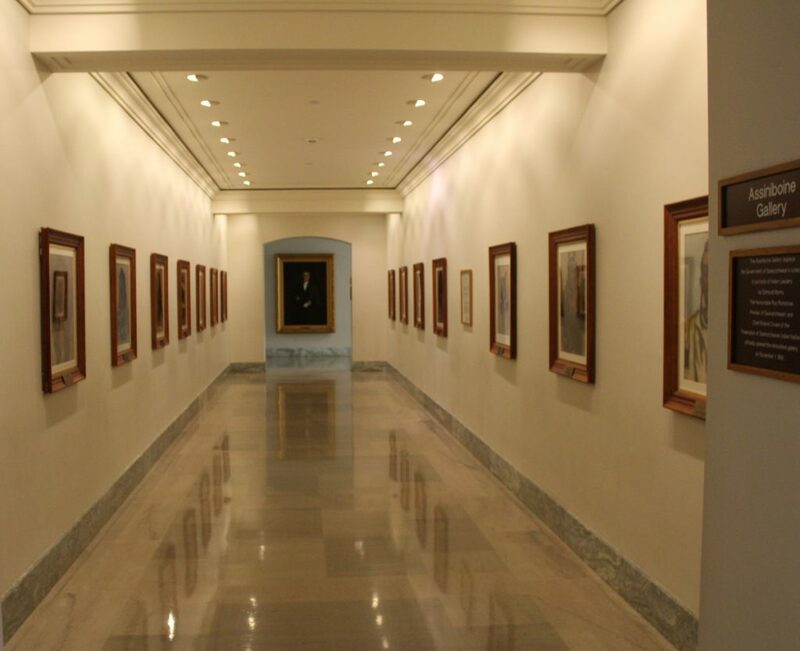 The other gallery featured portraits of the premiers of Saskatchewan. 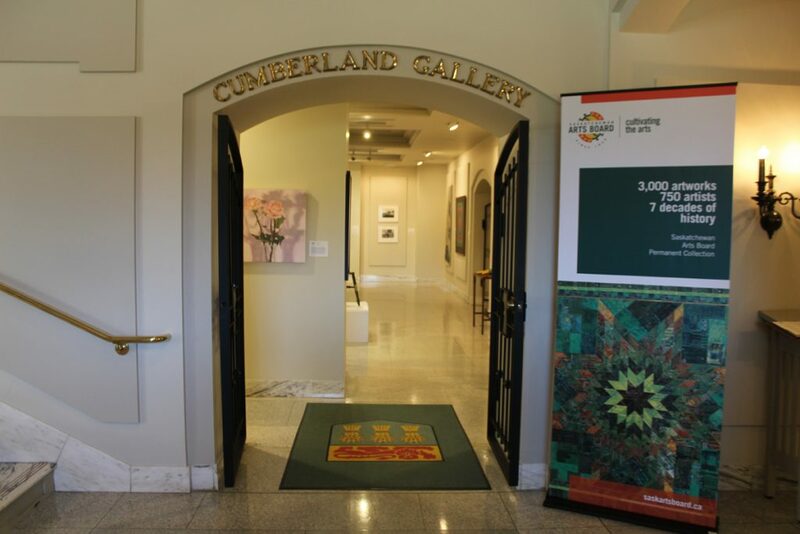 We ended our tour at another gallery, the Cumberland Gallery. 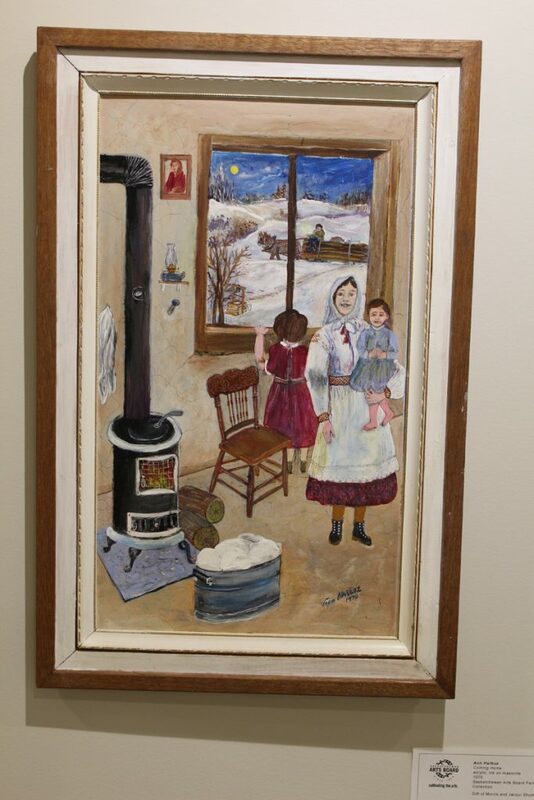 Displays vary but when we were there it featured some works from the Saskatchewan Arts Board which has been promoting art in Saskatchewan since 1948. 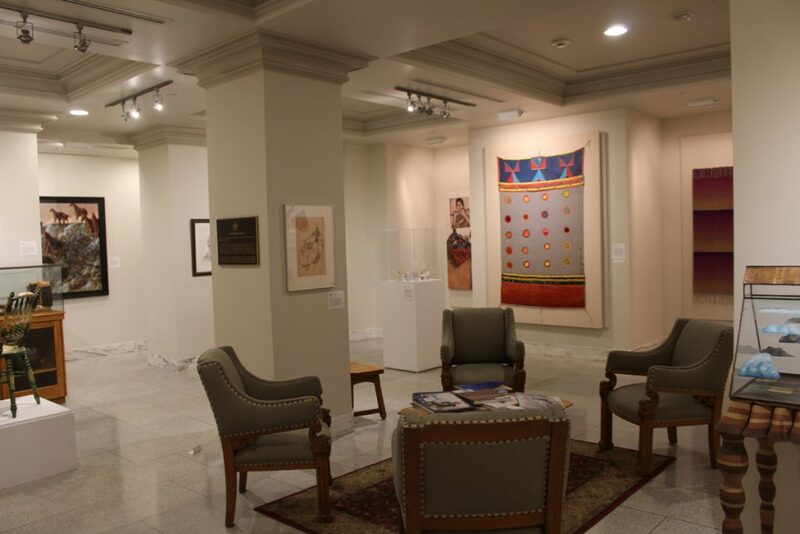 They have over 3000 works in their permanent collection. There were some striking works on display. One of the more intriguing was by Zhong-Yang Huang called Two Dream Walkers by Zhen Fei Well. It was striking because it seemed almost out of place among the more traditional works on display. There is a story behind the painting, of course. Huang was born in China and showed an aptitude for art from age four. This talent was stifled by the Cultural Revolution which discouraged individual creativity. The fifteen year old Huang was forced to work as a laborer. After the Cultural Revolution, Huang continued his studies, earning a Masters Degree in art. In 1984 he traveled to Canada and earned a second Masters at the University of Regina. 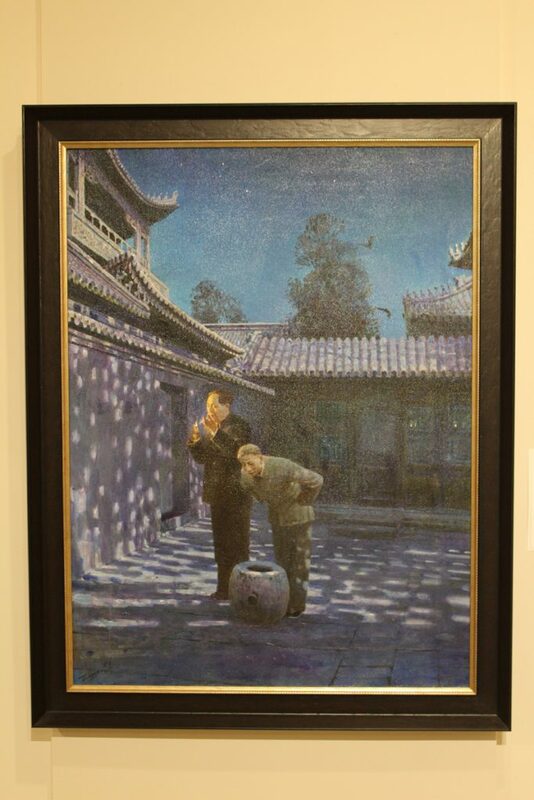 Two Dream Walkers by Zhen Fei Well was part of a solo exhibition in 2011 called The Shadow of Mao. It shows Chairman Mao having a smoke while Liu Shaoqui, Chairman of State and the second most powerful man in China at the time, looks down the Zhen Fei Well. Let’s return briefly to Wescana Centre. The hub of the city revolves around Wescana Lake. 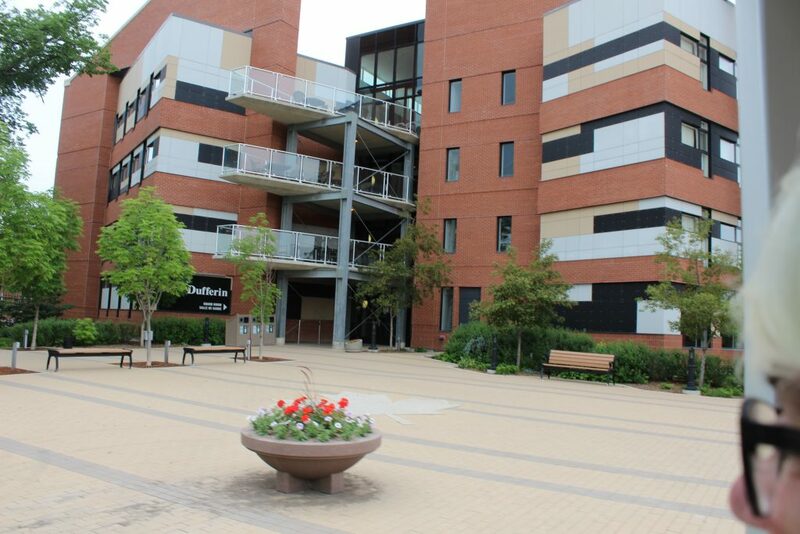 In 1962, the University of Regina needed to expand. It needed a site for that expansion and decided on an area south-east of the lake. In conjunction with the province and the city, the Wescana Centre Authority was formed to create a multi-use oasis in the centre of the city. 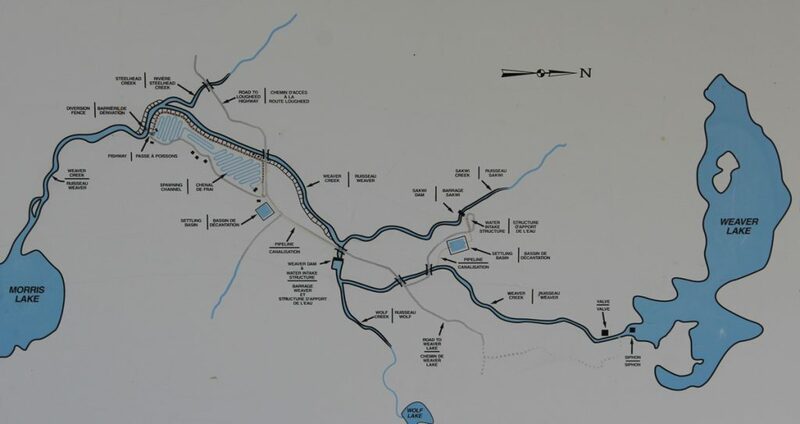 The result was a 930 hectare (2300 acre) area surrounding the 120 hectare (300 acre) lake. 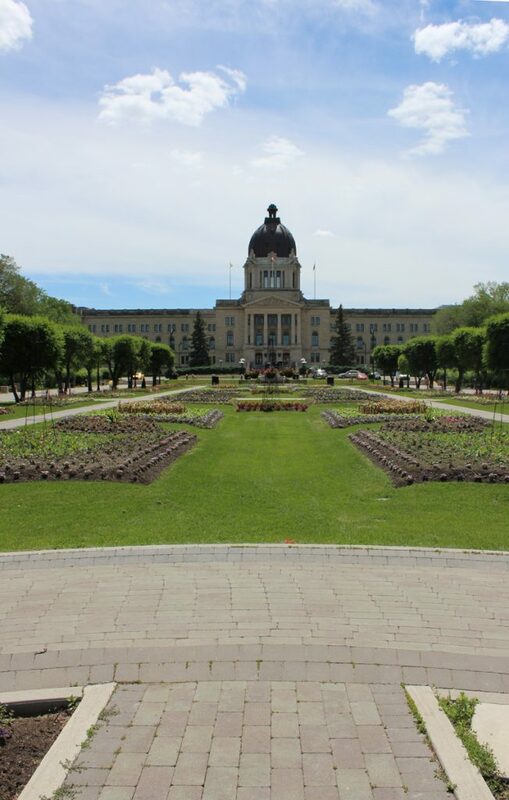 This green space includes the legislature as well as the university, and also includes two art galleries, a performing arts centre, a science centre, a museum and lots of parkland. 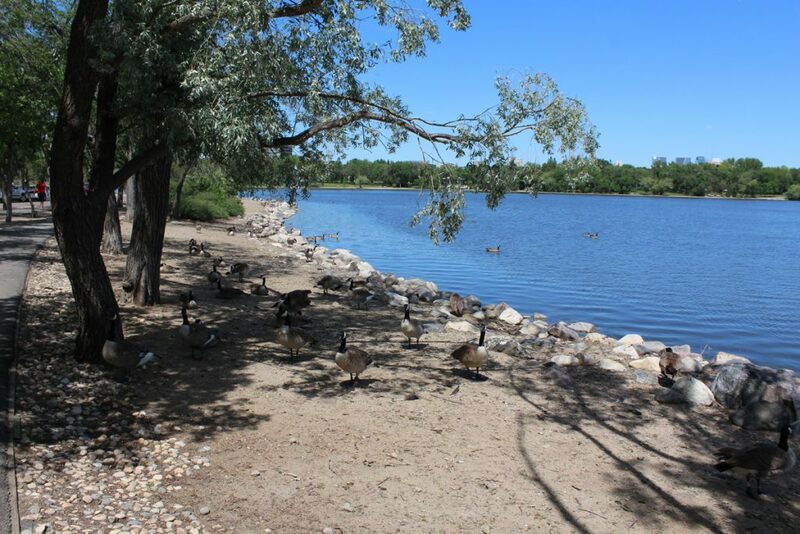 Wescana Lake is also a wildlife preserve and has an abundance of wildlife including Canada geese and a critter that is as common as raccoons – the jackrabbit. By the late 1990s, however, silt had built up enough in the lake that it started to turn into a swamp. A major project dubbed The Big Dig was undertaken in 2003. A large part of the lake was dredged to a depth of five and a half metres, a depth at which weeds cannot root. 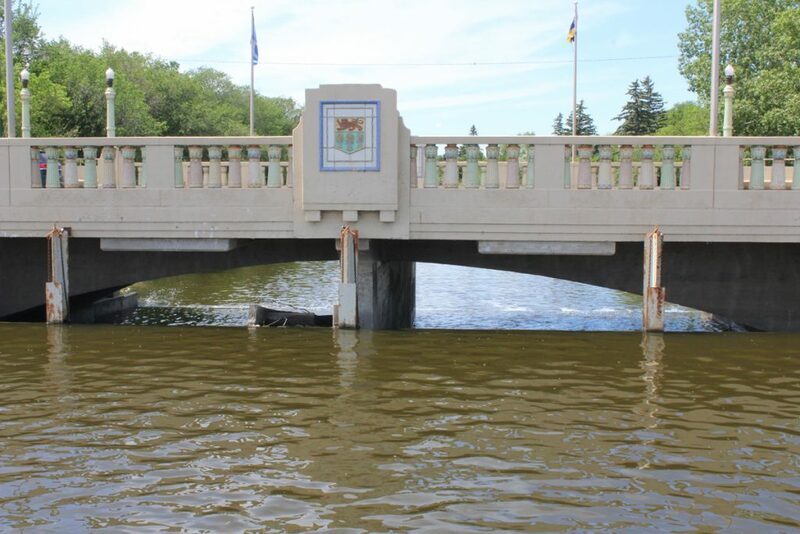 One area was dredged to seven and a half metres so that northern pike and perch could survive Regina’s cold winter. Boardwalks and other amenities were added. Today Wescana Centre is the rejuvenated heart of the city. An oasis in a flat prairie of wheat fields. You’ll find more pictures on the following photo gallery. 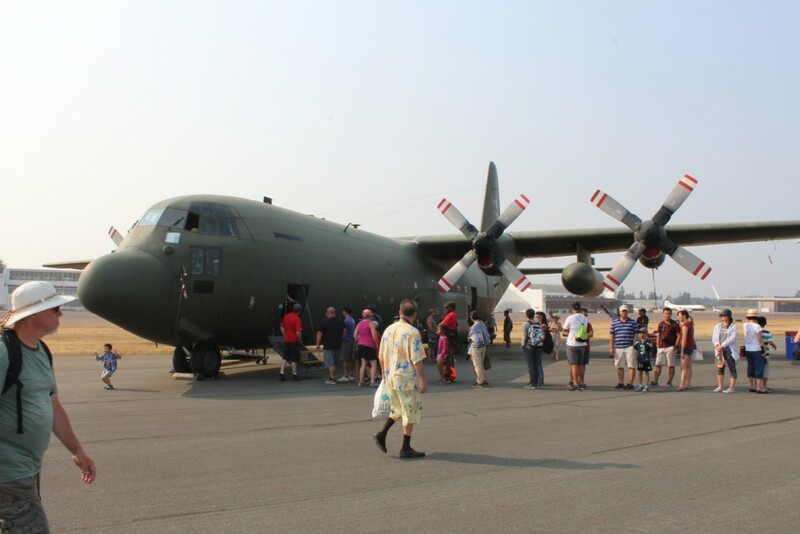 This year marked the 55th annual Abbotsford International Airshow. I first attended one shortly after I moved to B.C. in 1974 and have attended several times since then. When I was single we’d cram a bunch of us into a car and go together for a day. Later my wife and I took the kids to see the show every few years. But it had been over a decade since we last attended. 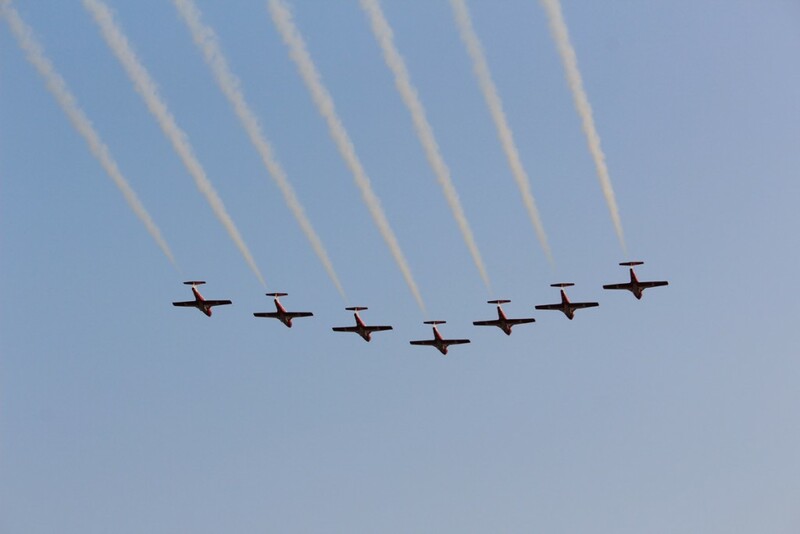 Now living in Abbotsford, we were sometimes entertained by mini-airshows as the jets, including the fabulous Snowbirds, sometimes roared right over our townhouse complex. But this year I really wanted to see the show right at the runway again. 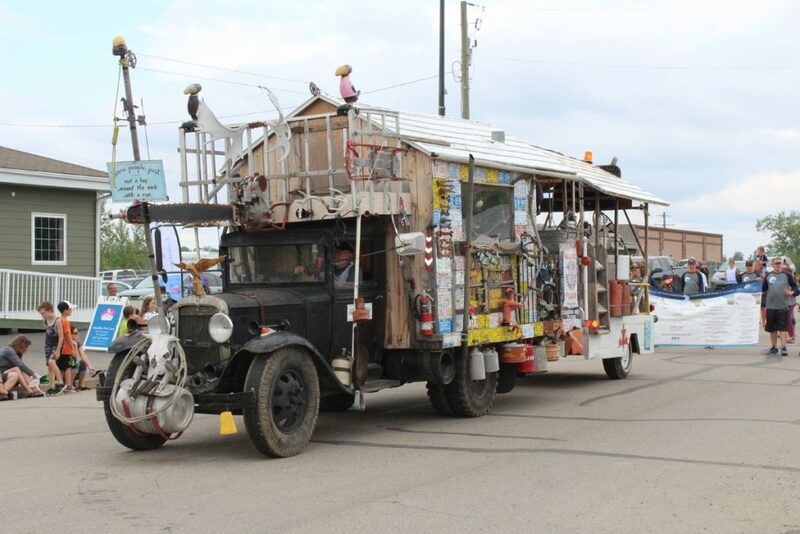 The annual event runs for three days – always a Friday, Saturday and Sunday in mid-August. 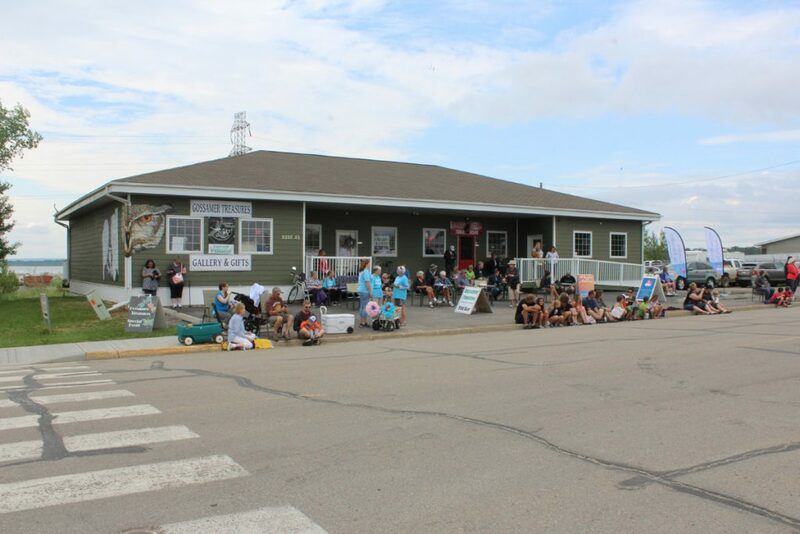 This year the Friday show was an evening affair, with gates opening at 3:30 PM and the show ending around 10:30 PM. 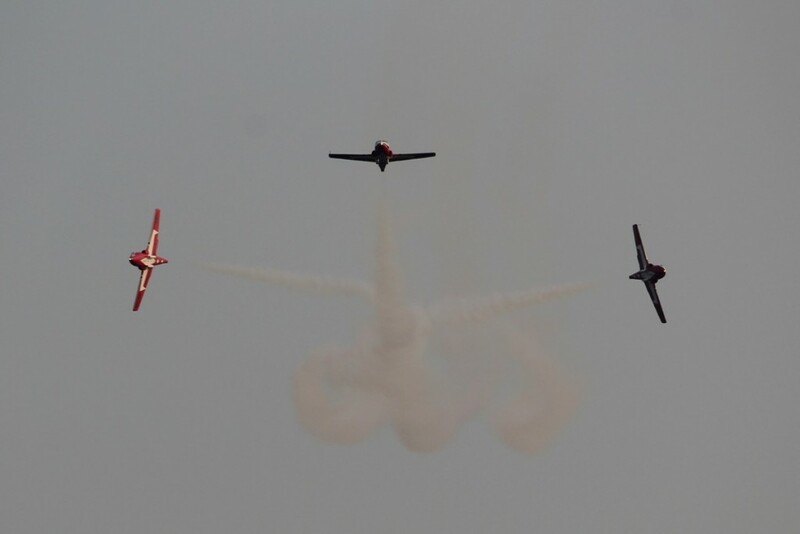 We had never been to an evening airshow before, which promised some pyrotechnics as well a aerobatics, so we packed a bag with a couple of sweaters and headed out. We bought our tickets at Save-on-Foods to save the hassle at the entrance and it’s a good idea to save money as well. Gate price per ticket was $30. At Save-on-Foods, only $25. We avoided the major crunch point by taking Townline Road to a back entrance. We were through the gates in minutes. Lots of volunteers directed traffic to the parking area. Once inside we looked around and found one of the two runway seating areas. For an extra $10 each you could get close to front row seats. We opted to pay the extra since we hadn’t brought folding chairs or a blanket. Since it was numbered seating, we found our places, and then headed out to see the static displays. 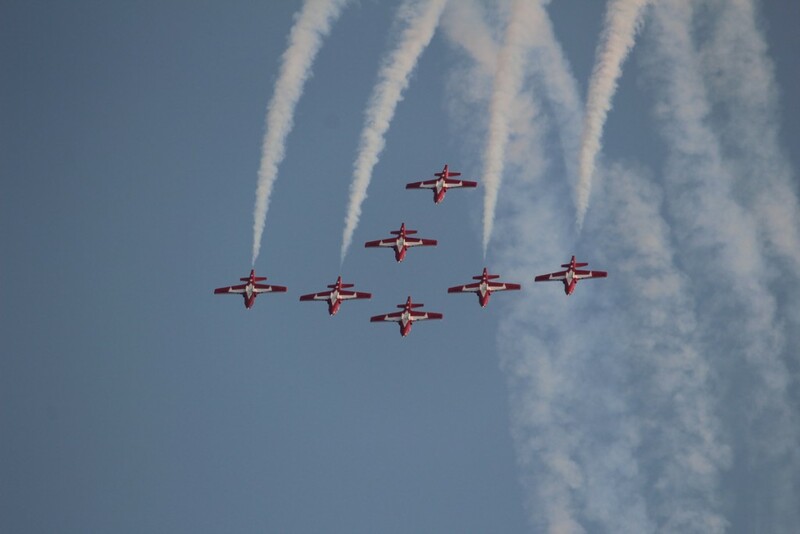 The Abbotsford International Airshow was designated as Canada’s National Airshow by the late Prime Minister Pierre Trudeau. 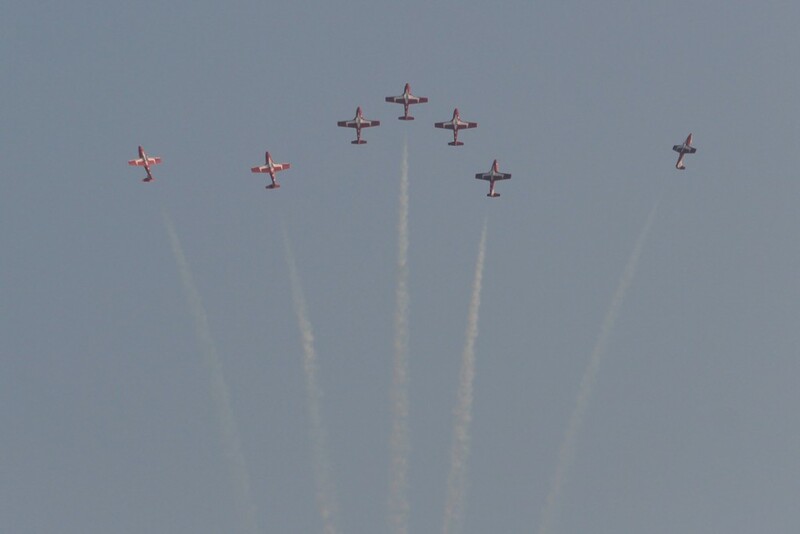 It always features both civilian and military aerobatics as well as static displays. 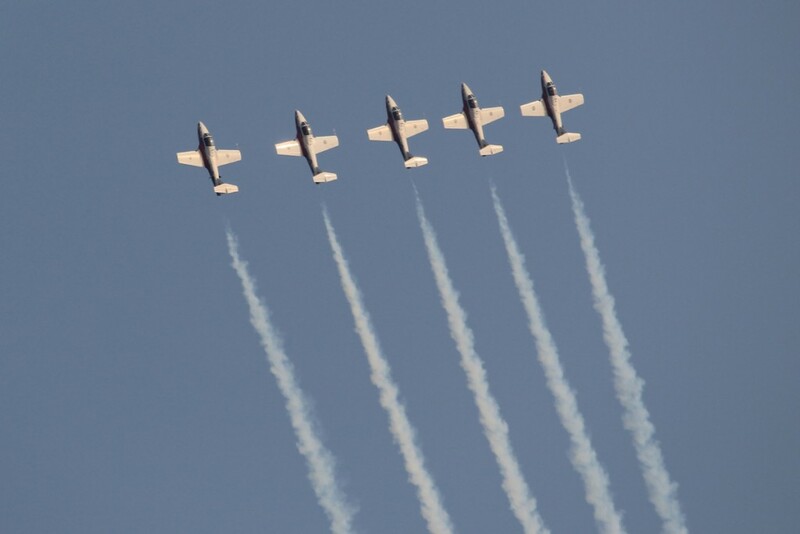 Whether you like barnstormers in their biplanes, hang gliders, sailplanes, powerful air force jets or aerobatic teams, the Abby Airshow has it all. 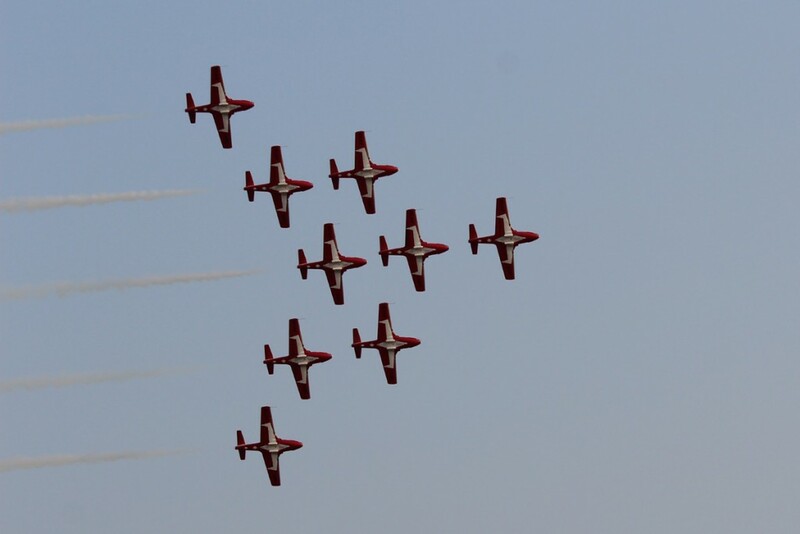 The Canadian Forces Snowbirds are always a major attraction and visiting aerobatic teams are often featured as well. On the ground we got a good look at some of the active and historical planes on display. 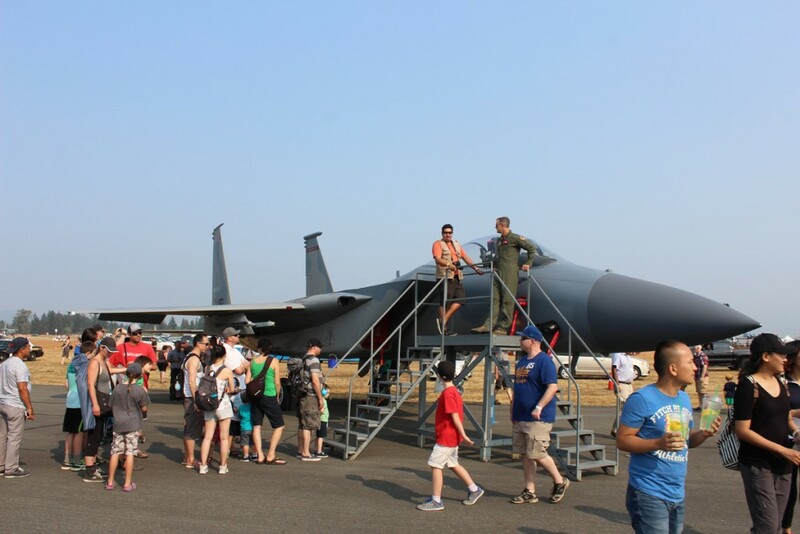 The Americans had a couple of F-15s on display and you could go up a ramp to check out the cockpit on one of them. Eager spectators had a chance to check out the cockpit of an F-15 Eagle at this year’s airshow. 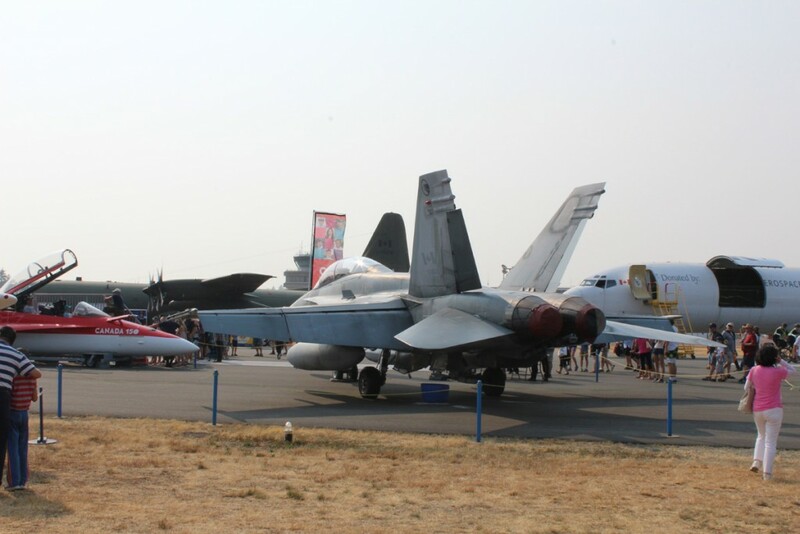 Also on display – a CF-18 Hornet. One decked out in special Canada 150 celebration colours would fly later in the show, but here you could sit in a simulated cockpit if you wanted. 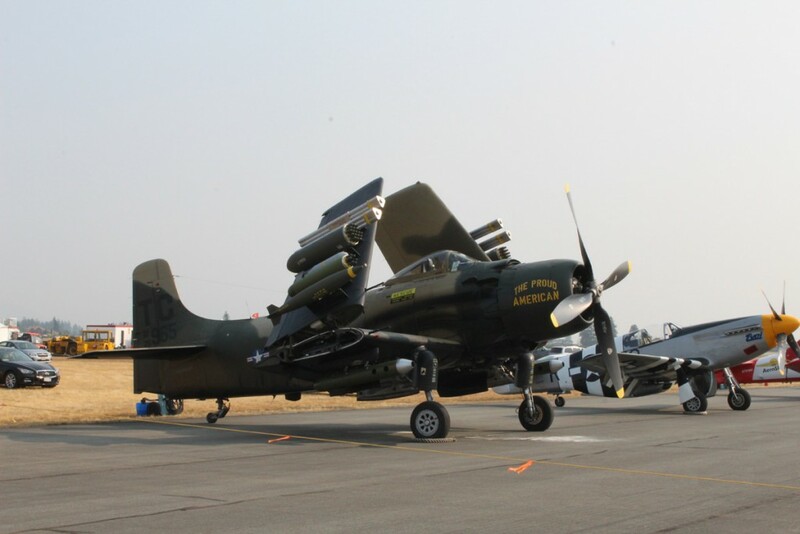 There was also a giant troop carrier, a mid-air refueling plane from the American 912th Refueling Squadron, a number of private planes – trainers and stunt planes, and a row of historic planes that included the fearsome looking Douglas A-1 Skyraider aka The Proud American. The wings were folded up on the display which gave you a good look at the gatling guns and missile launchers. 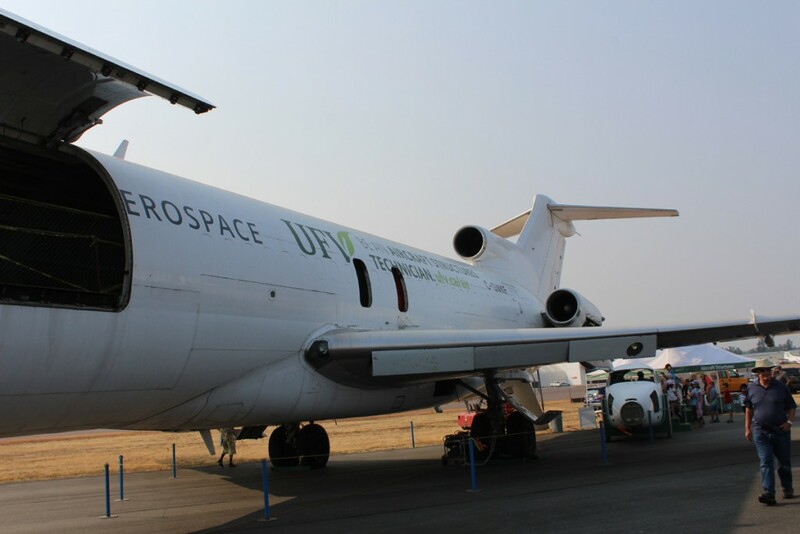 The plane was used by the US Marines, Navy and Air Force as well as the French Air Force and the South Vietnam Air Force from the late 1940s through the 1980s. As a prop plane it was a bit of an anachronism in the age of jets. 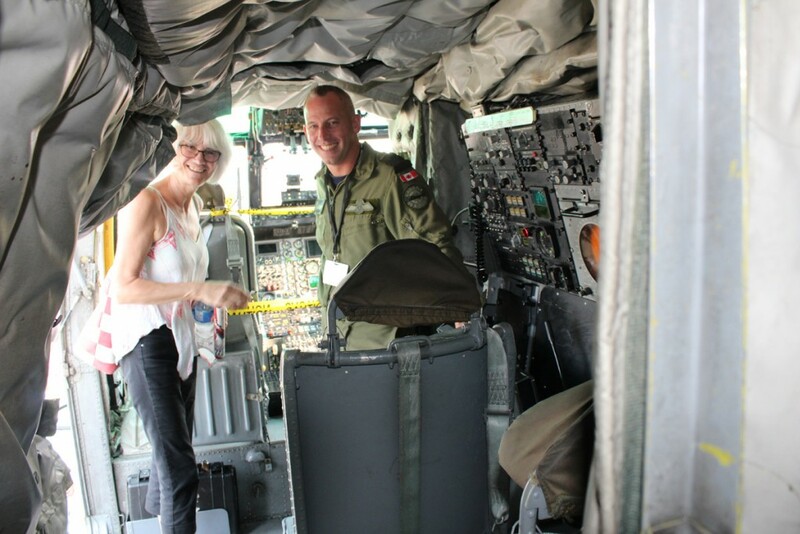 The only exhibit we actually entered was the Canadian Forces Sea King helicopter. This aging helicopter has been a political football for years with efforts to replace it with newer equipment being stymied again and again. 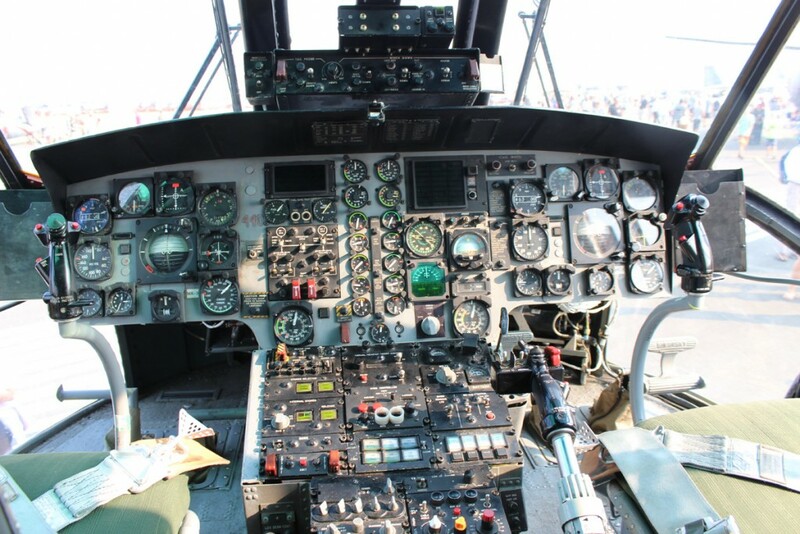 This particular Sea King first saw service in 1968 – that’s an old chopper! The crew members told us it is primarily used as a submarine spotter and also does a lot of search and rescue work. As an anti-sub craft, it is equipped with torpedoes. 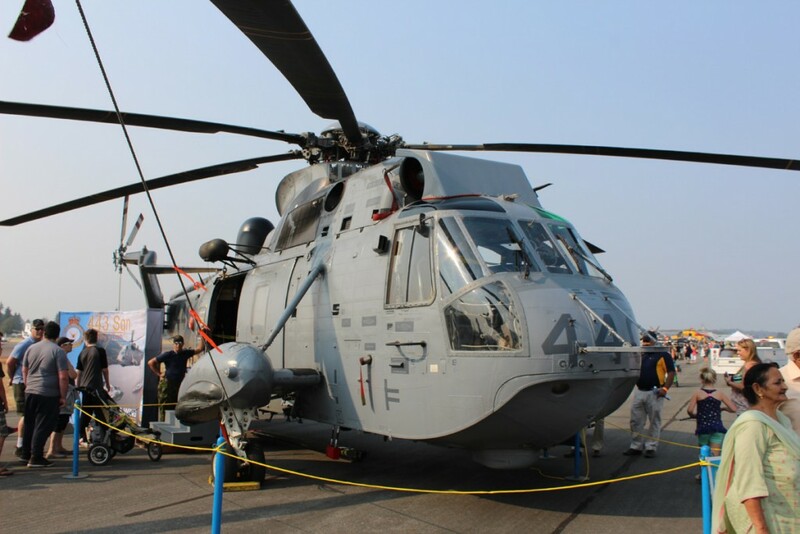 And we were surprised to learn that the Sea King is capable of carrying nuclear warheads. 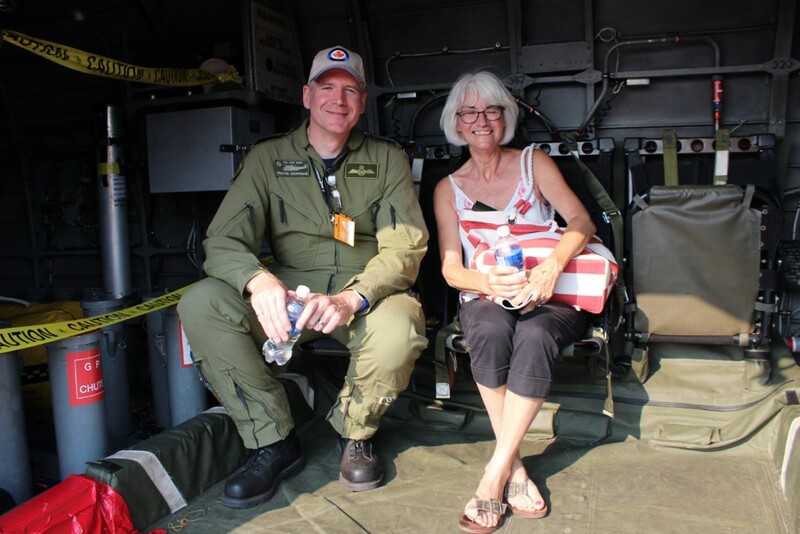 Janis in the jump seat beside crewman Travis Chapman. 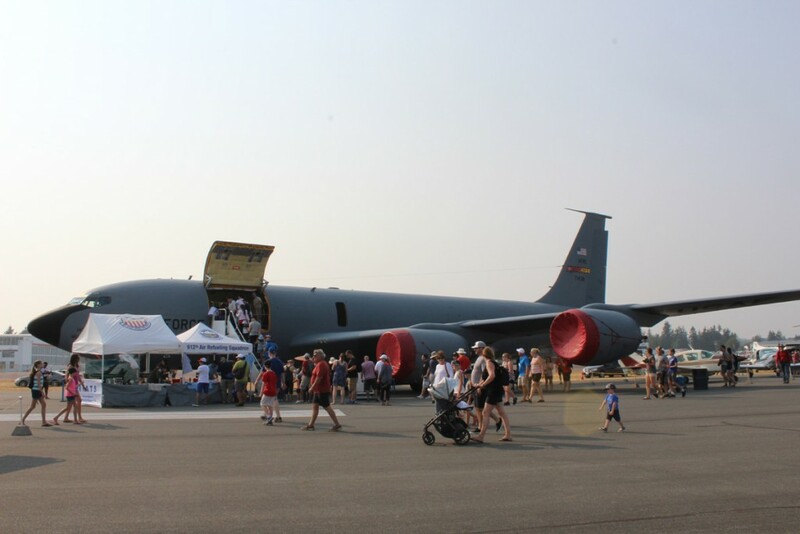 A separate photo gallery will have more pics from the static displays. After seeing the ground exhibits we went back to our seats for the start of the show. 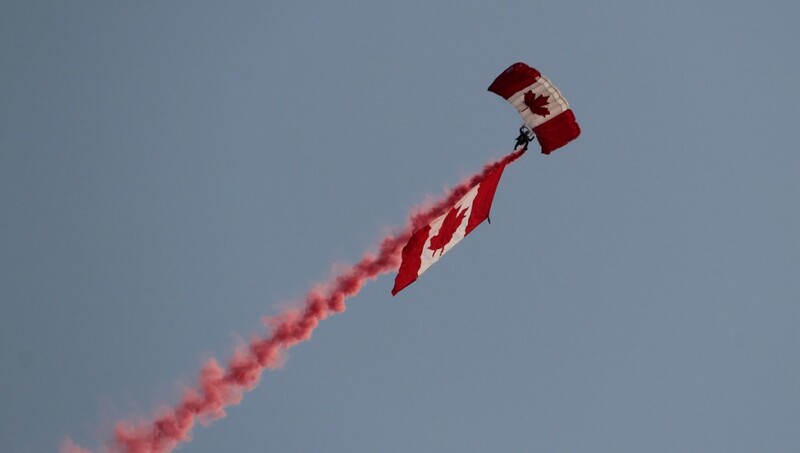 The Skyhawks, the Canadian Armed Forces Parachute Team, led off the show with displays of the Canadian and American flags while the anthems were sung. They followed that up with some entertaining stunt parachuting. 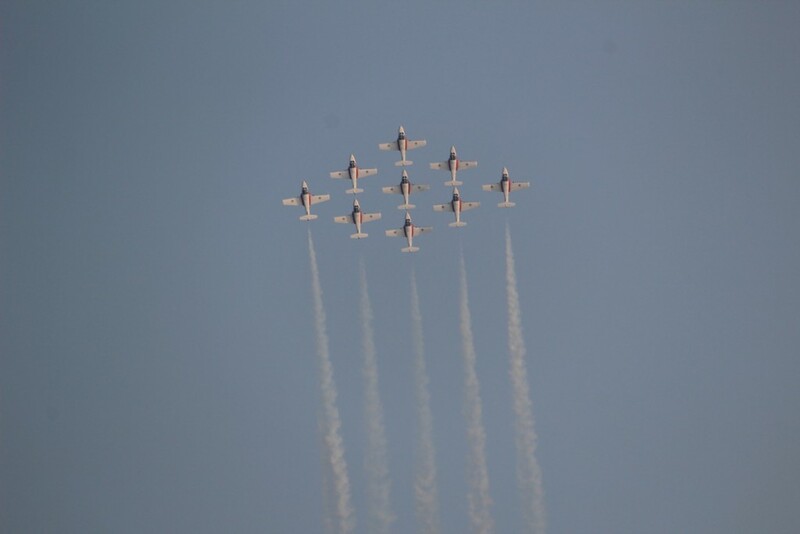 Then the headline performers – the Snowbirds. 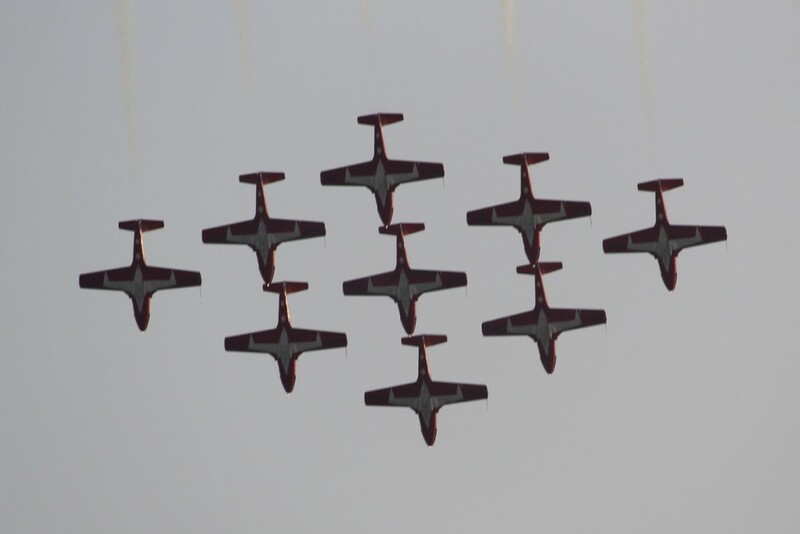 These nine planes are the show closer during the daytime shows. For the evening show they were first up after the Skyhawks. I took a lot of photos and will feature a number of them in a separate photo gallery. 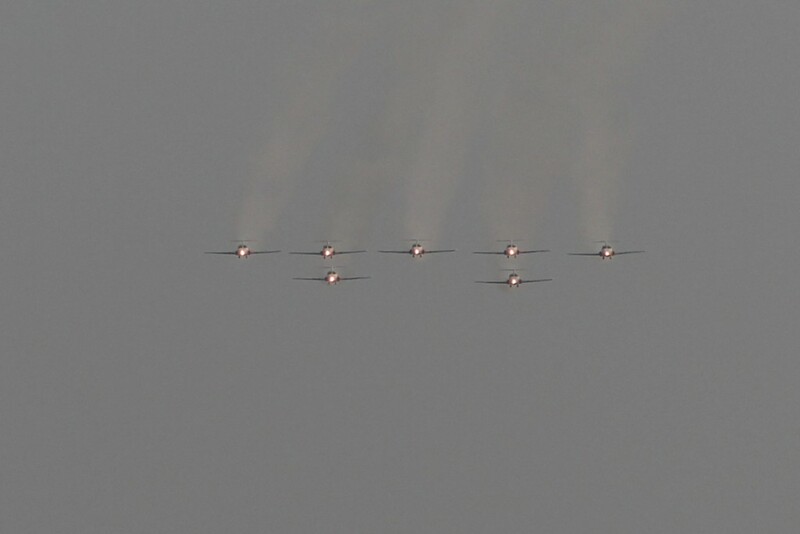 I tried filming the Snowbirds but in movie mode, my camera uses the view screen instead of the viewfinder and it was impossible to get the planes properly centered with the glare reflecting off the screen. But I did film them in 2004 which I’ve linked below. 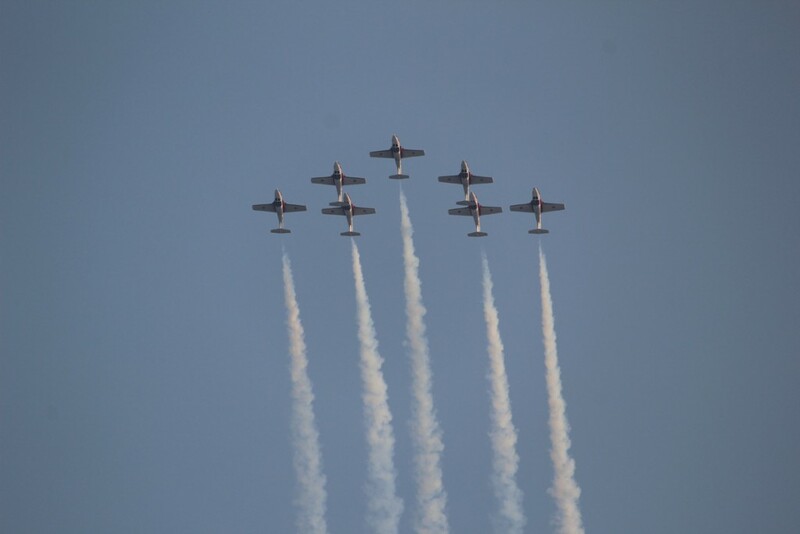 After the Snowbirds, we were entertained by the Heritage Flight, four fighter planes from four eras strutting their stuff, individually and together. They included the P-51 Mustang which saw duty in WWII and Korea. The F-86 Sabre was the first swept-wing jet fighter and was used in high-speed dogfights in the Korean War. It was use by the Bolivian Air Force until 1994. The F-16 Viper, also known as the Fighting Falcon, has been in production since 1976 and was used in Desert Storm. 25 different countries use the F-16. The F-35A Lightning II is the newest fighter jet, seeing service with the U.S. Marines since July 2015 and combat-ready with the U.S. Air Force since August 2016. 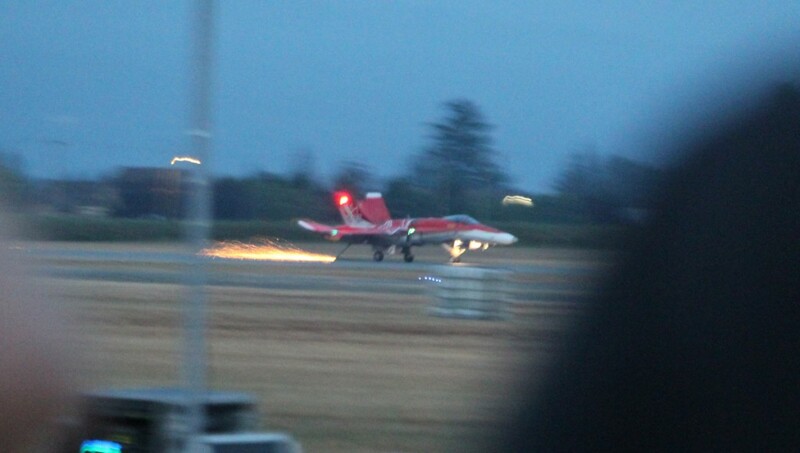 It was the fastest jet on display and the roar of its engines as it hits the after-burners is awesome. 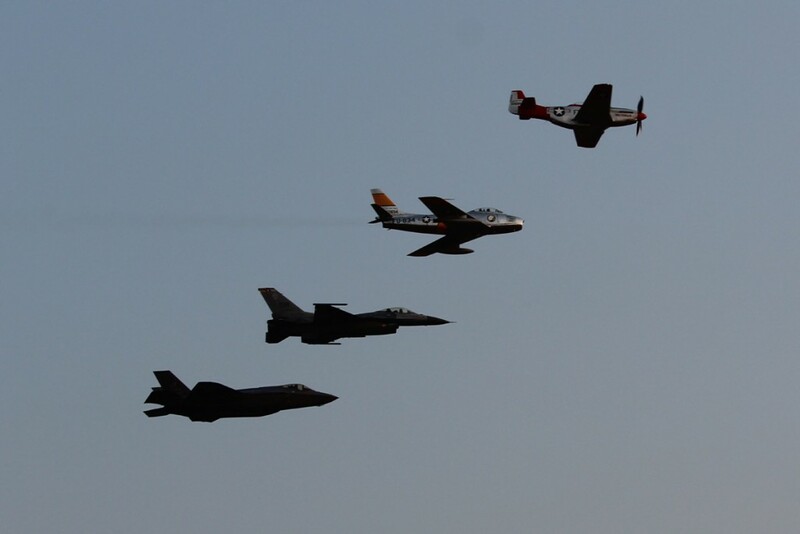 Heritage Flight – top to bottom – P-51 Mustang, F-86 Sabre, F-16 Viper, and F-35A Lightning II. 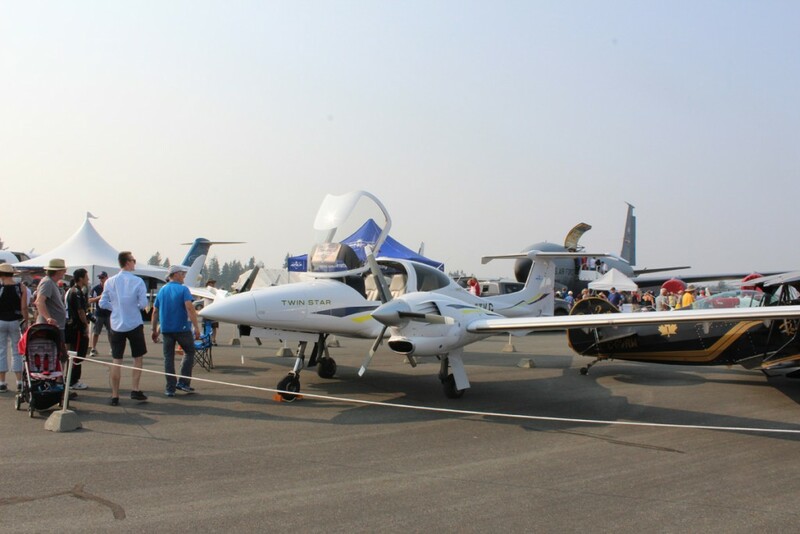 The Abbotsford International Airport is a working airport and business must go on, so there were a half dozen or so take-offs and landings during the show by commercial flights. After a stunt flight by a plane called the Jelly Belly, the U.S. Air Force demonstrated the FA-18 Super Hornet, the newest model of the premier fighter in Canada’s fleet. 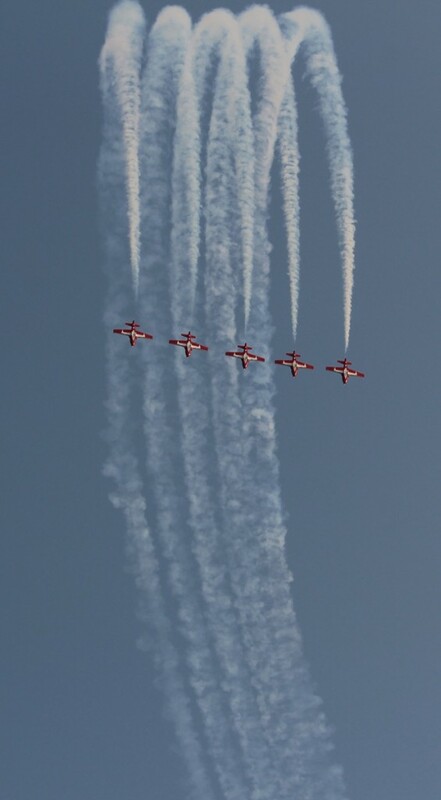 This was followed by a flight of the CF-18 decked out in a special Canada 150 paint job. It was starting to get dark by then so you couldn’t really see the colours, but I did get the bird on video. Because it was a night time show, the CF-18 dropped its tailhook on landing. Usually used to snag a catch cable on an aircraft carrier, the hook threw up a stream of sparks as it dragged behind on the pavement behind the plane. Quite a sight. CF-18 decked out in Canada 150 colours drags its tailhook behind on landing creating a colourful spray of sparks. 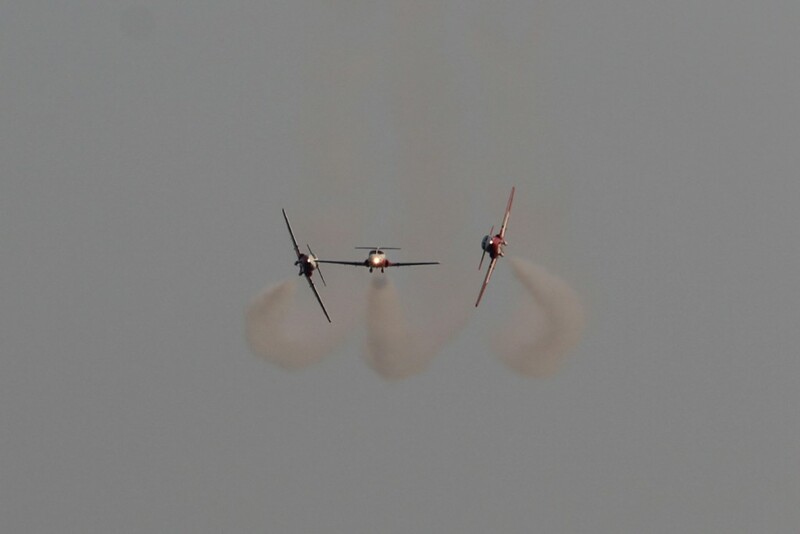 A couple of more stunt planes entertained before it got completely dark, one of them the renowned Red Bull Air Racer. I managed to get a nice video of this very maneuverable plane. 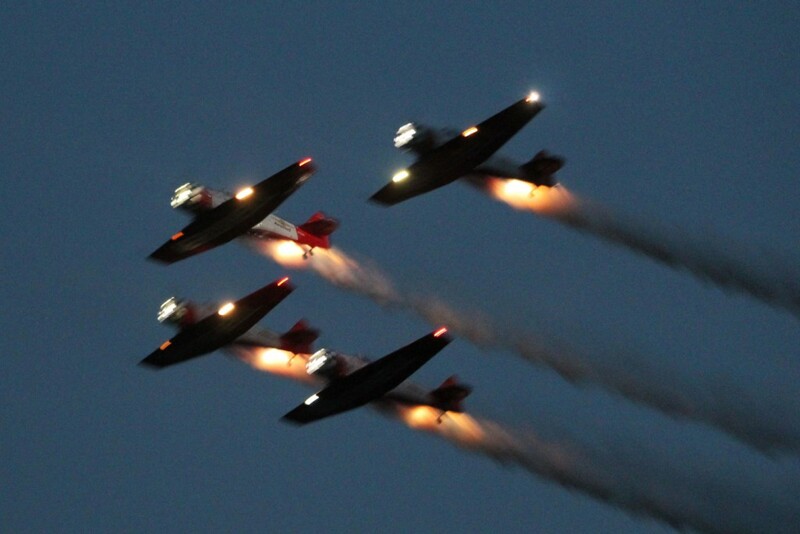 Now it was starting to get quite dark and the AeroShell Aerobatic Team took to the sky lit up by lights all around each lane. 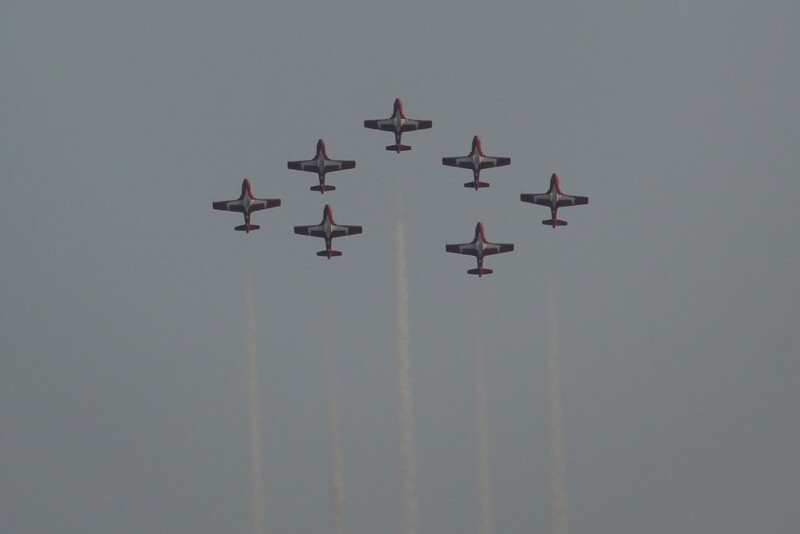 This was the debut performance of the team at the Abbotsford Airshow and they were terrific. 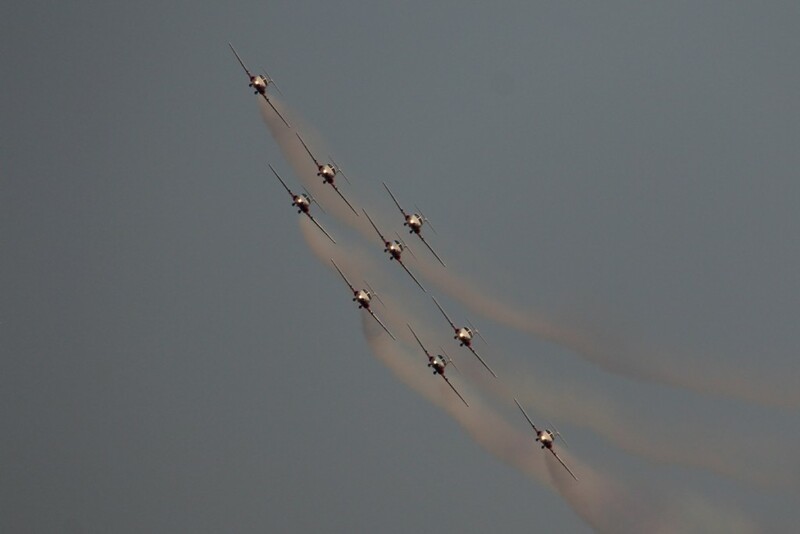 Flying in formation has to be tough in full daylight so seeing them perform in the night sky was amazing. 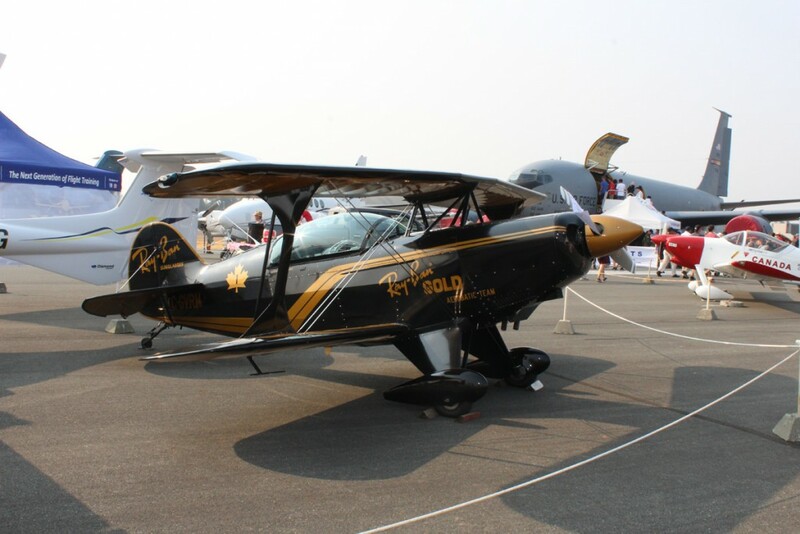 Finally complete darkness gave way to Bob Carlton and his Super Salto Jet Sailplane. 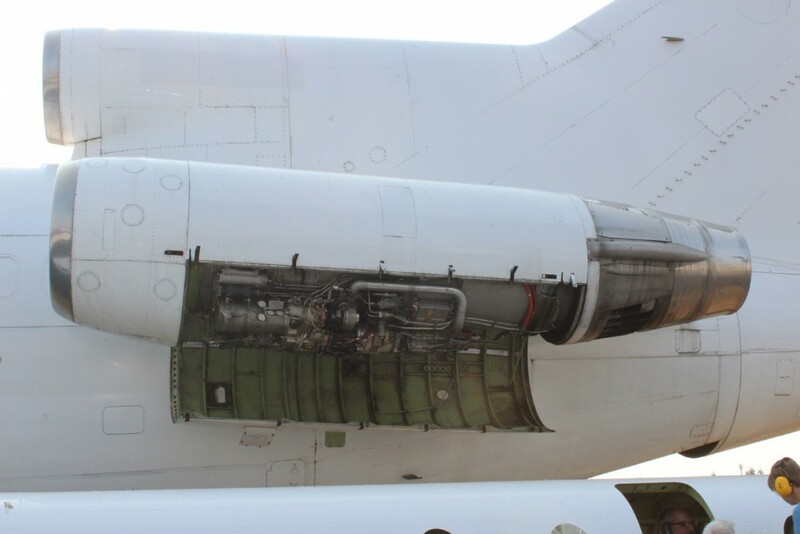 A sailplane powered by a jet engine – what a concept. Bob trailed fireworks behind him as well as launching more from the tips of his wings. My camera battery was almost dead but my wife got a video with her iPhone. This was followed by Dan Buchanan with his hang glider, also streaming fireworks. Quite a sight. 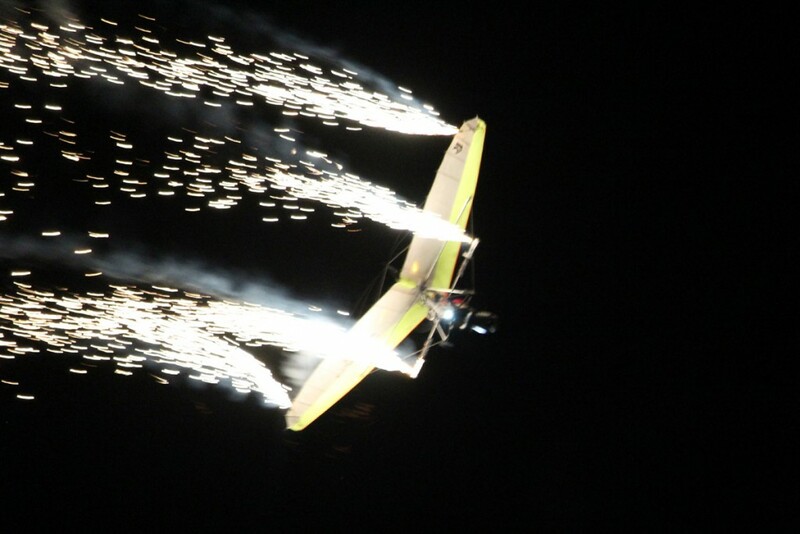 Dan Buchanan’s night time hang glider flight was a fireworks extravaganza. The evening was capped with a full fireworks show. 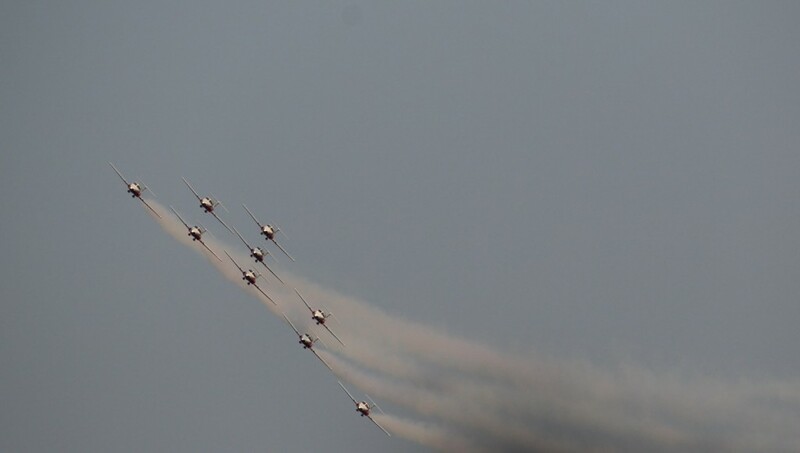 All in all, a rather different take on the airshow than the daytime event. We enjoyed it a lot. A couple of tips – it cools down considerably in the evening so bring a sweater. We were thankful we did and it was still a bit chilly. And exit where you came in. There was some disorganization when we left as there were no volunteers guiding vehicles and it was a bit of a free-for-all. Quite a traffic jam. We thought the way we came was crawling at a snail’s pace so we followed a bunch of cars going in a different direction – a bottleneck ending in a barrier. Volunteers there finally let us through, but we ended up on some back road. As Abbotsford residents, we figured out where we were, but non-residents could have become hopelessly lost. Leaving the airport was poorly organized. 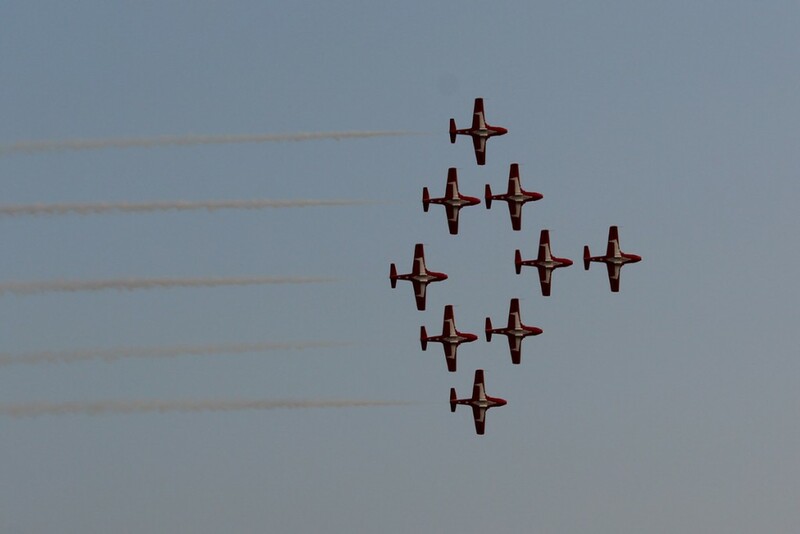 It’s something the airshow should fix for next year. Speaking of next year, the airshow returns on August 10-12 in 2018. And the U.S. Navy’s Blue Angels will be back for the show next year. Definitely worth seeing. Here are some additional photo galleries and other links. if you’re on the front page of the blog you can just scroll down, otherwise click on the links. 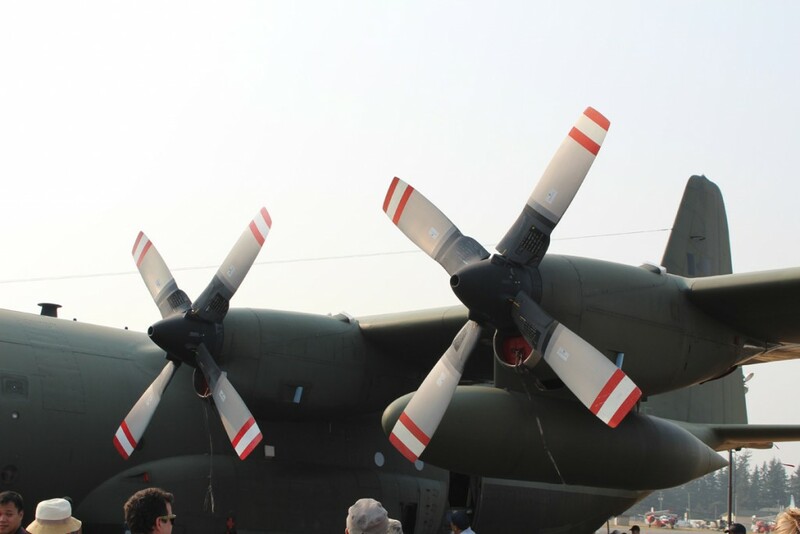 Here are additional photos of the Snowbird in action. 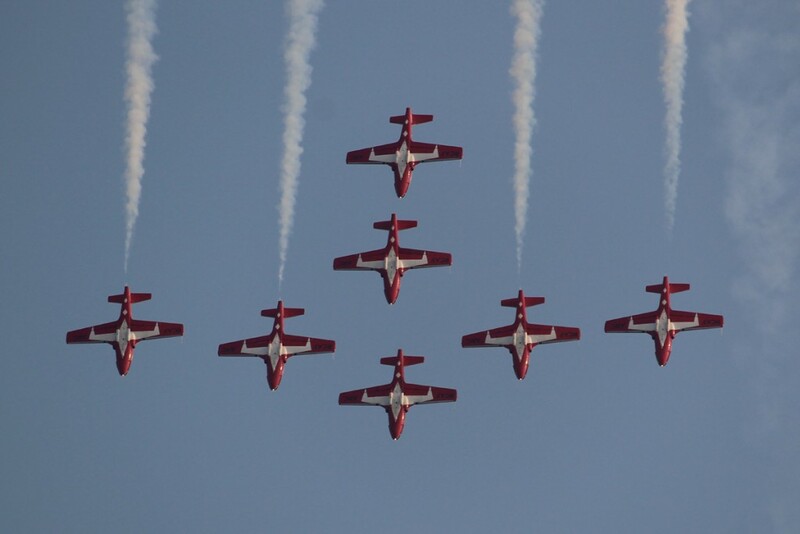 The Snowbirds make their entrance. 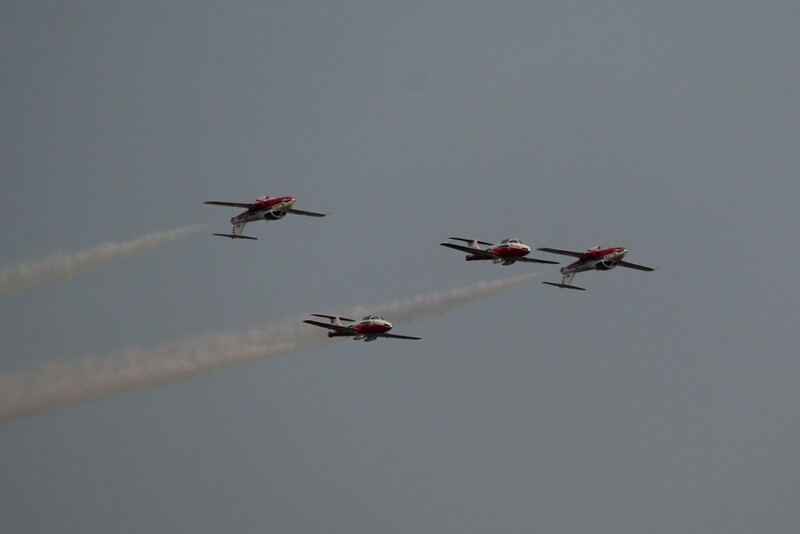 The Snowbirds were undoubtedly the highlight of the Abbotsford Airshow. Simply amazing.